Unit 3 Quiz tomorrow --> Review your study guide!! Today we took our understanding of similar triangles, scale factor, and scale drawing up a notch and applied indirect measurement. 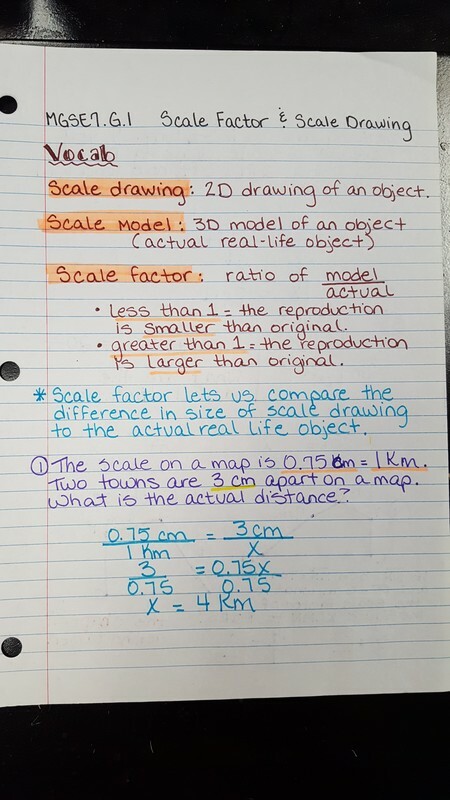 Today students took notes over scale factor and scale drawings. Tomorrow we'll begin a scale factor playground project. 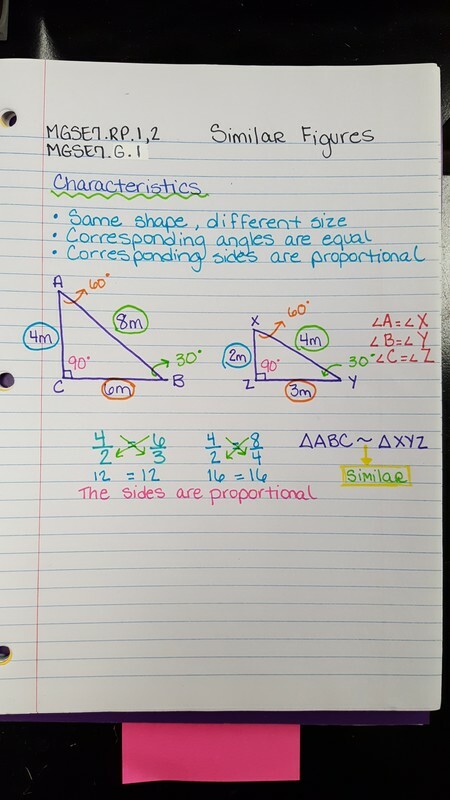 Today students finished notes over Similar figures. 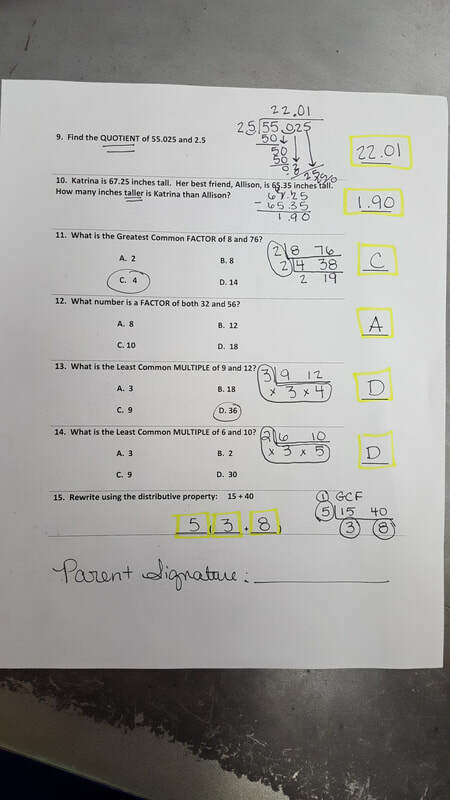 Then, they received a practice paper with 6 problems. Students will need to finish the paper at home tonight. We'll go over it tomorrow in class. 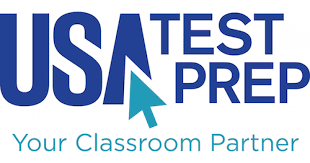 Today students received their Unit 2 tests back. 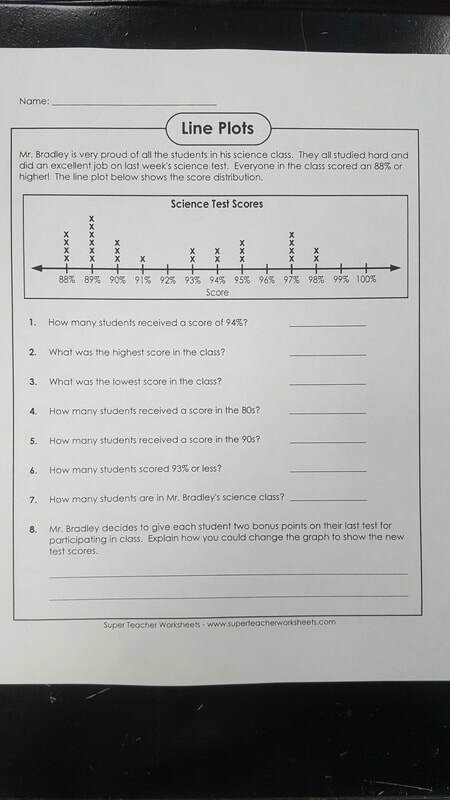 Anyone who scored below a 70 may correct it on a separate paper and turn in it back in to me by next Wednesday. Then, we moved on to Similar Figures. Today's goal was to be able to determine whether or not segments of figures were proportional in order to determine similarities. For the next several days we'll be working through a GMAS study packet. We'll also be playing several review games to recall items that we've not seen in a few months. Math day is Tuesday, May 1st. Students began their Unit 2 test on Monday and finished it up on Tuesday. There's only 2 other students who'll need to finish before the end of the week. Students received a "Study guide" packet for the Milestone's as well. 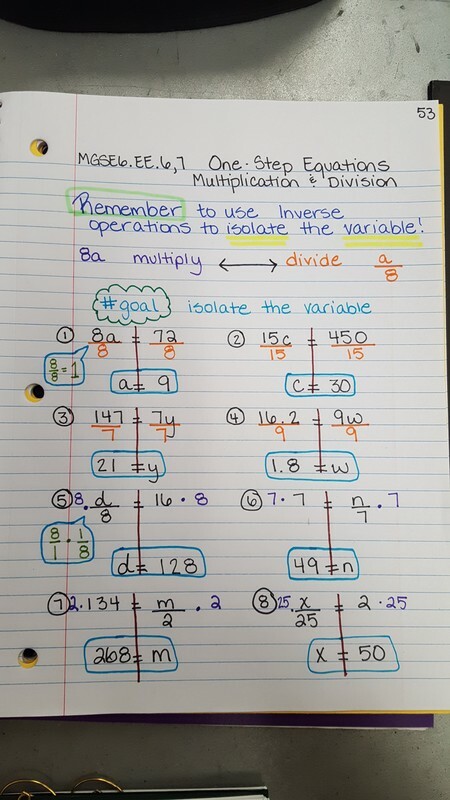 Today we finished going over two-step inequalities and then went over our Review for Monday's test. Today students reviewed solving and graphing inequalities. The only addition to what they already knew, was what to do when multiplying and dividing by negatives. Please copy the notes below before tomorrow. Tomorrow we'll review. Today students turned in their 7 problems from last night. Then, we went over tonight's weekly problems. Afterwards, students got to work with a partner or small group to solve some very complex multi-step equations around the room. It was more of a scavenger hunt. It was TOUGH! We'll continue with this tomorrow and then they'll learn how to solve two-step inequalities. Remember Weekly sheet is due in class on Friday! Key to the scavenger hunt is below! Today students were given about 3 minutes in class to work on their weekly homework sheet. Then, we moved on to solving multi-step equations with variables on both sides. Everyone seemed to do very well with this concept. Students have 7 problems to complete tonight. If they don't quite finish at home I plan to give them 5 minutes of class time to finish and then we're checking in class. Today students received their weekly homework sheet. 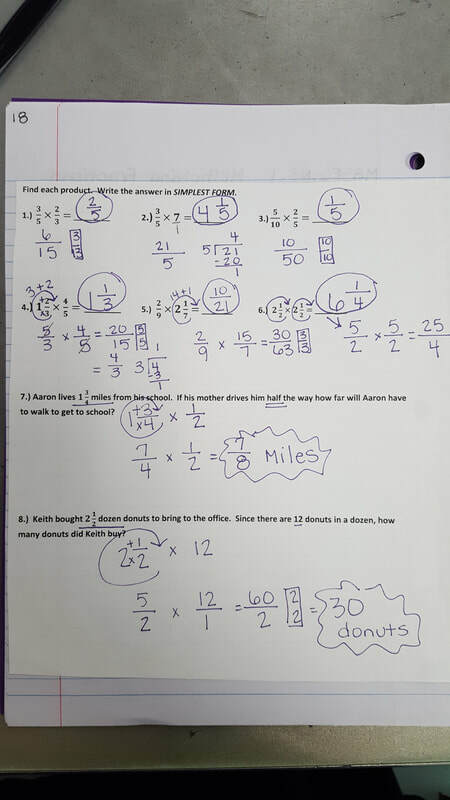 Then, they were given 12 minutes of class time to complete the "Multi-step equations (distributing)" paper from Friday. 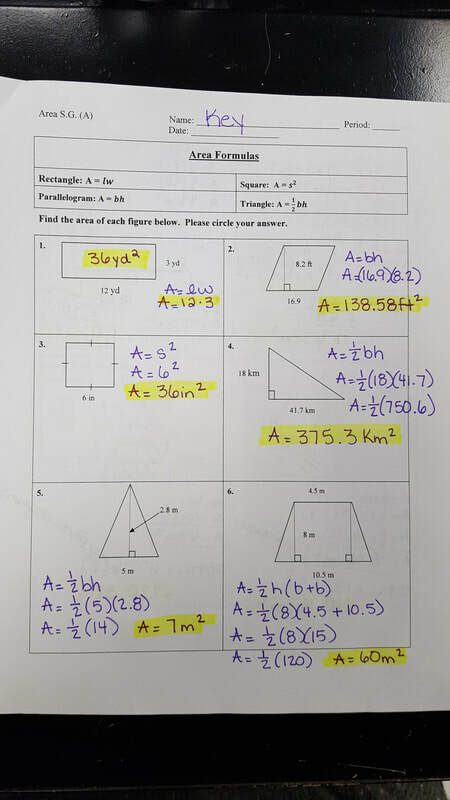 Those who finished early could work through this weeks homework sheet. Afterwards, I went over #1 and #2 on the distributing sheet to go over potential errors. The sheet was due by the end of class. Then, we barely had time to begin notes over Equations with variables on both sides. Today students turned in their weekly homework sheet and we checked it in class. 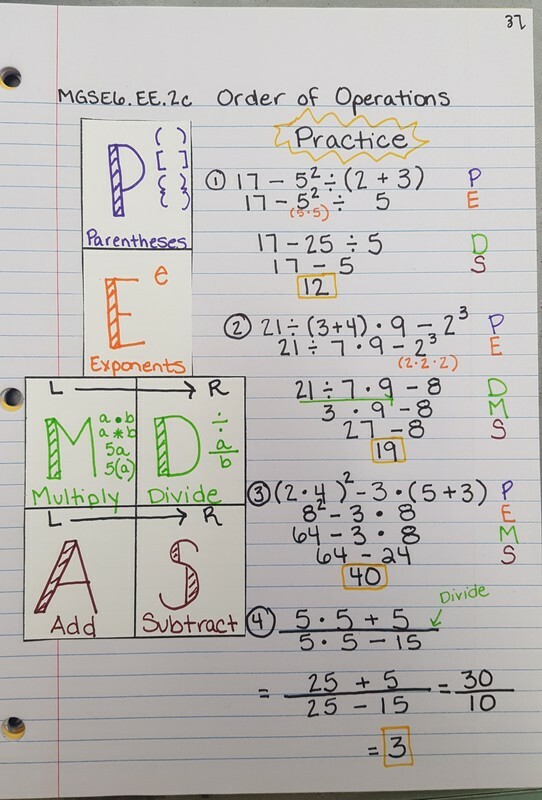 Then, students worked through a "Multi-step distributing" sheet. I will give them about 12 minutes of class time on Monday to finish this and begin on next weeks weekly sheet. Today students turned in their weekly homework sheet. 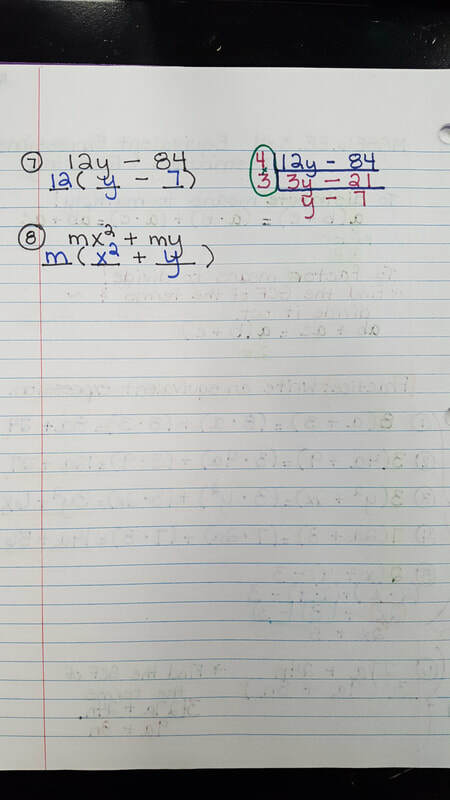 Then, I took up the "Multi-step equations with combining like terms" paper for a grade. I'll grade these this weekend and give back on Monday. We'll review them in class on Monday. 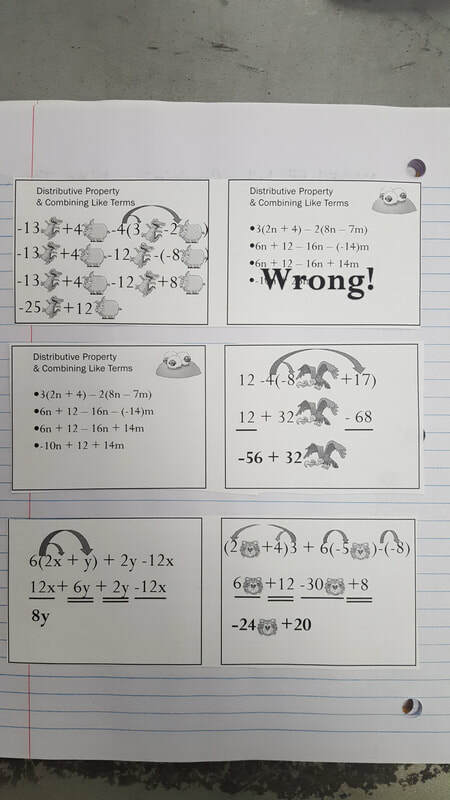 Then, we moved on to learning how to solve multi-step equations that involve the distributive property. This can be a bit tricky. Today we worked 3 examples before lunch. We'll work a few more tomorrow and practice what we've learned. Today students turned in their Adventure. Then, we reviewed multi-step problems with combining like terms through a few interactive whiteboard problems. 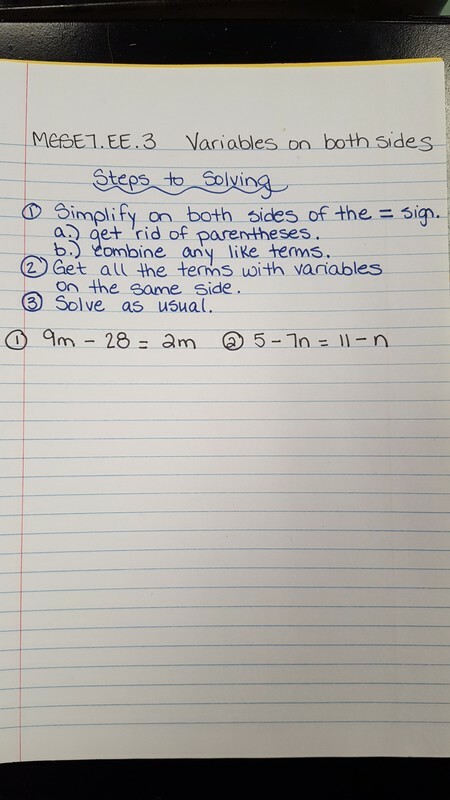 Afterwards, students had class time to work on their "Multi-step equations (combining like terms)" sheet. This will be due in class tomorrow. Today students turned in their homework from last night. Then, we quickly reviewed combining like terms from a few weeks ago. 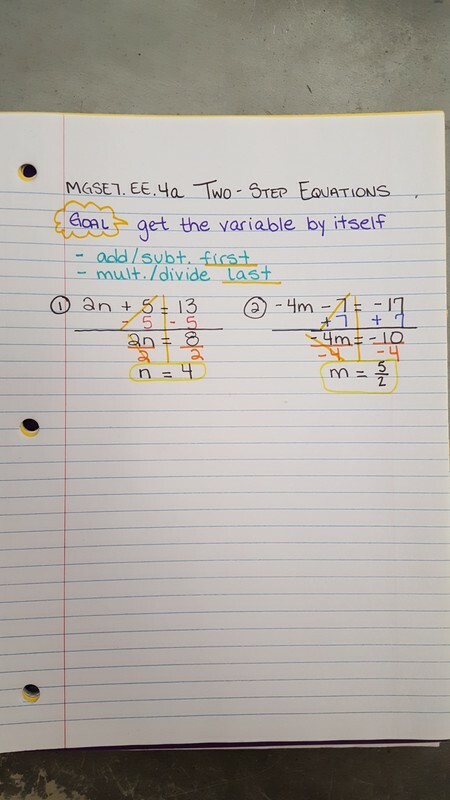 This led us into multi-step equations w/ combining like terms. Homework tonight: Finish Adventure & work on weekly sheet. Today, students were given a good 15 minutes of class time to complete the Adventure. A few did not finish & I made the due date this Wednesday. Then, we moved on to this weeks weekly homework sheet. 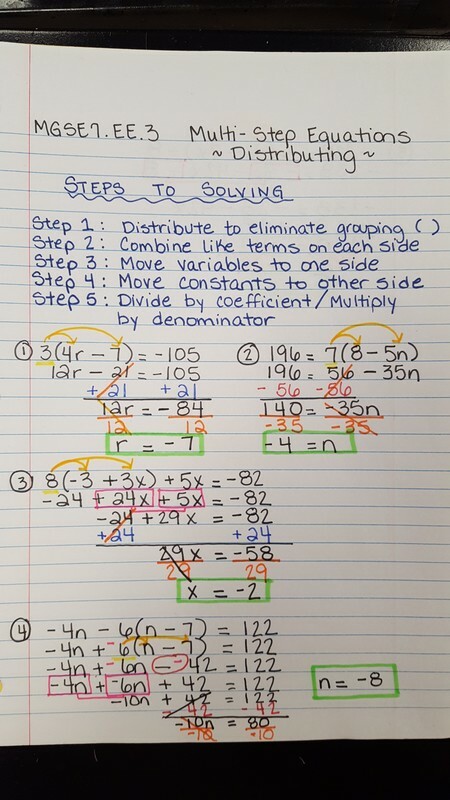 Students also have homework tonight over two-step equations. They are to pick any 15 problems and complete them. Today, we finished notes over two-step equations. Then, students got to pick a partner and go on a two-step equation Adventure! Today students turned in their homework from the break. There were 3 students in class today that did not finish their homework. Then, students participated in an in-class Quizizz live! The class average was 80%. This Quizizz was over One-Step Equations (6th & 7th grade standards). Afterwards, we moved on to two-step equations. See brief notes and video below. Today we took time to go over last night's assignment to check for clarity. 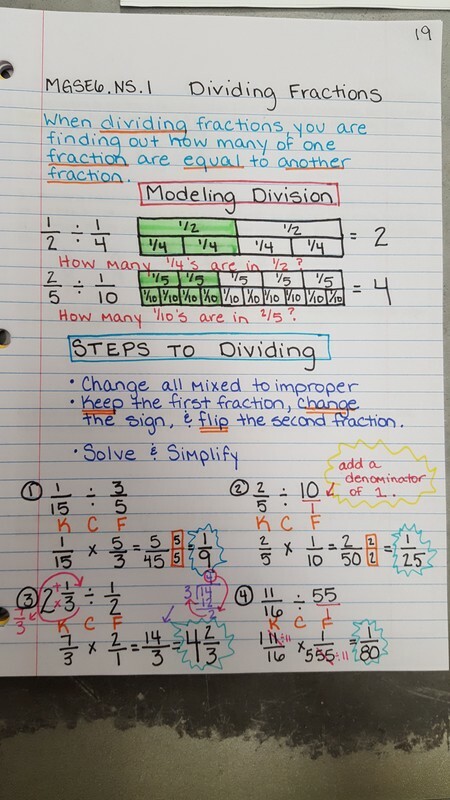 Then, we reviewed simple one-step equations with multiplying and dividing. Afterwards, students were given time to come a few at a time and play around with the new "ClearSonic" touch panel. 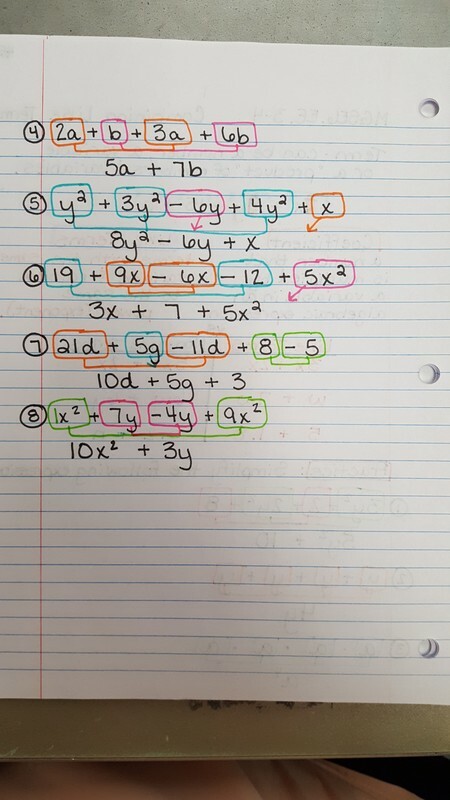 Homework over the break--> Please complete 10 problems on the back of the One-step equations sheet. Either the evens or the Odds. Today students turned in their combining like terms practice from yesterday. Then, we reviewed solving one-step equations. 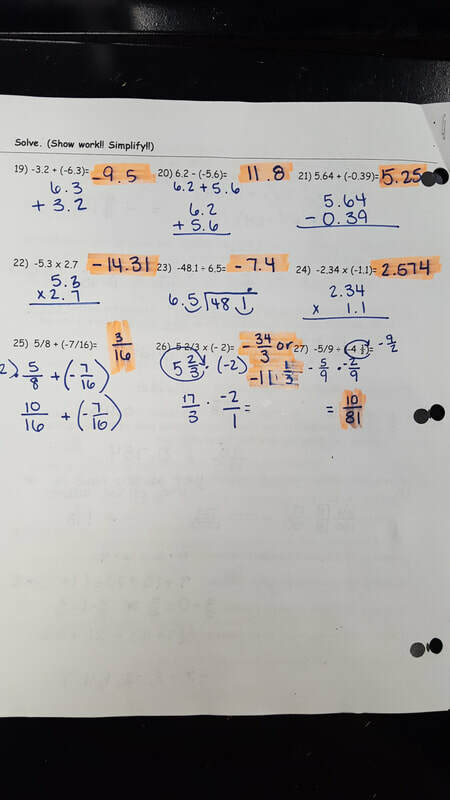 After a two problem simple review I added negatives into the mix. Students were able to come to the NEW interactive board and work the problems out. They did a wonderful job with these! Then, we took notes over one-step equations with negatives. Today we were only able to cover addition and subtraction. 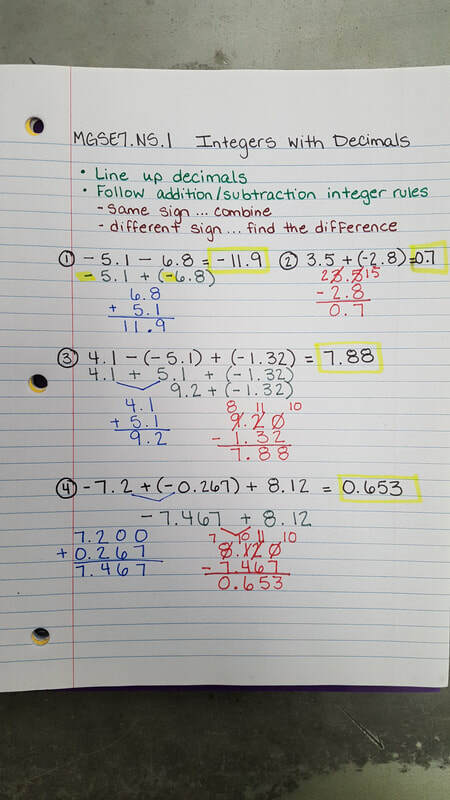 Today we continued working with combining like terms, factoring, and distributing with negatives. We worked through several problems in class. Students were then given about 15 minutes to work with a partner on a practice paper. The practice paper is due in class tomorrow. Today students were given the opportunity to finish their test from Friday. Then, we reviewed the powerpoint found to the right. 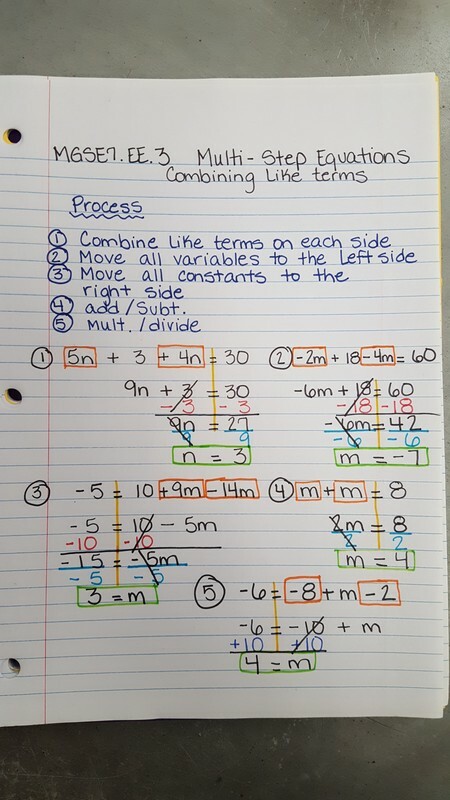 Afterwards, students were given a combining like terms practice sheet. Tomorrow we'll finish the practice and continue reviewing combining like terms. Today students took their 7th grade Unit 1 Test. Many did not finish and will be given class time on Monday to complete it. I wanted everyone to be sure and take as much time as they needed to. Today we worked through the Review for tomorrow's test. Students will get to use a calculator on the test tomorrow. Also, the weekly homework sheet will be due after the test. Today we reviewed the weekly homework sheet. Then, we reviewed mathematical properties. 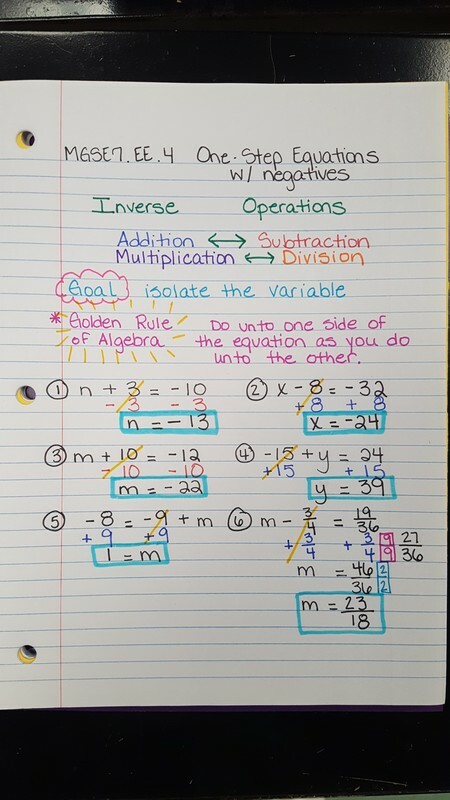 The distributive property was the main focus. Today we reviewed Monday & Tuesday's weekly homework sheet. 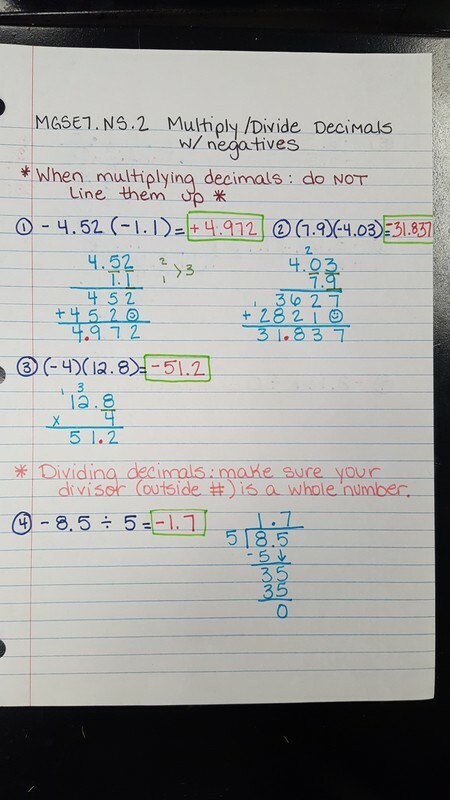 Then, we checked the multiplication/division of decimals with negatives homework from last night. Today students learned how to multiply and divide fractions with negatives. 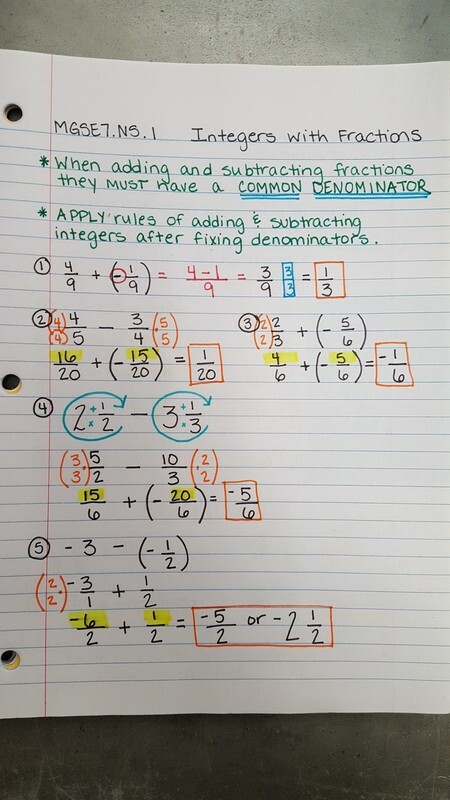 This was just a simple review of multiplying and dividing fractions with the addition of the integer rules. 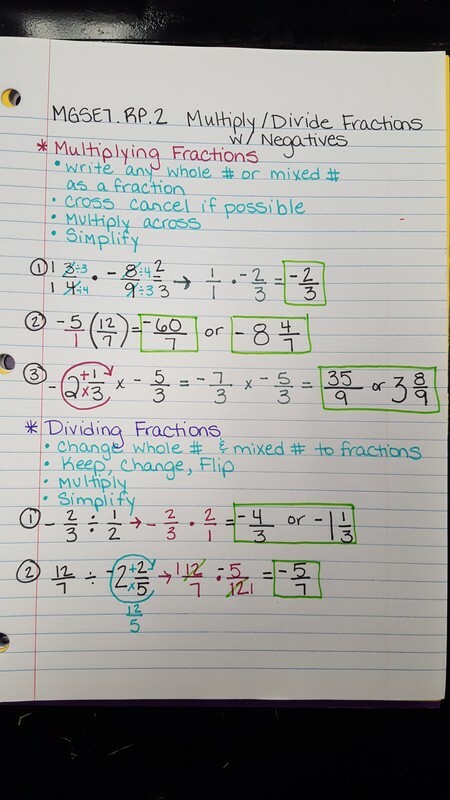 Please complete #1-5 and #11-15 of the Multiplying/Dividing Fractions sheet for homework tonight. Today we quickly reviewed last Thursday and Friday's content. Students also received their paper from Thursday back. Many did not show work. Please correct the paper and turn it in tomorrow. Then, we moved on to multiplying/dividing decimals with negatives. See notes below. 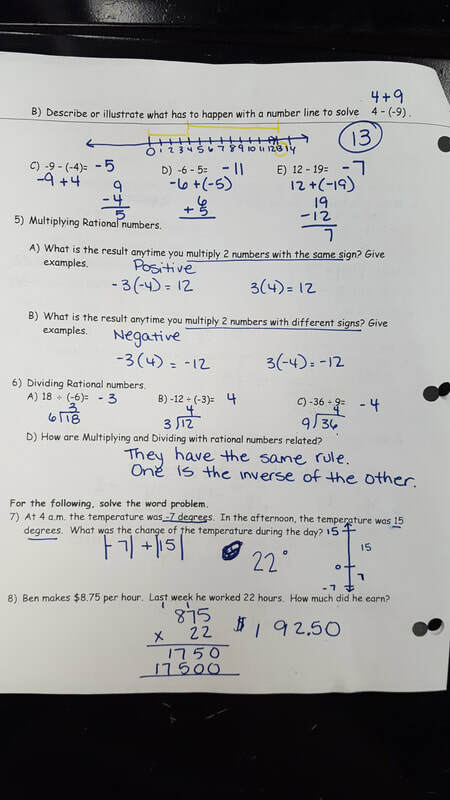 Please complete the multiplying/dividing decimals side of the practice paper tonight. We'll grade it in class tomorrow. Today we checked the decimal paper from yesterday. Then, I answered any weekly homework questions. Afterwards, we took notes over adding & subtracting fractions. 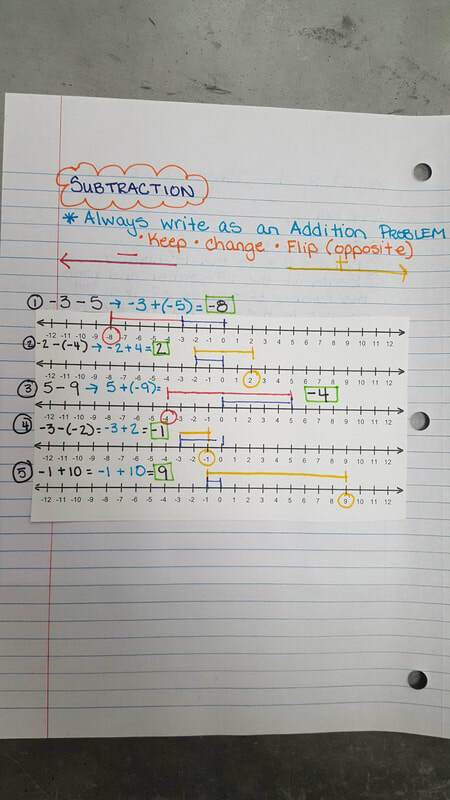 Students were given a paper over adding and subtracting fractions that Mr. Denton will go over with them tomorrow. 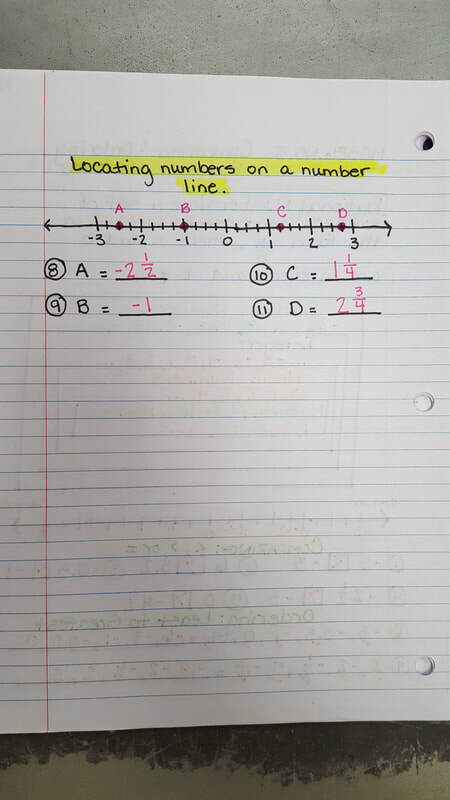 Today we checked the number line problems from last night. Then, students were able to ask questions over Tuesday night's weekly assignment. 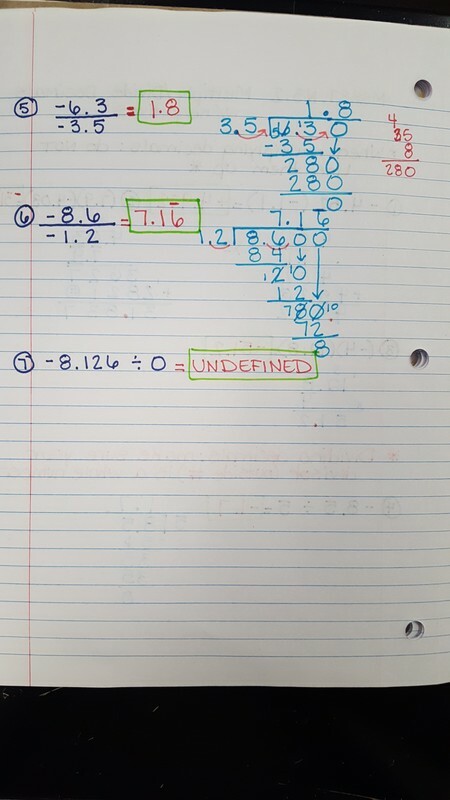 Then, we moved on to Integers with decimals. 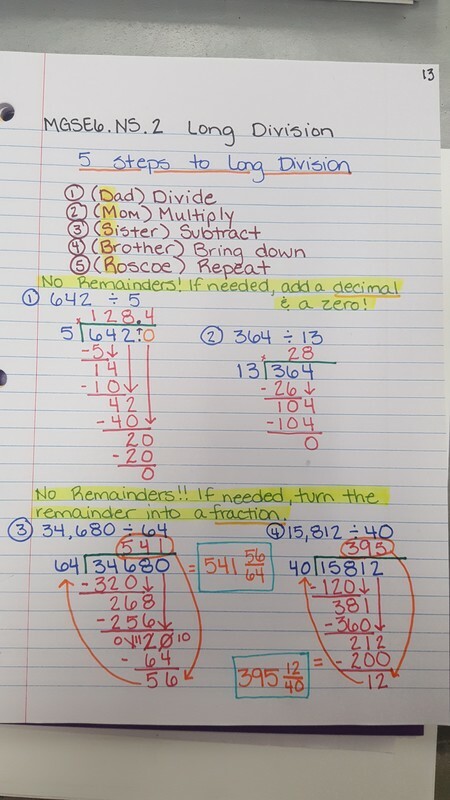 Basically, I reminded students of how to add and subtract decimals. The only thing we changed was the application of integers. We worked four examples together and then students were able to begin on their independent assignment. Today students received their weekly homework sheet. We reviewed Monday night's assignment in class and students were given time to ask questions. 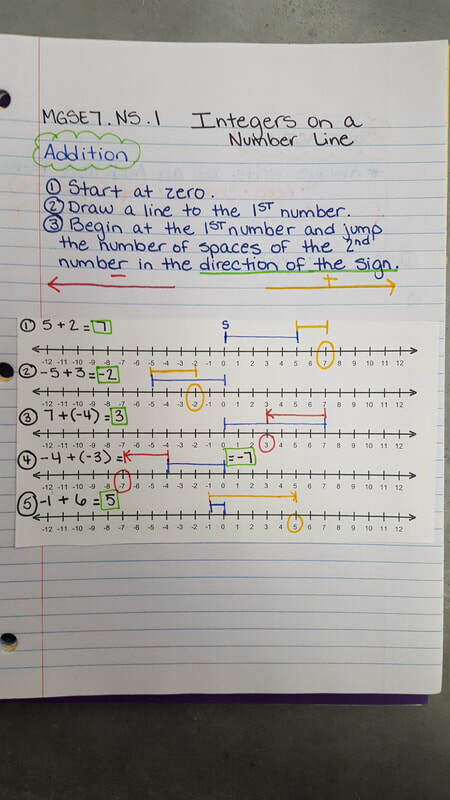 Then, students learned how to add/subtract integers using a number line. Surprisingly, many found this easier than the colored counters. 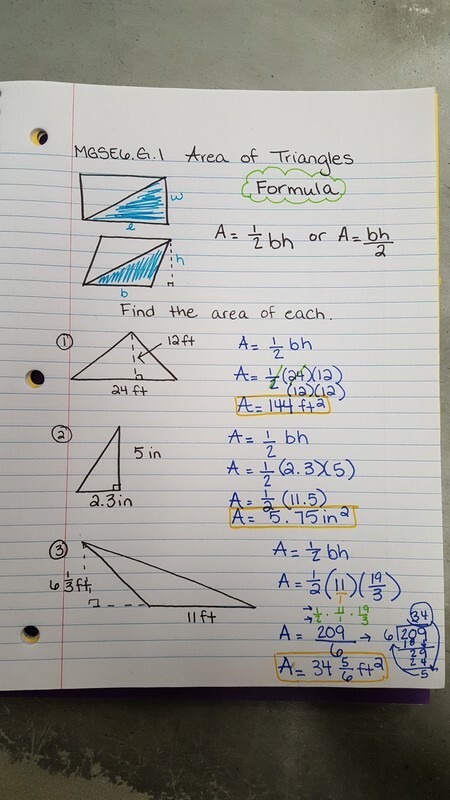 Students are to complete the front side #13 - 17 of a practice paper for additional homework tonight. Today students turned in their weekly homework sheets. Then, they used the remainder of our abbreviated class time to work on a practice sheet that involved expressions with integers. The "coloring" side of the sheet is due on Monday. Today we reviewed our weekly homework sheet before students turn it in tomorrow. 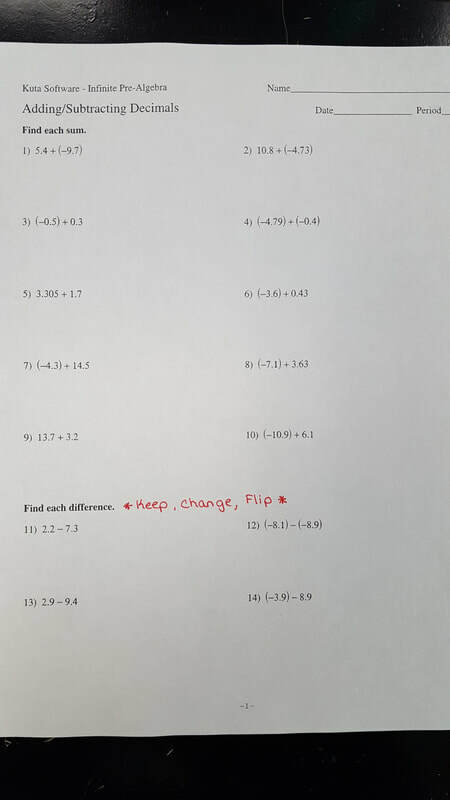 Then, we checked the Addition of Integers sheet from yesterday. Several students got all the problems correct!!! Then, we learned how to subtract integers. The key is...we DON'T subtract! 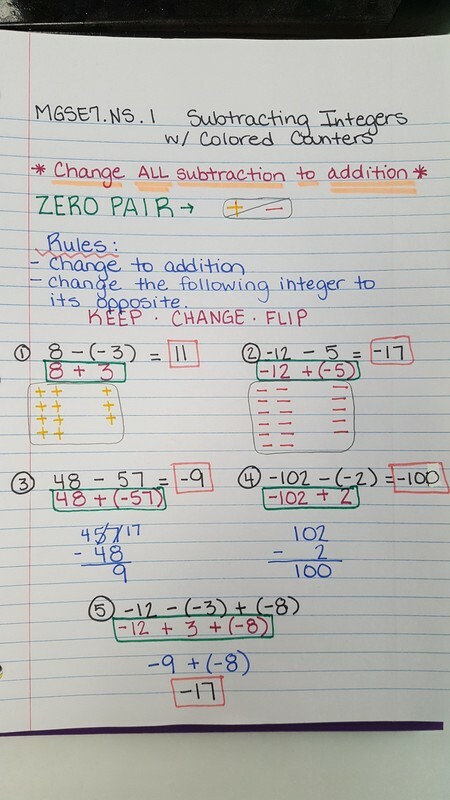 We change subtraction to addition and change the second integer to its opposite. See notes below. Today students learned how to use 2-colored counters to add negative and positive numbers. See notes below. Then, we practiced what we'd learned. Those who didn't finish the practice in class need to finish for homework tonight. 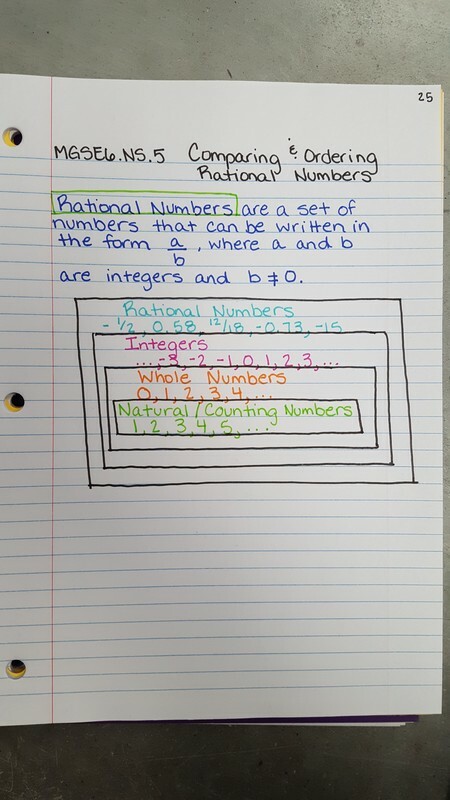 Today we reviewed Real Numbers which include rational and irrational numbers. Often times students have a difficult time telling the difference between the two. Then, we reviewed Absolute Value, opposites, and zero pairs. 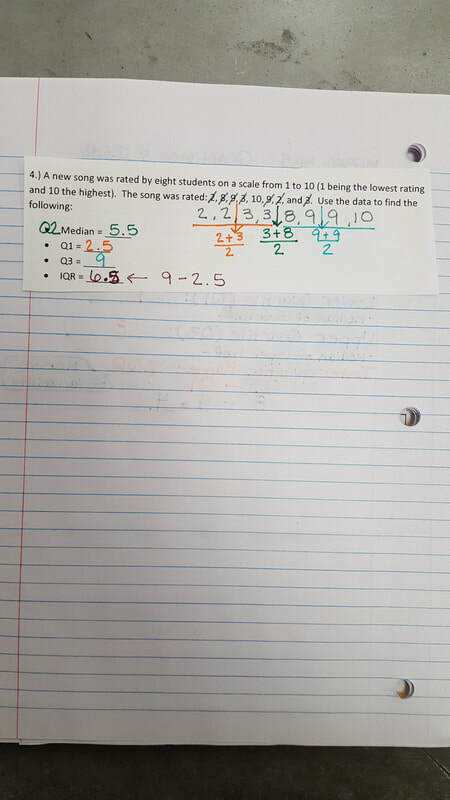 We also quickly reviewed comparing and ordering rational numbers. Today we reviewed our Statistics Study guide and then students took their Test. I'll get them graded once everyone has finished taking theirs. Students also received their weekly homework sheet and used the remainder of class time to work on it. Today we quickly checked our weekly homework. Then, we reviewed the multiple choice (IQR) sheet from last night. 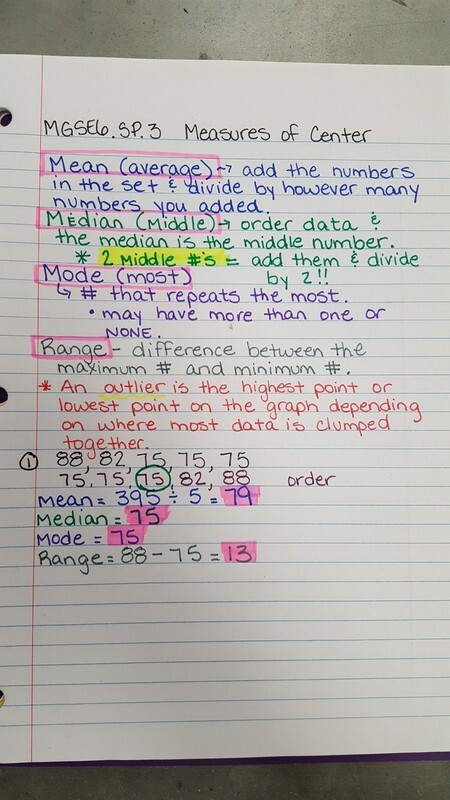 Afterwards, students were given their Statistics review and worked on it for the remainder of class. The key is posted below. We'll be go over the review Monday prior to taking the test. Today we finished our notes over Box Plots. Then, we talked about Box Plots and their aspects. Students are to do #1-3, #5-7 on the multiple choice sheet tonight. 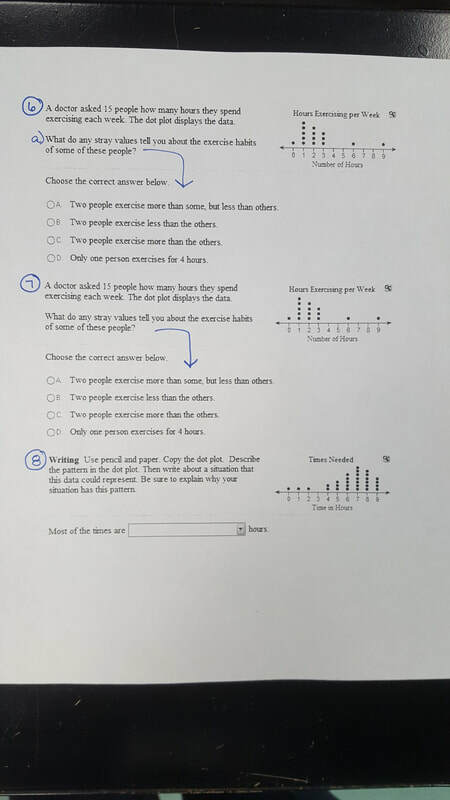 Today we reviewed the Histograms packet and then practiced finding Quartiles. 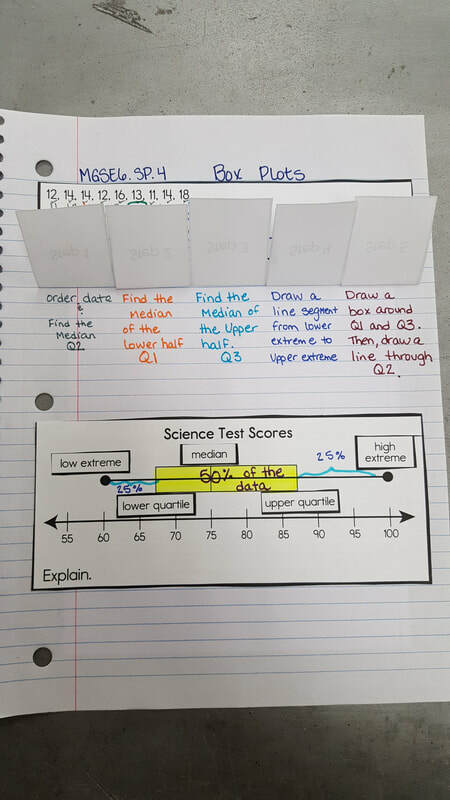 Students also had time to glue in their Box Plot notes. Tomorrow we'll make BOX PLOTS!! YAY! Today we reviewed our Line and Dot plot packets. 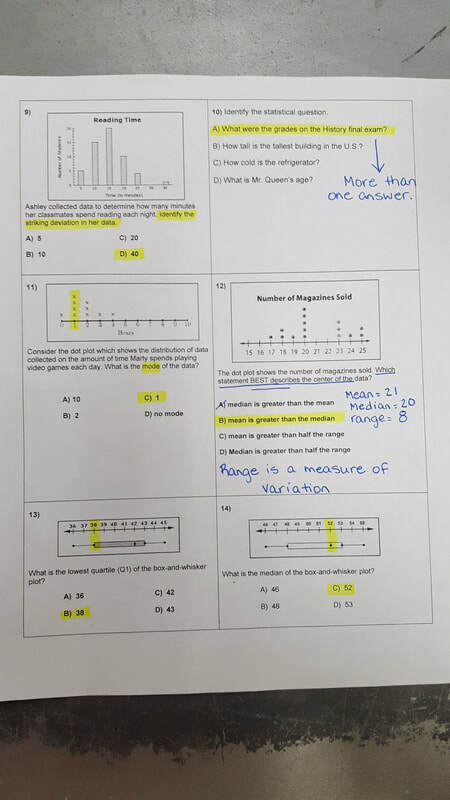 Then, students received 10 minutes to complete the Histograms packet from yesterday. We'll go over the histograms packet tomorrow. Then, we watched about half of the video below and moved on to learning about Quartiles. 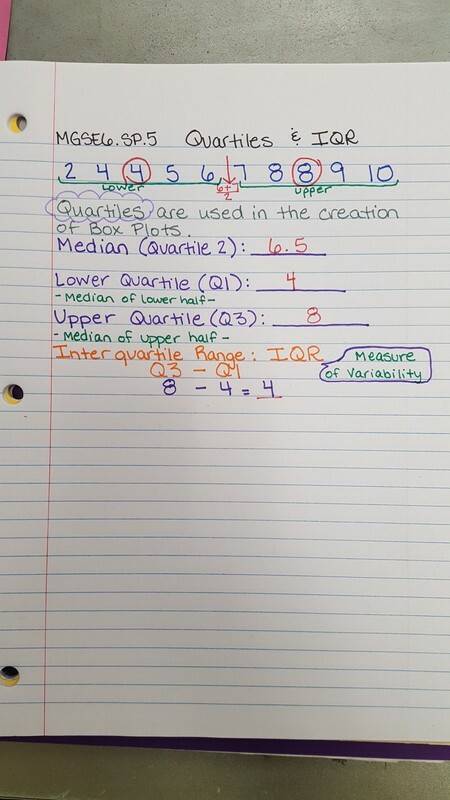 After we review our Histograms tomorrow we'll then finish quartiles and learn how to create a box plot. Today students had to complete a brief NOTES CHECK. Then, they had time to work on their weekly homework sheet. Afterwards, they were given the Histogram's packet from Friday. 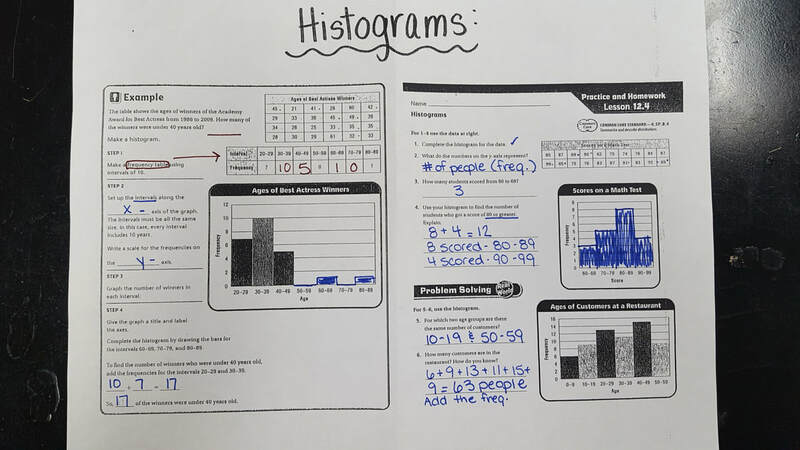 Friday we ran short of time in class and had to finish Histograms today. Tomorrow students will have 10 minutes to finish up the histogram packet and then we're moving on to Quartiles. 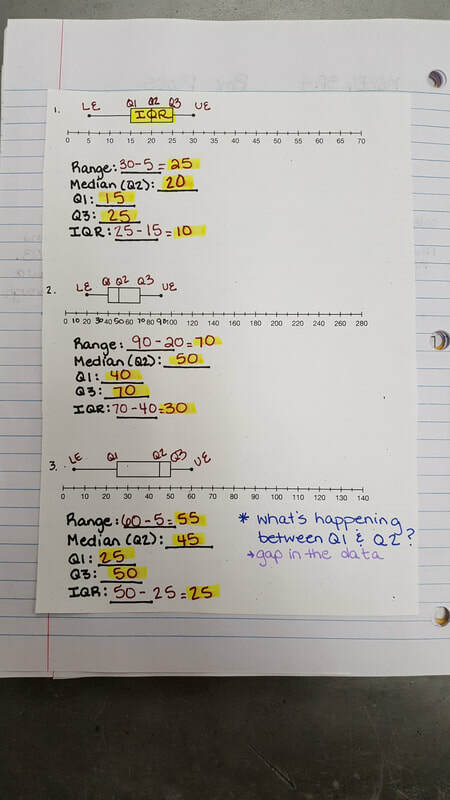 On Monday, we'll recap line plots, dot plots, and histograms before moving on toward quartiles. 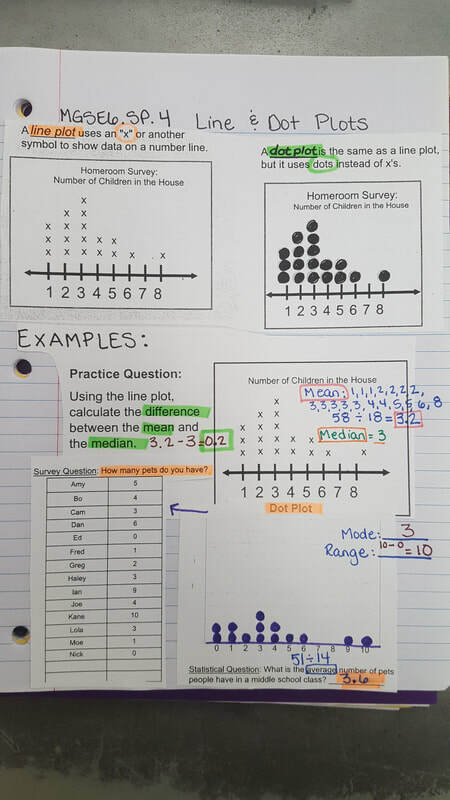 Today we finished up our notes over Line and Dot plots after going over Thursday night's homework. 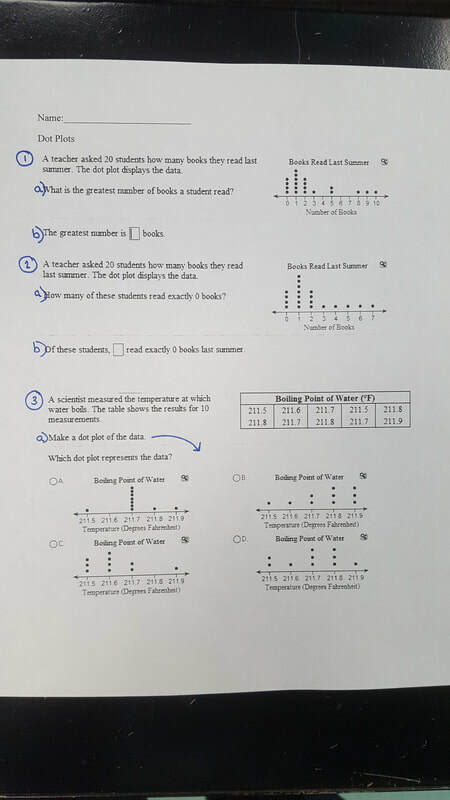 Then, students received a very in-depth packet covering line and dot plots. They began working through their packets with a partner of their choice, but only had about 6 minutes before lunch. Tomorrow we'll finish up the packet after we grade homework. 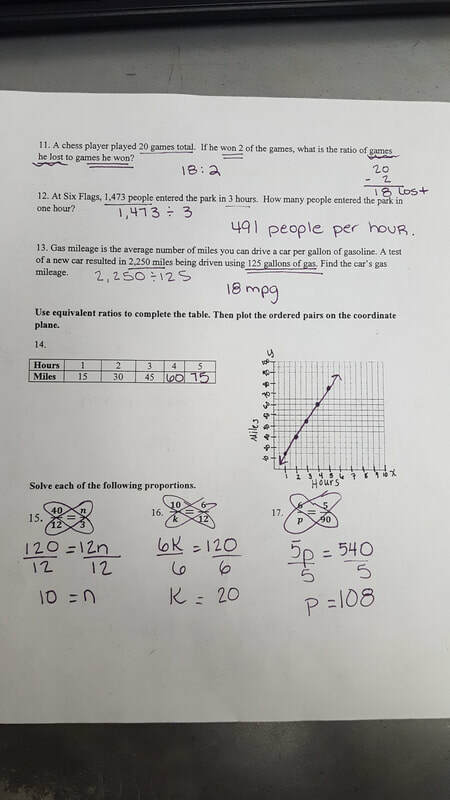 Today we reviewed mean, median, mode, and range problems from yesterday. Then, we moved on to Line and Dot plots. We only had time to paste our notes in and begin to talk about them. 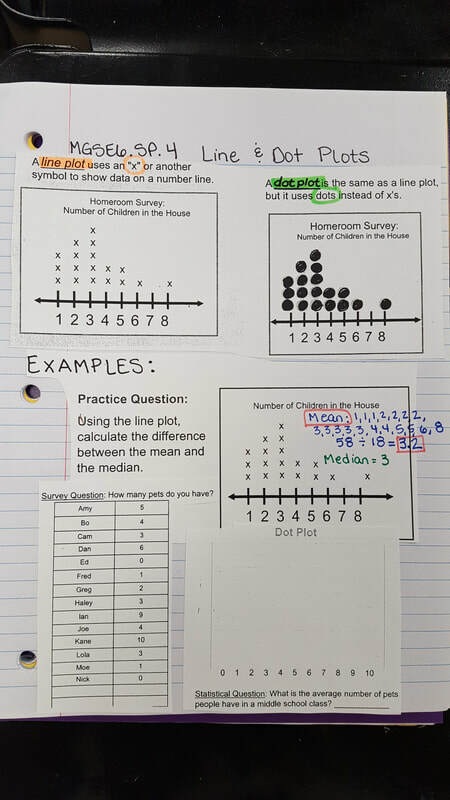 Tomorrow we'll finish up with Line & Dot plots then move on to Histograms. Homework: Work on your weekly sheet...it's due on Friday! Today we continued learning about mean, median, mode, & range. 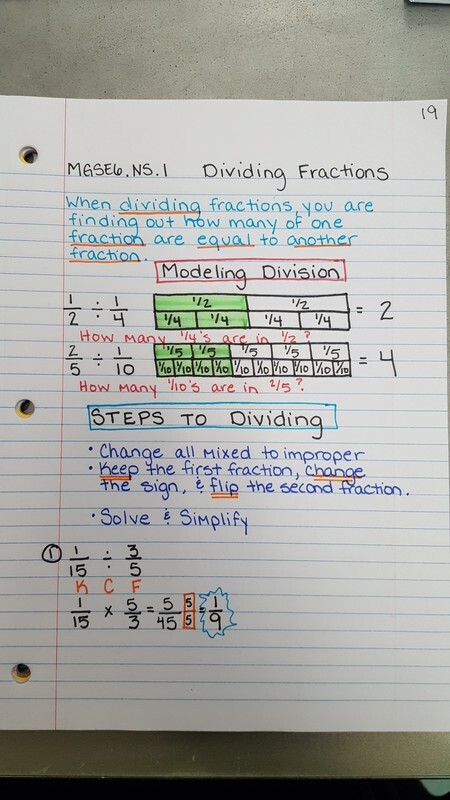 Students completed one more example in their notes and then moved on to a practice sheet. 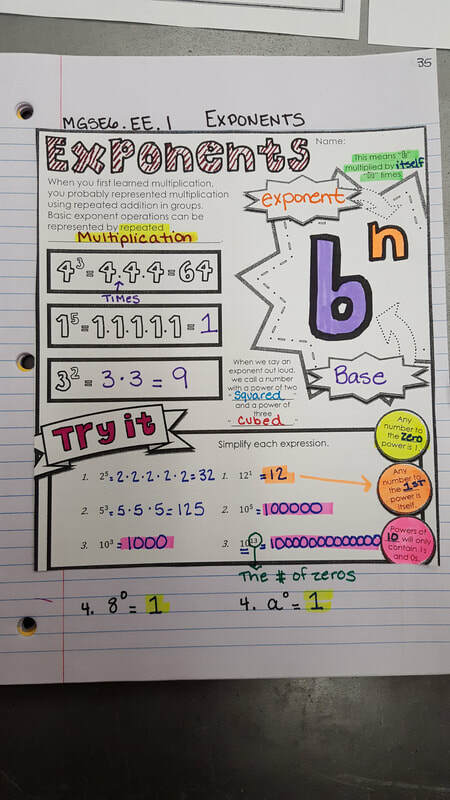 The practice sheet is more examples for their notebook, but they got to work with a partner in class. Please have the paper completed when you come in tomorrow. We'll quickly review & then staple in our notebooks. 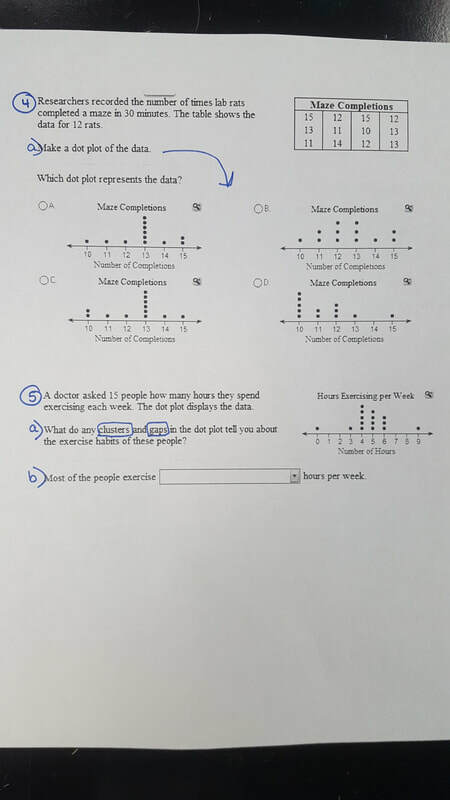 Today students answered the question posed to them on Friday, "What is a statistical Question?". 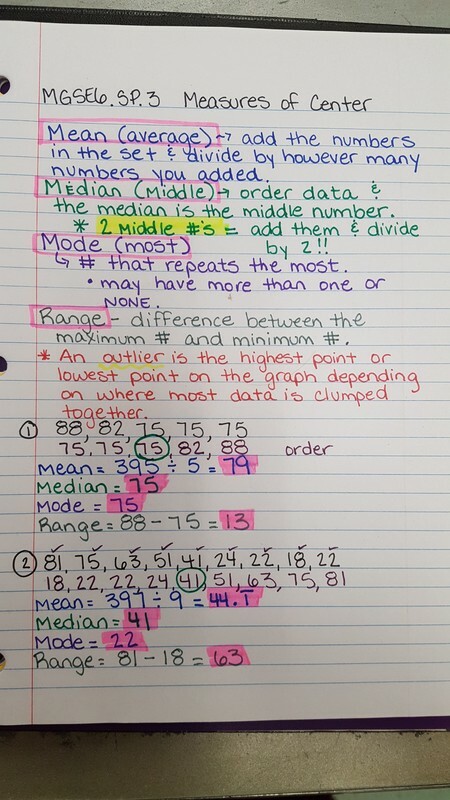 Then, we moved on to Measures of Central Tendency (mean, median, mode, & range). We'll continue working on these tomorrow. Today we reviewed Tuesday night's homework problems. 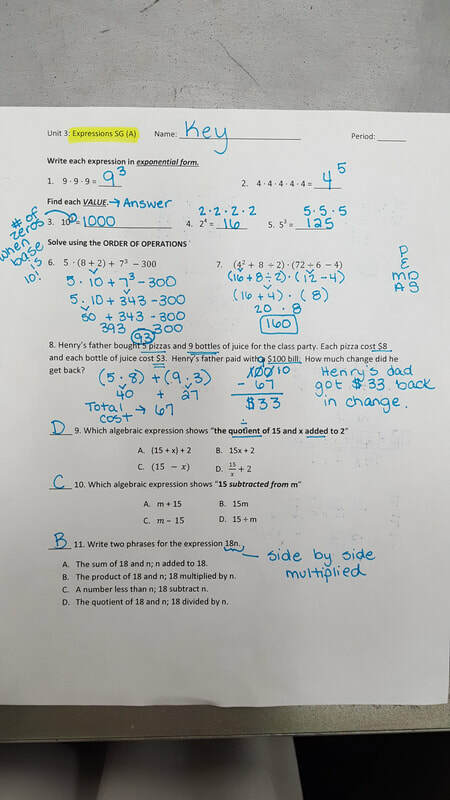 Then, we solved #1 on the practice paper that was sent home last night over Volume. Afterwards, we added 2 more examples to our notes. 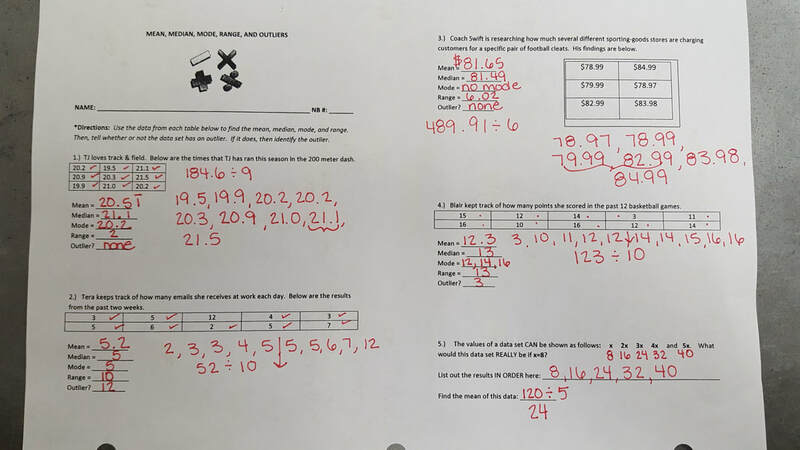 Then, students worked with a partner to finish the practice sheet from last night and look over and try to solve a "Lesson Practice" from today. I want their opinion on the Lesson Practice. Today students received their Weekly homework sheets along with several graded papers. My grades are due for Progress Reports very very soon. Many students are still missing assignments due to absences. If you've been absent, please get your work turned in. Then, we reviewed the 2 problems students were supposed to complete over the weekend. I was VERY proud of those that completed the problems. They did such a great job!!! Afterwards, we moved on to Volume. Students watched a brief "BrainPop" video over Volume. Below I posted a few Volume videos that you may watch at home. Then, we began notes. 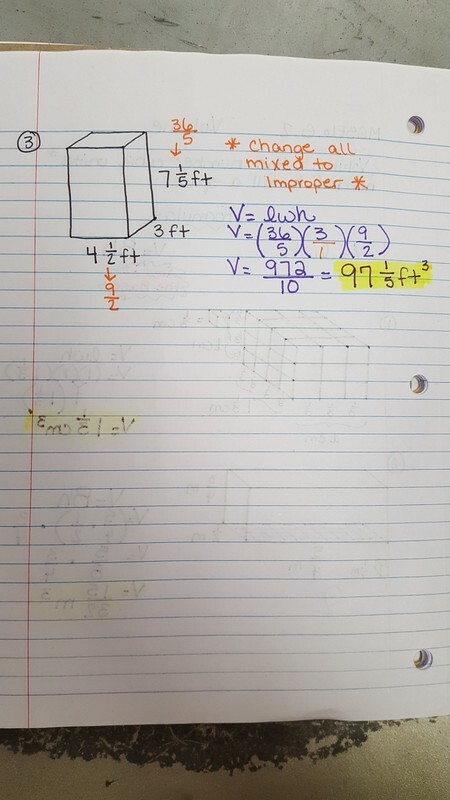 The key to volume in 6th grade is that students should be able to find the volume of a right rectangular prism with fractional edge lengths. I know not everyone is thrilled with "fractional edge lengths", but we must overcome our fear of fractions. Students are bringing home a practice paper. They're to TRY to complete #1. Just #1! Today class was a bit hectic. We began by checking our weekly homework. Then, Mr. Hamby was helping me with several technical issues. He had to spend the rest of our class period working on my computer. Therefore, everything was a bit old school today...all whiteboard content. 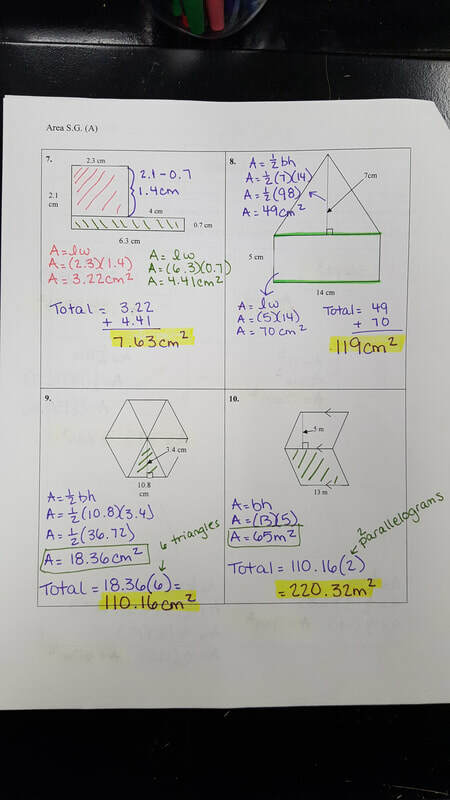 :-) We reviewed all the problems from last nights assignment...#3 & #4 and then students completed the back of the surface area sheet. We were able to check and go over them before the end of class. Due to not having quite enough class time students will be bringing a packet home with them. They are to complete #2 & #4 of the packet. Just those 2 numbers are to be completed. We'll quickly go over them on Monday & then proceed to Volume. Today we continued investigating Surface Area. 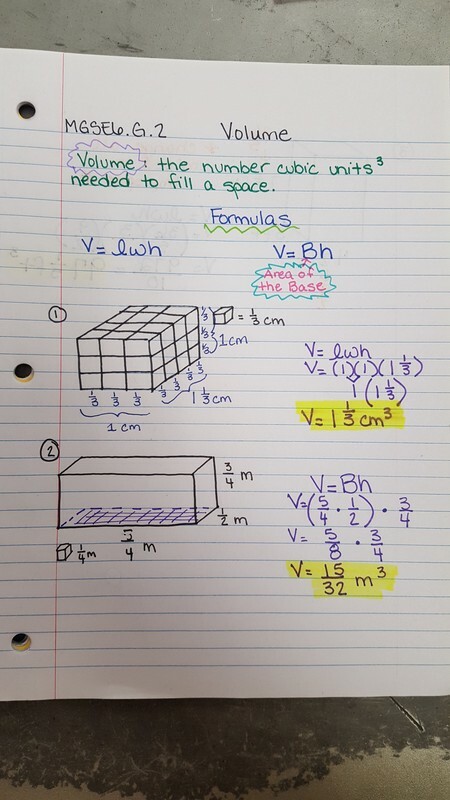 We went over #1 & 2 from last night, finished notes, and then found surface area of the rectangular prisms students brought in. Homework sheets are due tomorrow. Also have #3 & 4 from last night's sheet finished. Today students continued investigating surface area of prisms. We wrapped up our discussion of hands-on surface area of triangular prisms. 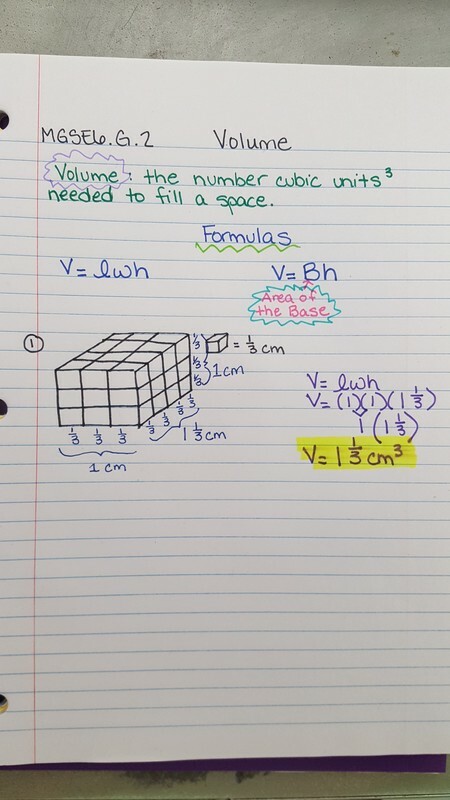 Then, we took notes over surface area of rectangular prisms and cubes. Students are to complete #1 and #2 on a paper that was sent home. Just try your best! Today we reviewed our 3D shapes and nets practice paper. Then, we stapled it into our notebooks. 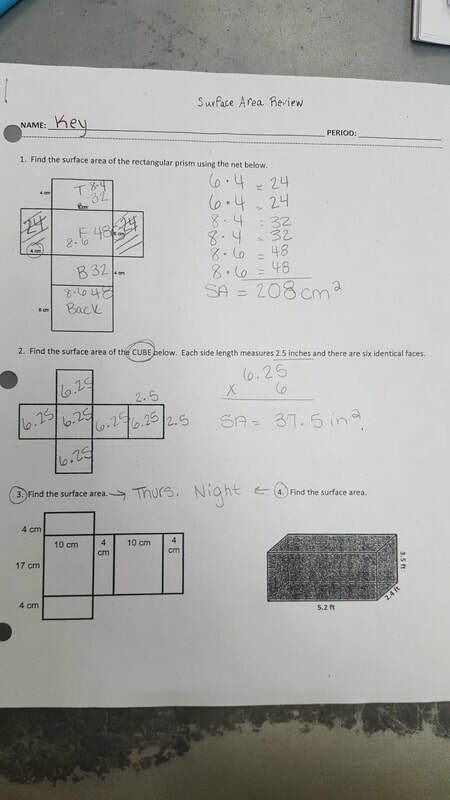 Afterwards, we began discussing Surface Area. I presented students with a life-size model of a cube, rectangular prism, & triangular prism...all of which were wrapped. Together we investigated how we'd find the area of their surface. Today students learned about 3D shapes and their nets. We quickly reviewed the shapes they already knew and then went over faces, edges, & vertices. 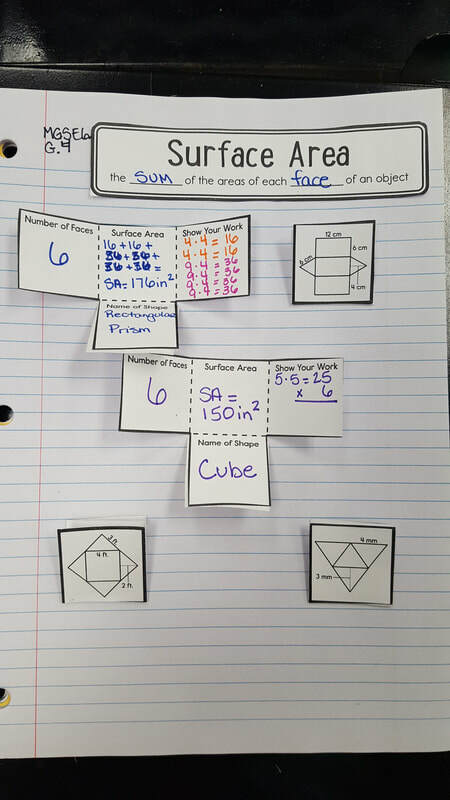 Afterwards, students got into groups of 4 or 5 complete a task where they were required to label 3D shapes, identify the the number of faces, edges, & vertices. A few did not manage to finish. They should finish tonight for homework. Use the additional information to the side (powerpoint & video) to help yourself with the task. The above file will allow you to print and create your own 3D shapes from their nets. Today students worked on getting caught up from the week and we worked through the study guide for tomorrow's quiz. Today we recapped finding the area of trapezoids. Then, we moved on to Composite Figures. 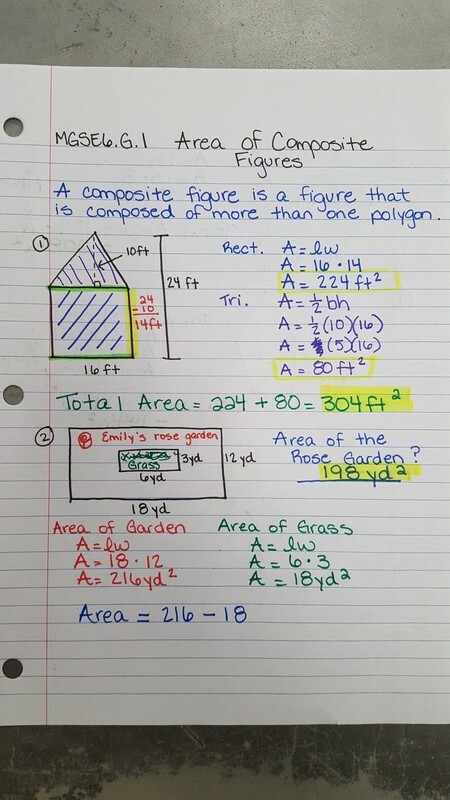 Composite figures are figures that are composite of various polygons. We worked through 4 examples. Students were also given a Riddle sheet to work on with a partner. Tomorrow students will be able to work with a partner to finish up and then we'll go over the study guide for Friday's quiz. Today we learned how to find the area of a trapezoid. Trapezoids can be tricky. There's a formula, but it's also considered a composite figure composed of rectangles and triangles. Students were also given a practice paper to begin on. We'll have some time in class to finish it tomorrow. 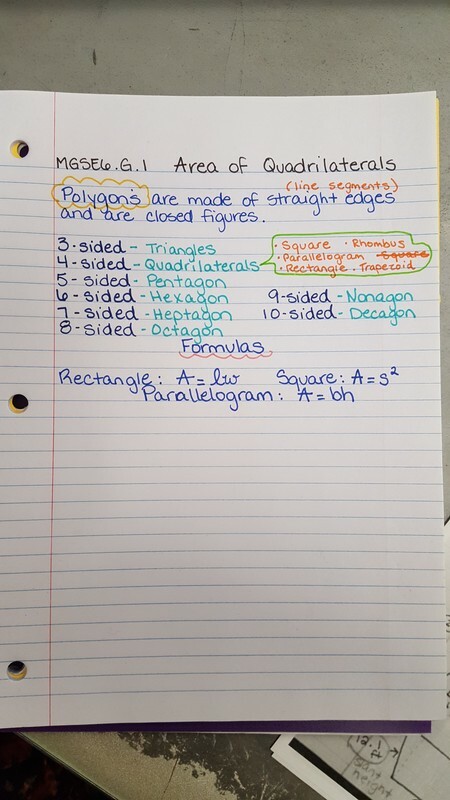 Today students were given about 7 minutes to finish their Area of Squares, Rectangles, & Parallelogram papers. We didn't get time to grade it in class, but they did turn it in to me. Then, we moved on to Area of Triangles. 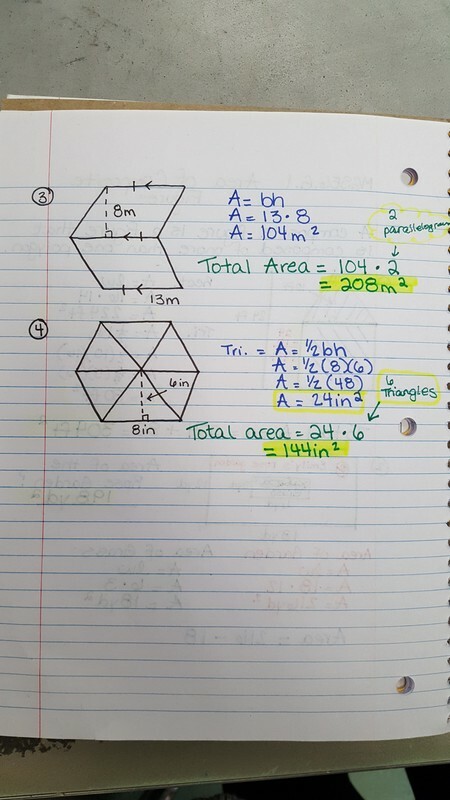 Students were shown how the area of a triangle can be derived from the area of a rectangle, square, or a parallelogram. It all depends on the type of triangle. 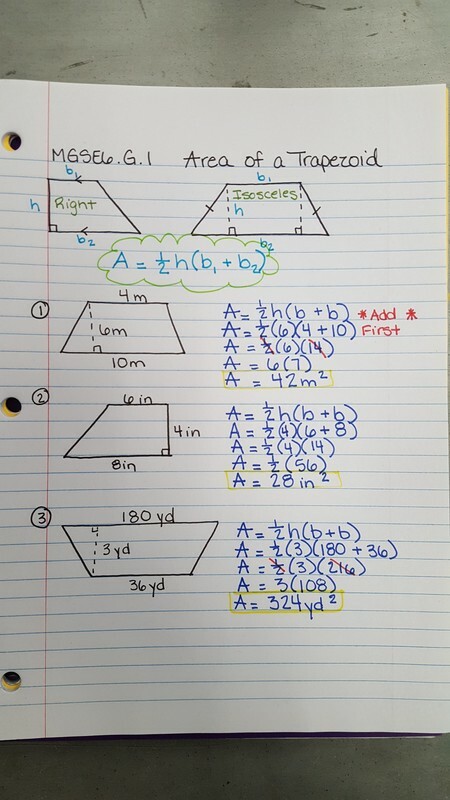 You can find the area of all triangles by multiplying their base and height and then taking half of your product. We took notes and then students were given a practice paper. We only had time to review the practice paper and determine which values were the height and the base of each. 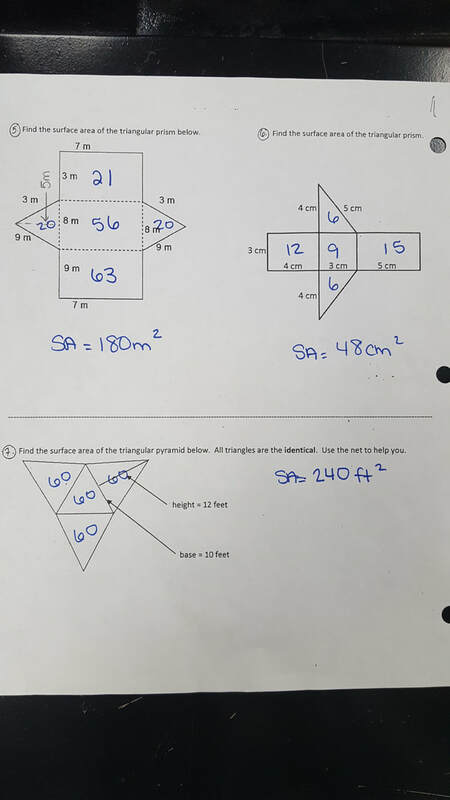 Tomorrow we'll finish the triangle sheet and move on to Trapezoids. No weekly homework sheet this week! 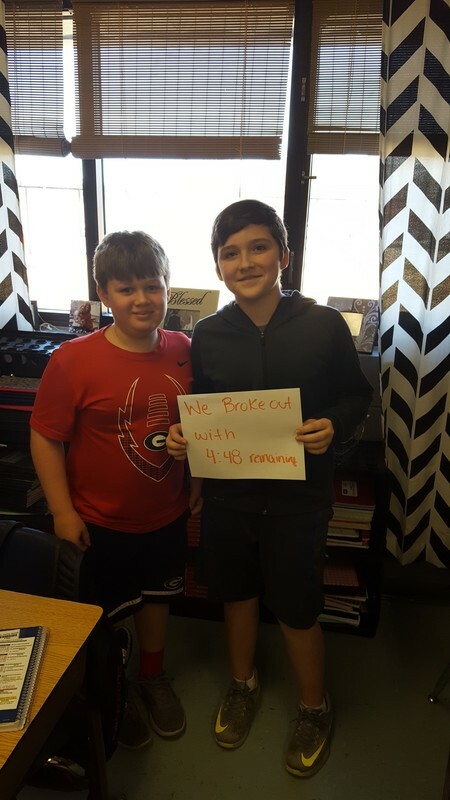 They received a Touchdown on their homework board! Congratulations!! Today we continued our notes over finding the area of quadrilaterals. Today we focused on rectangles, squares, and parallelograms. 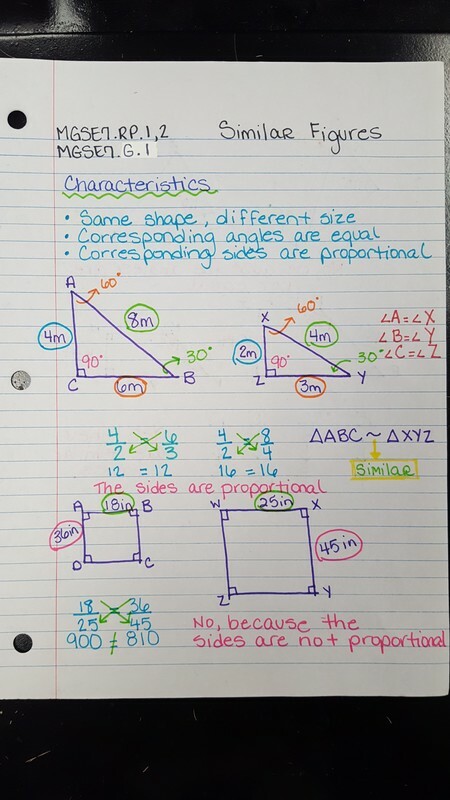 Students were given several examples of each including some complicated parallelograms with slant height dimensions. 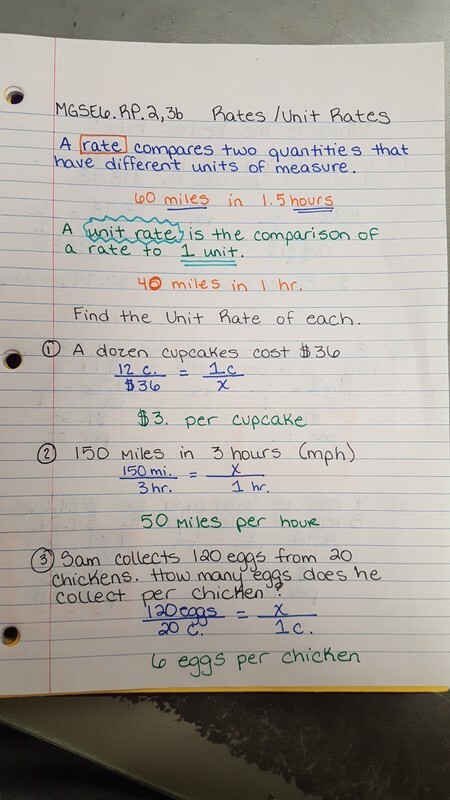 After notes, students were given time to work with a partner on practice problems. We'll spend about 6 minutes finishing up the practice problems in class on Monday. Today students took their percent quiz. AFter the quiz we went ahead and moved on to Geometry!! We quickly reviewed Polygon's and then discussed the various types. See notes below. 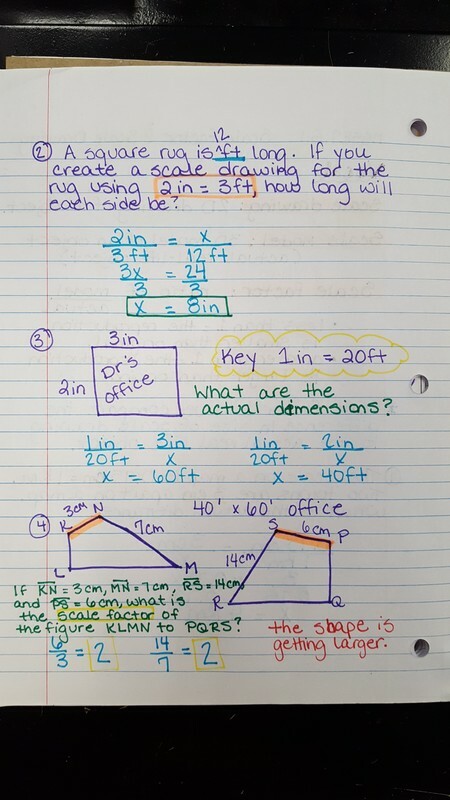 Questions come from notes and the Math Antics video posted on Monday! Today we went through and checked homework from last night. 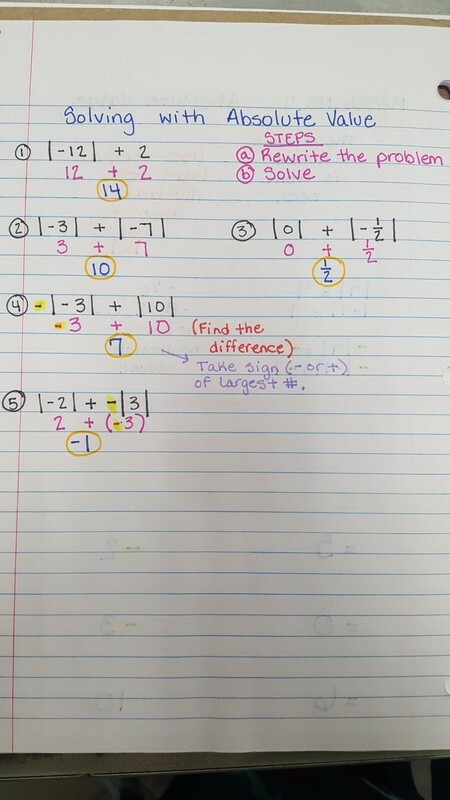 I showed the students how each problem from last night should be set up according to the question. They are to finish the remainder of the paper for homework tonight. 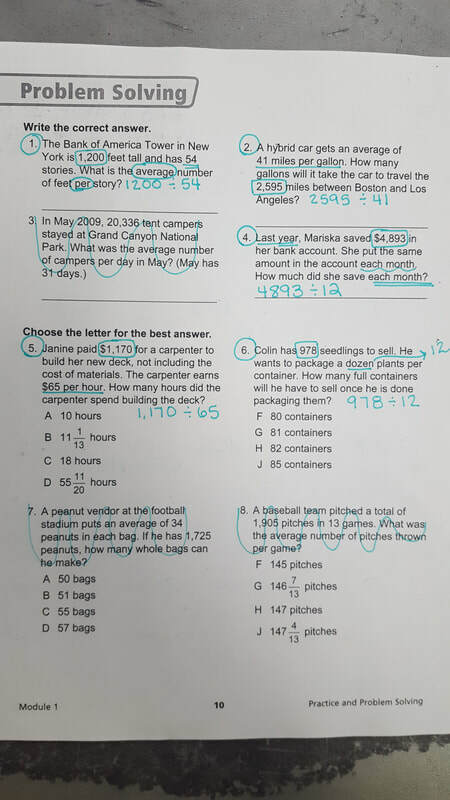 Then, we worked through Solving Percent Word Problems. 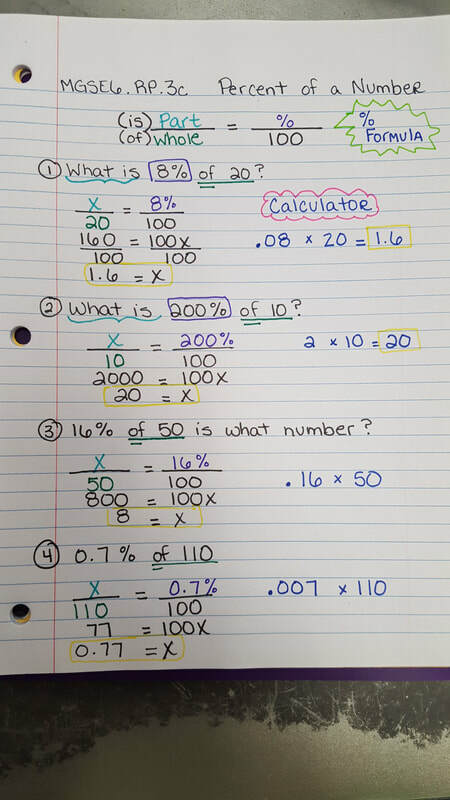 Today students learned how to solve percent problems where the percent or the whole is missing. We took notes and then students were given tonight's homework sheet to begin working on. Homework: complete #1-10 on the paper. 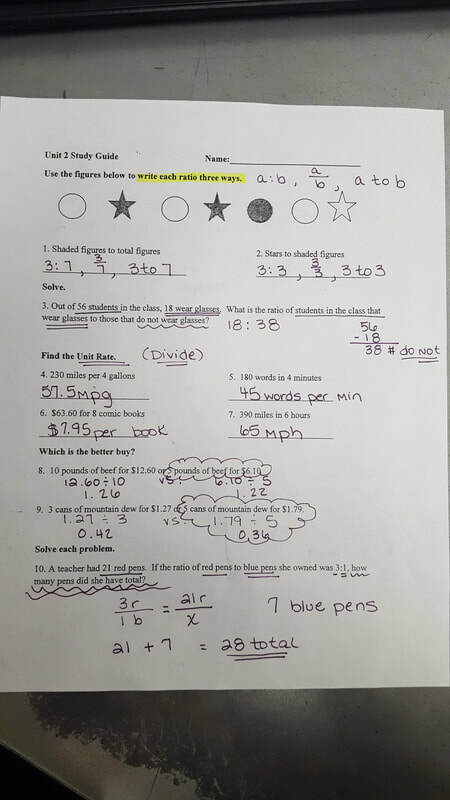 Today students turned in their weekly homework sheets from last week and then they turned in their Percent of a number practice from last Tuesday. Those that did not turn these in will see 10 points deducted for each day the assignment is late. There will not be a weekly homework sheet this week due to being so behind on our lessons. Therefore, students will be responsible for completing any work that does not get completed in class at home. I'll try my best to send out Remind101 alerts about these assignments. Today we continued working with percents. We reviewed Real World Percent of a number problems. Then, we barely had time to watch the video below in preparation for class tomorrow. Today due to an abbreviated schedule things were a bit hectic. Students received their weekly homework sheet upon entering the room. This sheet will be due and checked in class on Friday. Then, we took learned how to find percent of a number. Students watched a brief portion of the video below. 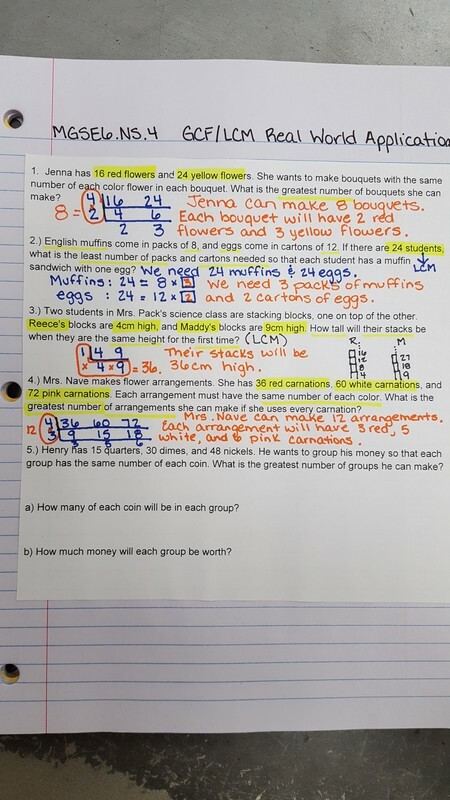 Then, we took notes and students learned how to find the percent of a number using the Proportion Formula and by converting the percent to a decimal and multiplying by the whole number. 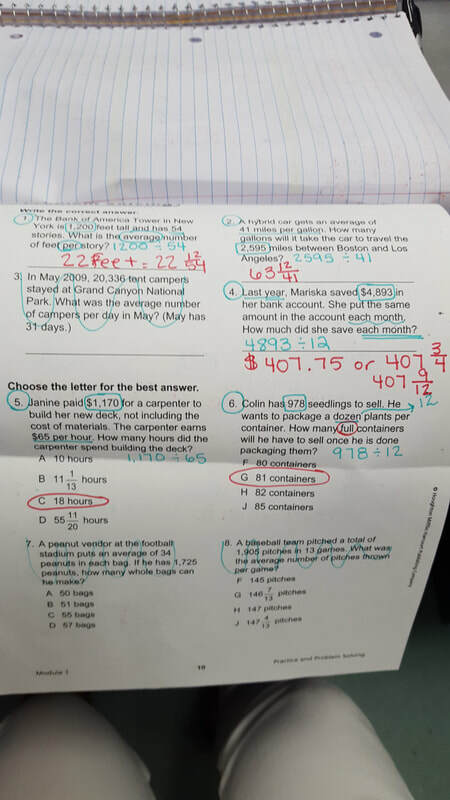 After notes, students were given a practice paper. This paper is due the next day we are in class. You may use a calculator on the entire paper. 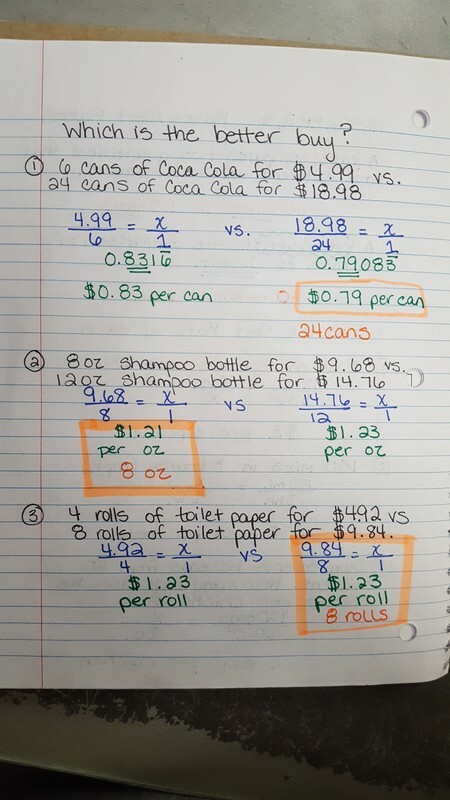 Today we checked our homework sheet & then reviewed converting percents. 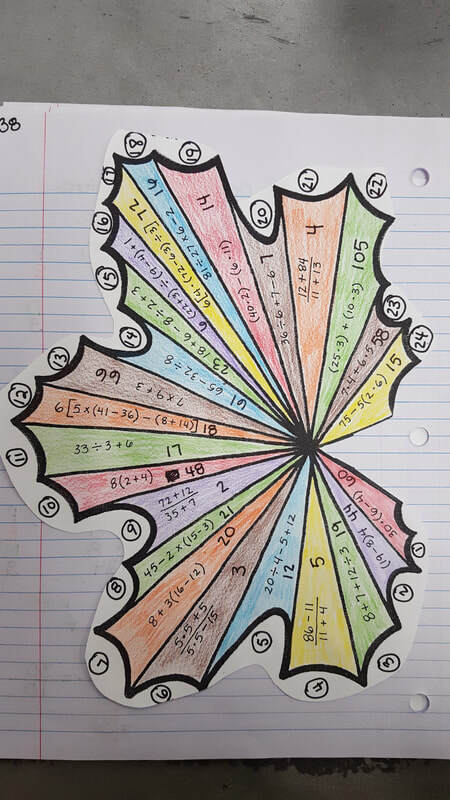 Students also received a practice sheet and were given time to work on it. It will need to be finished over the weekend and turned in on Tuesday when we return. Today students learned how to convert percents to fractions and into decimals. 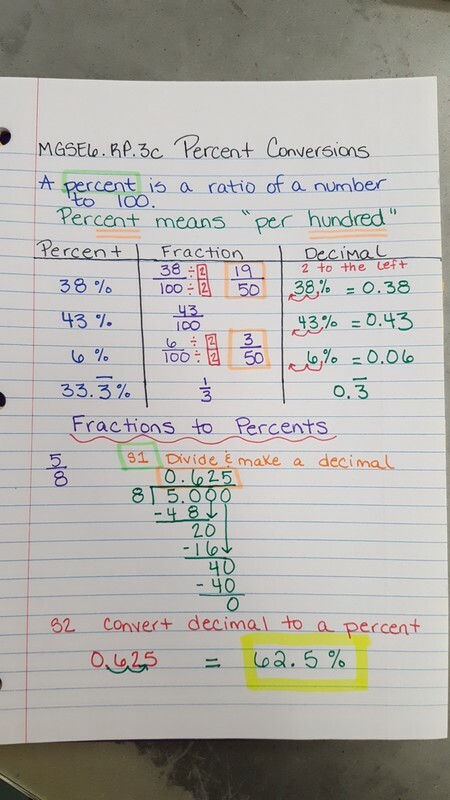 Then, they began learning the process of changing a fraction into a decimal and then a percent. Tomorrow we'll check our homework sheet and practice what we've learned. Today students were given about 2 minutes to ask me any questions they had over tonight's homework problems. Then, they had about 5 minutes to ask me to work out or go over any of the study guide problems. After a quick review, study guides were taken up and then students took their Quiz over ratios, rates, and proportions. Tomorrow we'll begin learning all about percents. Today students were given a bit of class time to complete proportions sheet that some didn't get completed on Friday. Then, we reviewed Monday and Tuesday night's homework problems for clarification. Afterwards, students were given about 10 minutes to work on their Study Guide with a partner of their choice. After the 10 minutes were up we worked through each problem on the study guide. Today we will review Rates, Unit Rates, & Proportions. 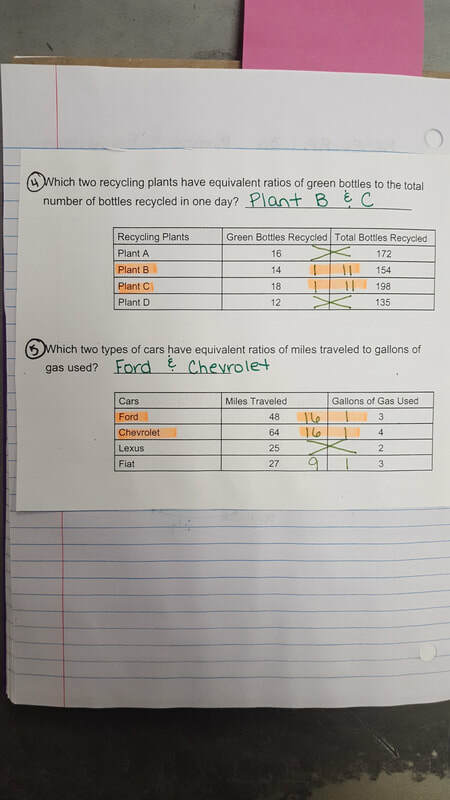 Prior to the break students were required to complete a Real World Rate/Unit rate paper that was front and back. Today we'll go over this paper in-depth to ensure student understanding of rates and unit rates. 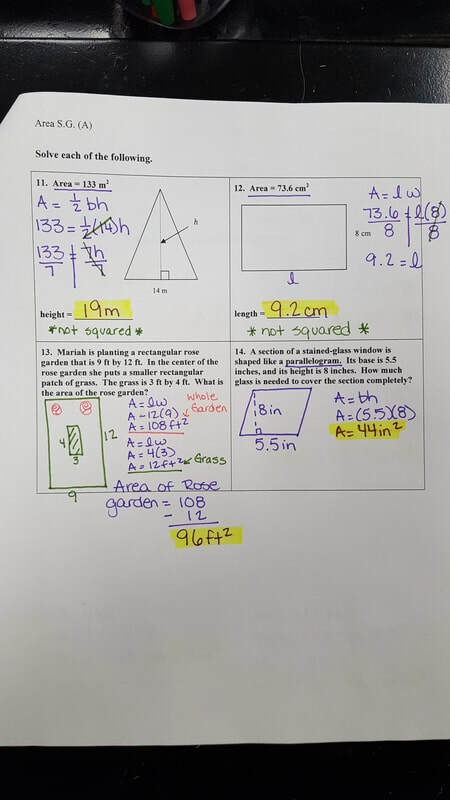 Them, students will work with a partner or independently on a graded rate/proportions sheet. 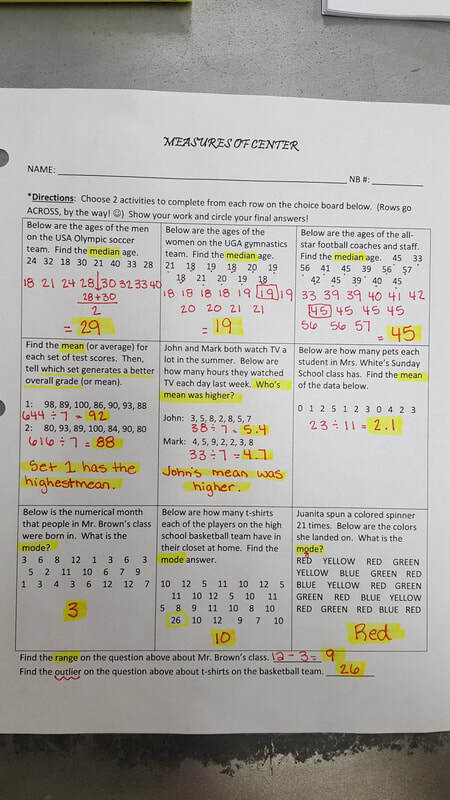 Monday, well review all concepts of ratios, proportions, and rates through a review game. On Tuesday, students will take a brief quiz over the Unit. Today students went to see the movie, Wonder. Then, we had our 2nd 9 weeks Reward Day. Tomorrow will be busy so be ready! Snow day #2! I sure hope you're all enjoying your extra pre-Christmas break! 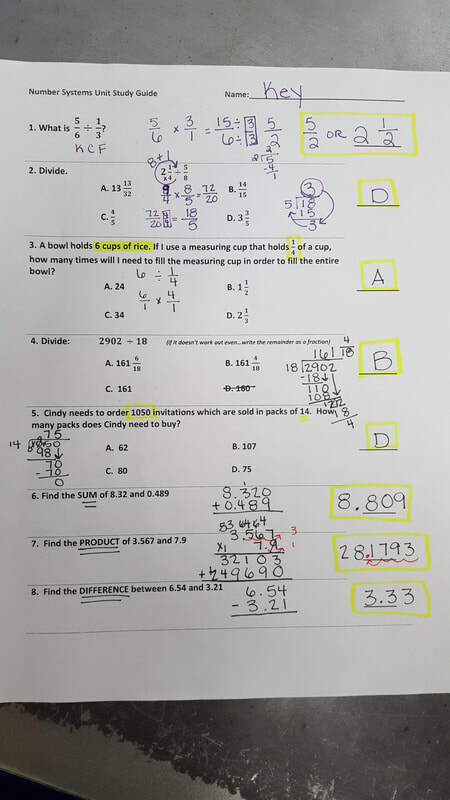 Please note, if we have school tomorrow we'll be grading our weekly homework sheet from last week AND grading the Unit Rate practice sheet pictured below. Please make sure to work through and finish the sheet this afternoon. I set up all the problems on one side to help you out. Hope to see you tomorrow! Stay warm. Enjoy your snow day! Please have your homework ready to grade on Monday! 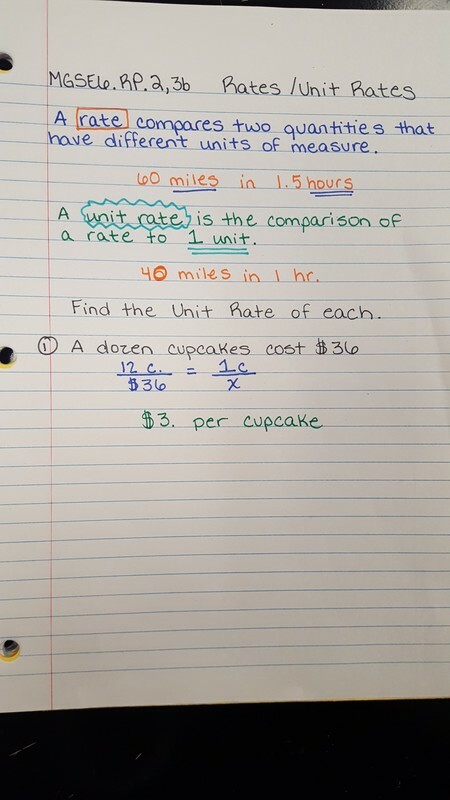 Today students continued learning about Unit Rates. We took it a step further today and learned how to compare prices to find the better buy. This was tough at first, but they seemed to grasp the concept after several practice problems. Tomorrow we'll continue working with Unit Rates. 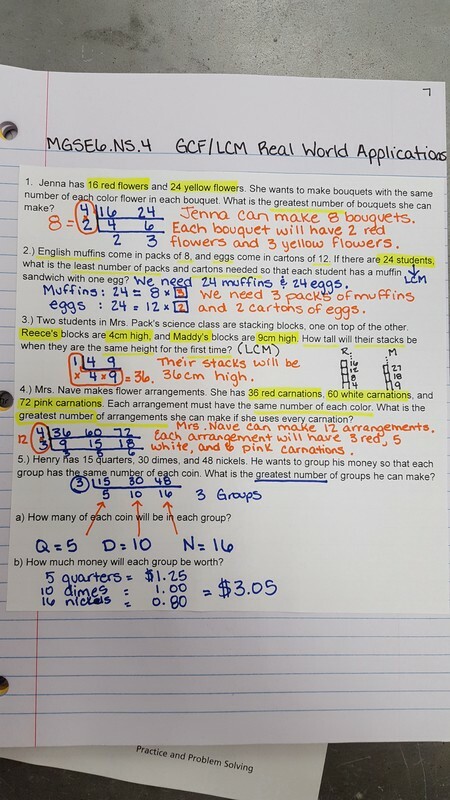 Today we reviewed the proportion word problems document from yesterday. Then students got back into groups with their partners to finish working out the problems. Afterwards, we moved on to learning about rates...unit rates in particular. Students were very surprised to find out that ratios and rates are almost one in the same. We focused on unit rate in particular today. A unit rate is a rate to one. Such as 120 miles in 2 hours is a rate. Therefore, the unit rate of that problem is 60 miles per hour. Today students learned how to solve Proportion word problems. Our main focus was on setting the proportion up correctly. This will be the most difficult part of the proportion process. 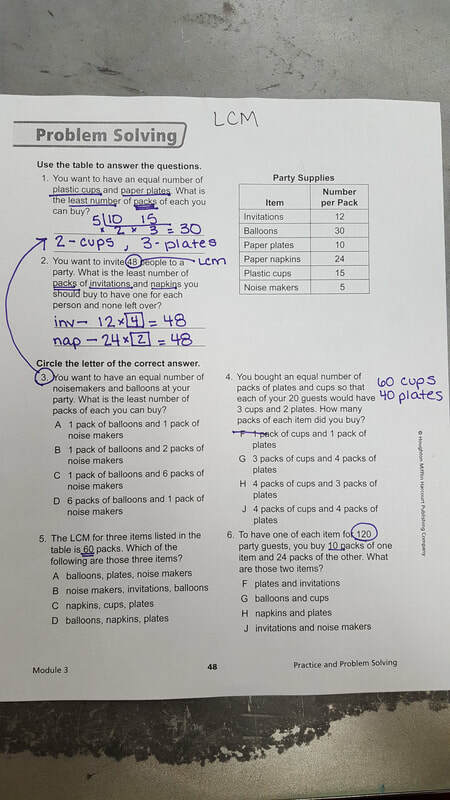 Once we worked through 3 examples in our notes, students got with a partner to try their best and set up 7 other proportion word problems. We will go over what they accomplished today in class tomorrow and then finish by solving the proportions. Today we reviewed graphing equivalent ratios from last Thursday. 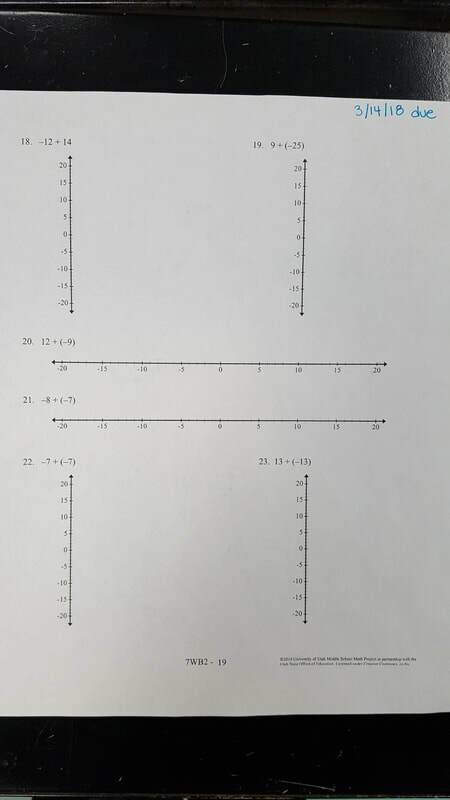 Students were given about 7 minutes to finish the graphing sheet. Then, we moved on to Proportions. Students learned that a proportion is an equation where two ratios are set equal to one another. They learned how to solve proportions when one of the number in one ratio is missing. 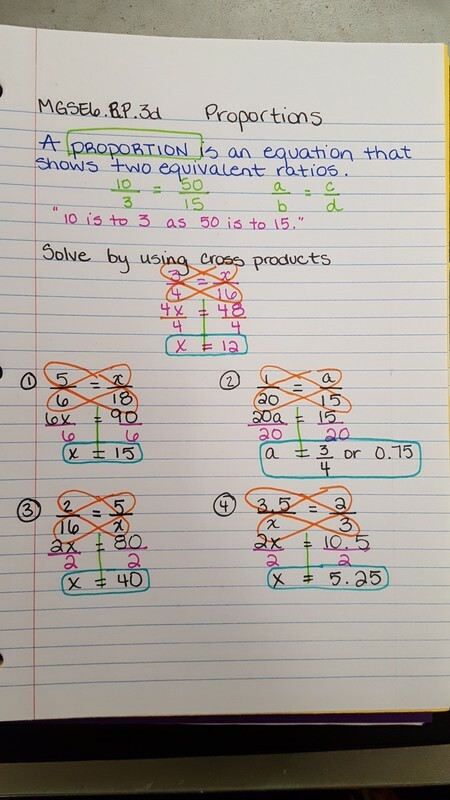 We solve these using Cross Products. See notes below. Today students learned how to take equivalent ratios from tables and apply them to graphs. Basically we took the two values from the tables and made ordered pairs out of them. Once we had ordered pairs we graphed them on a coordinate plane to show the constant rate of change given the problem. 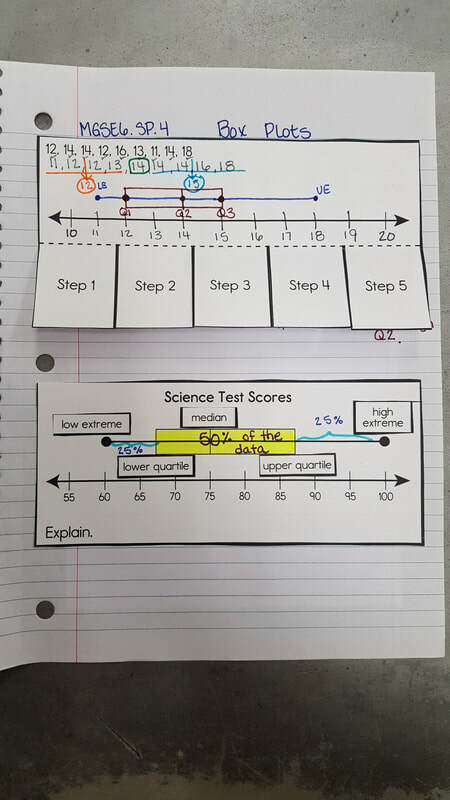 Students were also given a graphing practice paper. We'll go over the paper briefly in class on Monday and students will have about 7 minutes to complete and turn in. If they don't finish Monday it will be due on Tuesday. Today students worked through a series of real world equivalent ratio problems using tables. I'll admit...some of these were tough, but my kiddos pulled it off! We reviewed and went over each problem prior to getting with our partners. My goal was to have each group at least get finished with #1-4 prior to the end of the time given. A few groups didn't finish. Those that didn't get through with #1-4 will need to finish through #4 for homework tonight. Then, we moved on to looking at graphing equivalent ratios. Today we learned how to use ratios to create tables of equivalent ratios. We discussed the differences and similarities between equivalent ratios and equivalent fractions. We also discussed the differences between function tables and equivalent ratio tables. Then, we worked a few real world applications. Tomorrow students will practice with partners. Today students learned about Ratios!! We discussed them in depth using the number of boys to girls and girls to total people in the class. Then, we watched two out of the three videos posted below. Then, students completed a formative assessment with partners to illustrate what they'd learned from our discussion and the videos. The assessment involved fruit loops. 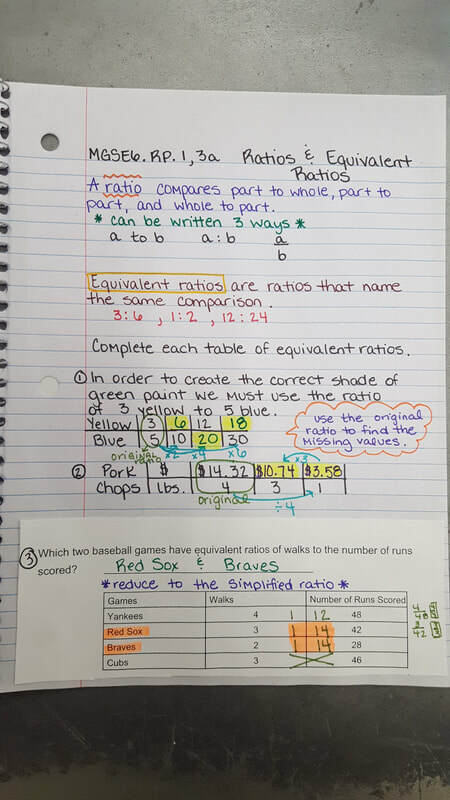 We'll take notes tomorrow and learn how to create equivalent ratios using tables. Today students got to participate in a digital breakout room. Ask them about it! It was fun! One group managed to breakout and solve the mystery before time was up! Today we graded our weekly homework sheet and then we continued our interactive Battle Royale Game! After we reviewed tonight's homework problems students were split into 4 groups. Students learned how to play "Battle Royale". Battle Royale is a fun and interactive game using standards chosen by the teacher. We played using Expressions and Equations standards. Today we finished going over our "backwards graphs of functions" paper. We reviewed the entire paper together. Then, students worked in cooperative groups on real-world applications of functions. We'll use our activity we completed in our groups to participate in a "Battle Royale" game tomorrow. Today was damage control day. We reviewed everything that we completed last Wednesday, Thursday, & Friday. 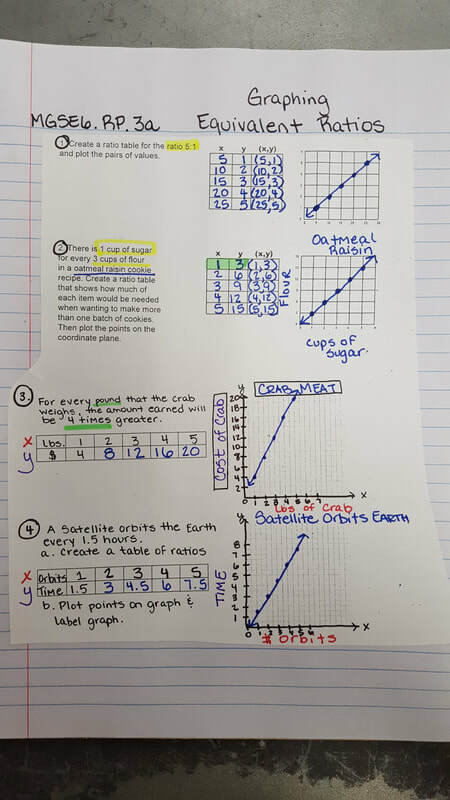 Then, we began going over graphing functions to clarify understanding. Today was a crazy day! According to the schedule that was altered for the Veteran's Day program, kiddos were only in my class for a brief amount of time. They received a paper over "Backwards Function Graphs". We will go over this paper in-depth on Monday when I return. 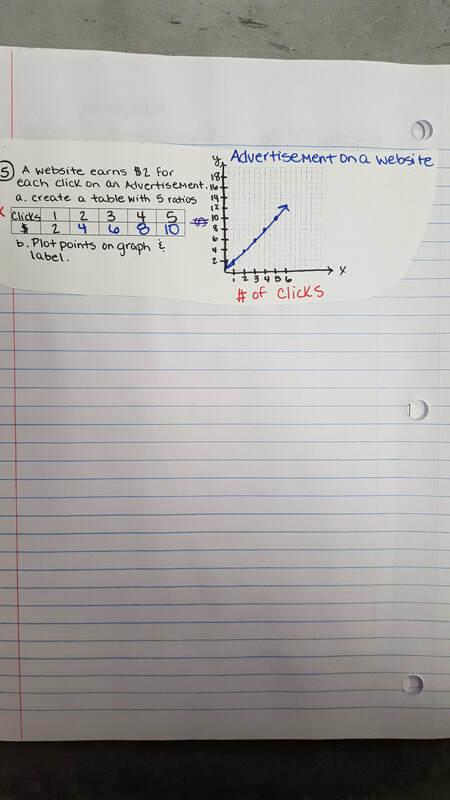 Today students will be taking notes over graphing functions. The notes were created prior to me leaving for the conference. 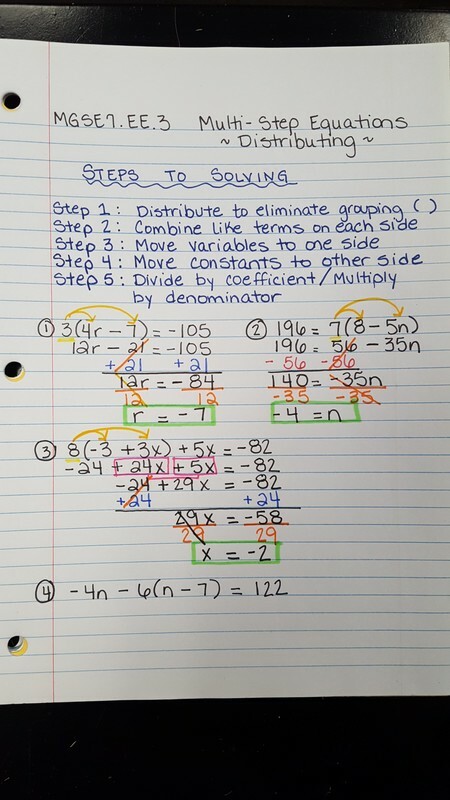 I'll go over graphing functions and deriving equations and rules from the graphs when I return on Monday. 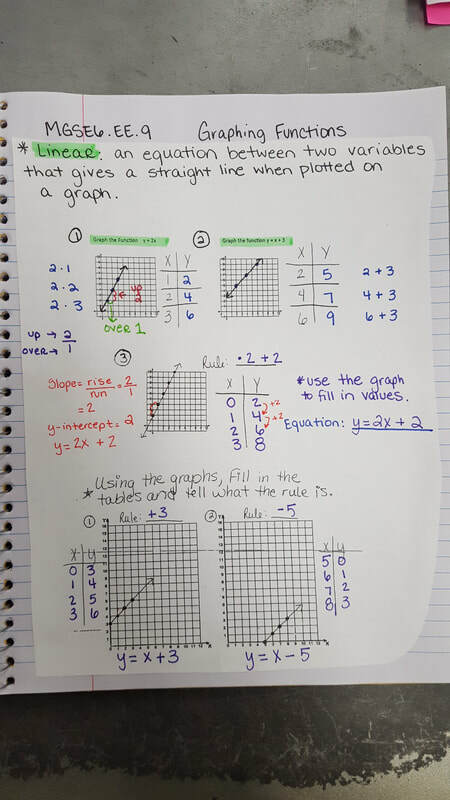 Then, students will work on a practice paper titled, "Graphing Functions". I will be gone today through Friday. I will be in Atlanta at the GaETC conference. I am hoping to learn all kinds of new and innovative tech applications to bring back and use in the math classroom. Today in class students will be working with a partner to complete a series of function tables. 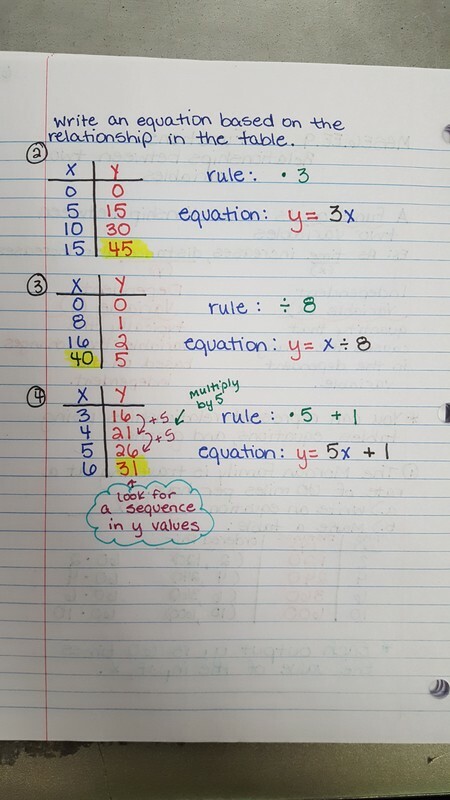 They will be required to derive the rule from each table, create another table with 3 additional values, and then write an equation from the rule. They'll also complete an independent paper over tables and functions. 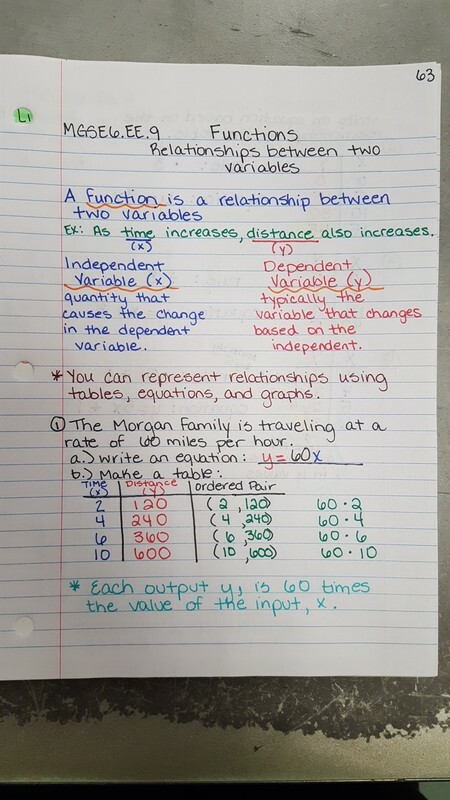 Today students turned in their Take Home test & then we moved on to functions. We took notes and discussed how to derive a rule from an x/y T-table. 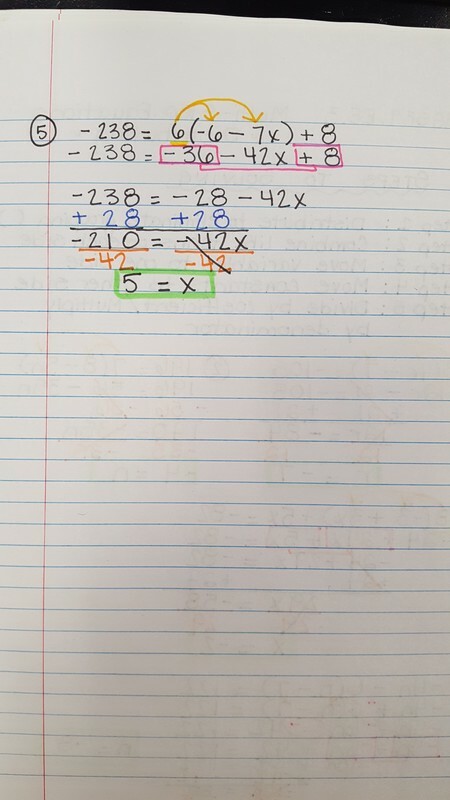 We also learned how to take the rule and turn it into a working equation where x is being changed to solve for the value of y. 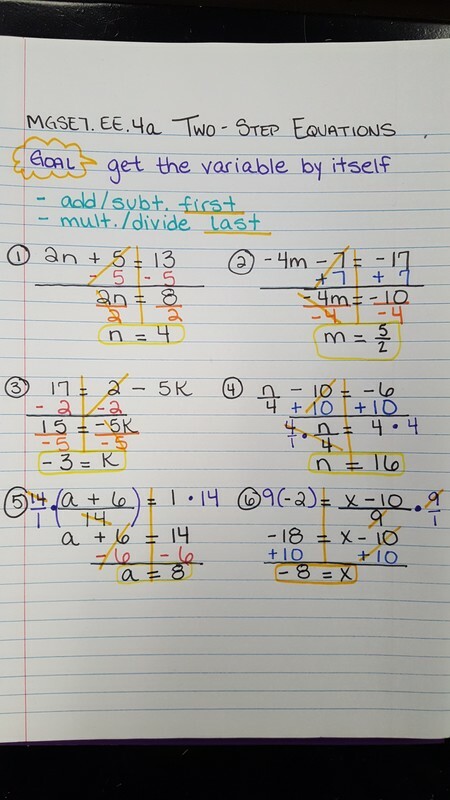 Open notes & possible take home and finish test over Equations and Inequalities on Monday! 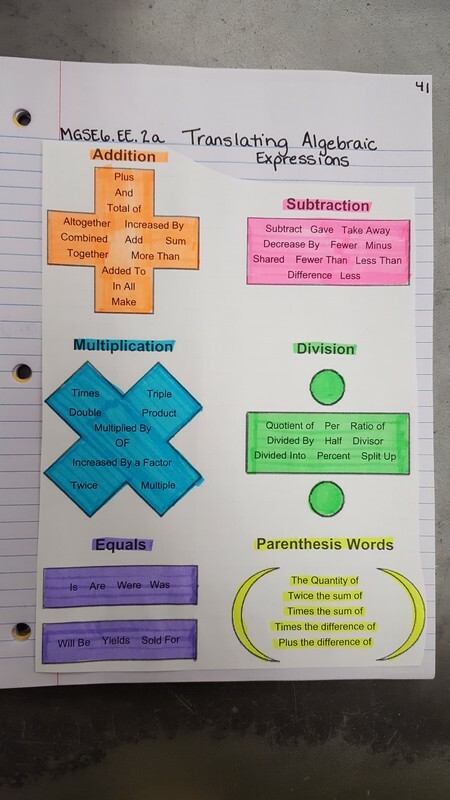 It will cover our notes from "One-Step Equations: Addition and Subtraction" through today's "Inequalities Word Problems". 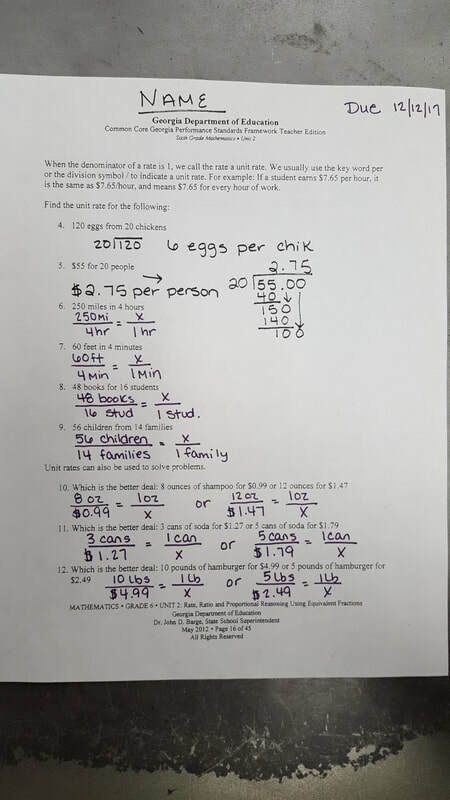 Today students finished up their partner activity from last Thursday over Inequality word problems. Then, they began working on their open notes Inequalities & Equations test. 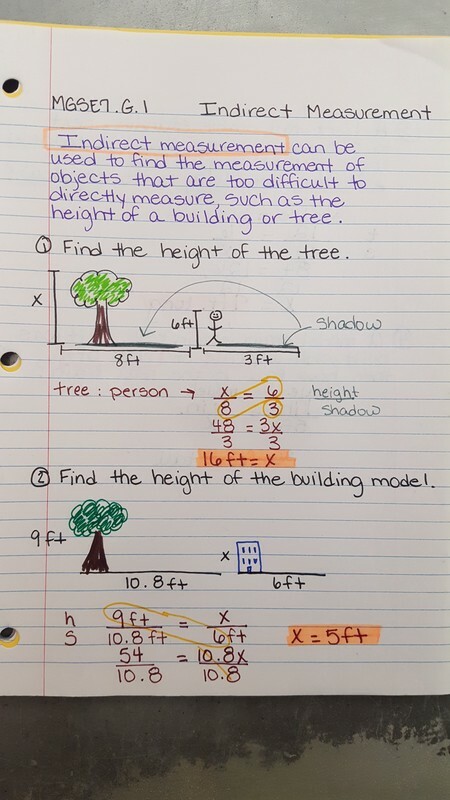 This test is open notes and students are allowed to use calculators. Those who did not finish their test in class will finish at home tonight. I did not give students a weekly homework sheet this week due to my upcoming absence. I will be attending a Technology conference and will be gone on Wednesday, Thursday, & Friday of this week. Today students completed their Math Benchmark! Today we began the class by grading our weekly homework paper. 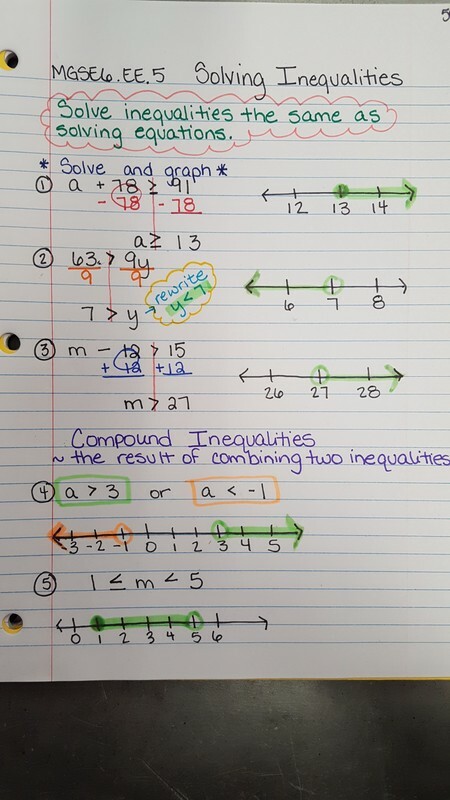 Then, we reviewed solving inequalities from yesterday and jumped right in to solving inequality word problems. 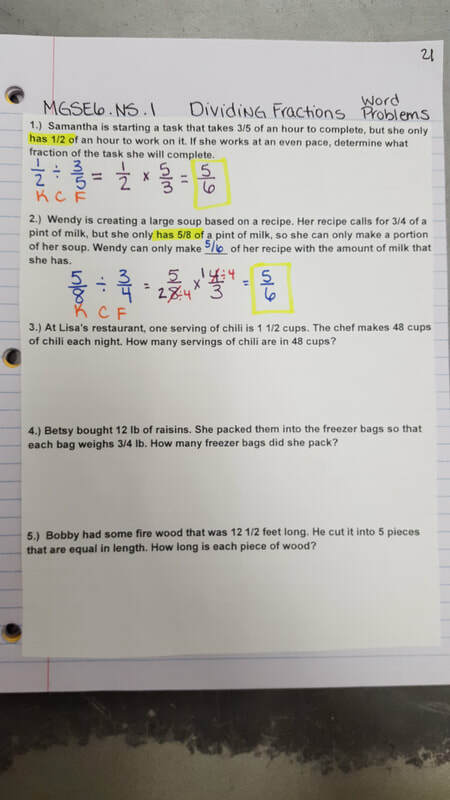 Our Word Problems notes were a multiple choice cut/paste. 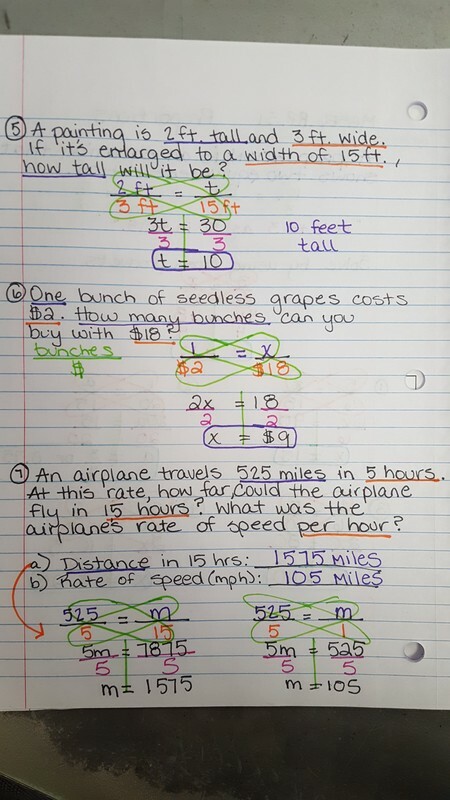 I really want students to get a good grasp of the types of questions and the wording on these problems. After working through our notes in-depth students began working with a partner near them on a multiple choice activity sheet. We will finish the sheet after the benchmark tomorrow! Today we reviewed Wednesday night's homework problems. 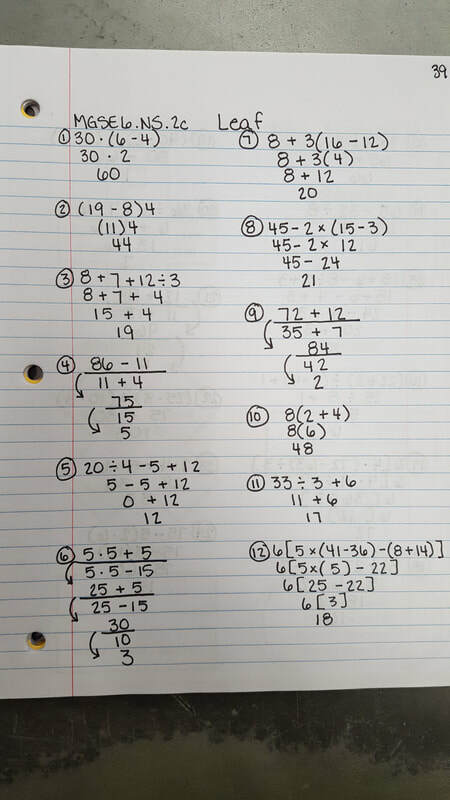 Then, we quickly reviewing solving inequalities from yesterday. After reviewing students had about 15 minutes of class time to work on a "Solving & Graphing inequalities" practice paper. 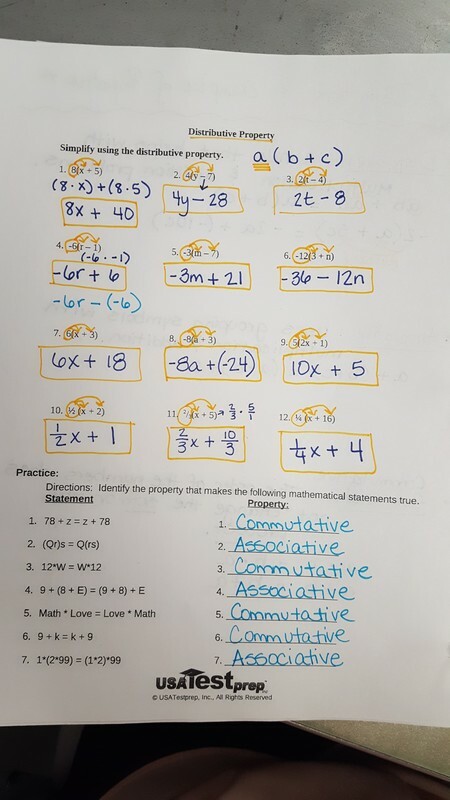 Prior to working on their own I allowed them to pick one problem from each side of the paper and worked it with them. After the 15 minutes were up they cut/pasted the next page of notes into their notebooks. We'll work on those tomorrow. ​Remember, homework sheet is due tomorrow! Today we reviewed Tuesday night's weekly homework problems. Then, we quickly reviewed graphing inequalities from yesterday. After quickly reviewing, students had 10 minutes in class to complete a simple practice paper over graphing inequalities. We were gonna check this in class but about 3 people need a few more minutes to finish up. We'll check it tomorrow if we have time. Then, we moved on to learning how to solve inequalities and we also learned about Compound inequalities. Solving inequalities is the same as solving equations. 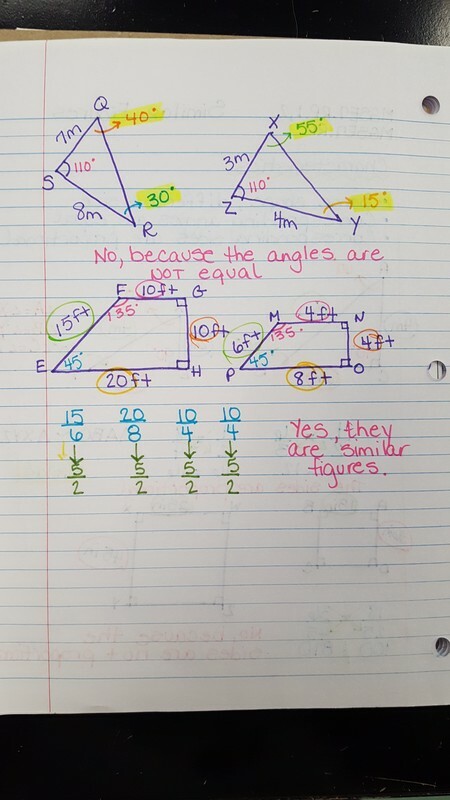 The only difference is that inequalities do not have a equal sign. Instead, they have a greater than, less than, greater than or equal to, or less than or equal to sign. The solution is worked the same. 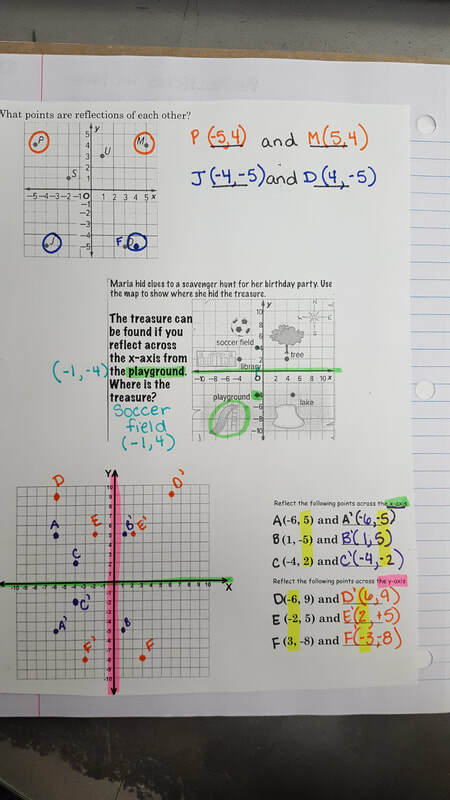 Compound inequalities are where two inequalities are being shown on the same graph. This was a tricky one for students but we'll review a bit more tomorrow. Today students received their weekly homework sheet. 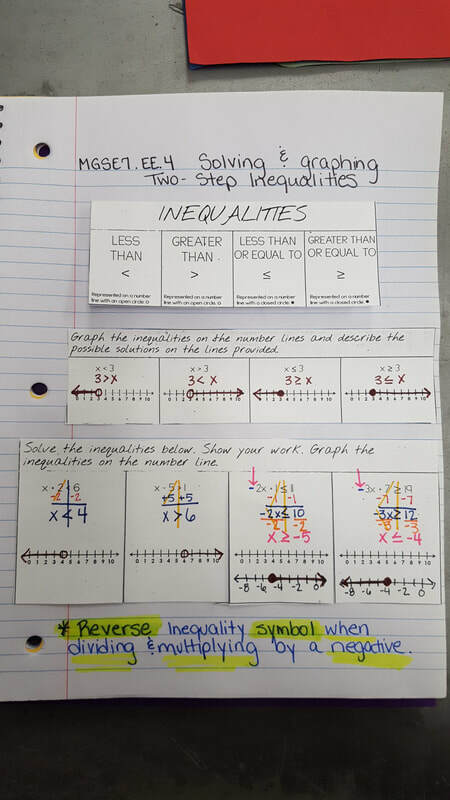 Then, they learned about inequalities. 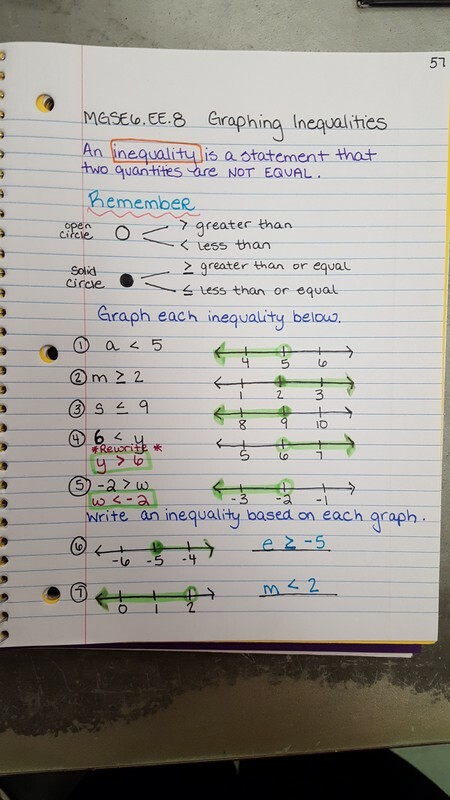 In particular how to graph inequalities on a number line to prove what the quantity could possibly be. Today we checked our Homework in class. Then, students were grouped randomly into groups of 3 or 4 to complete 4 stations posted around the room. Each station focused on solving one-step equations. Their goal was to complete 3 of the 4 stations prior to lunch. They didn't quite get finished, but they all worked extremely hard! Today we reviewed tonight's homework problems on the weekly sheet. Then, we checked the paper from yesterday and stapled it in our notebooks. Then, they worked together with a partner on a Performance Task. Today we reviewed tonight's homework problems. 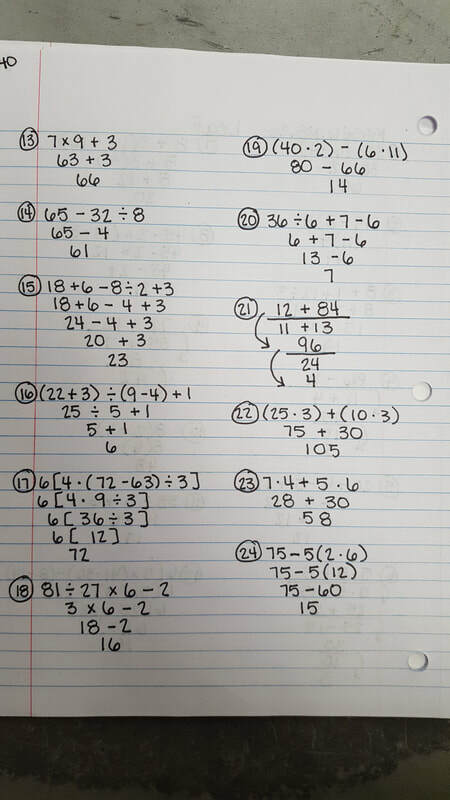 Then, we recapped multiplying and dividing equations from yesterday. We went over how to solve equations containing fractions today. Then, students worked with a partner on a real world application of addition and subtraction equations. We didn't have enough time to finish in class so we'll finish our partner activity tomorrow. 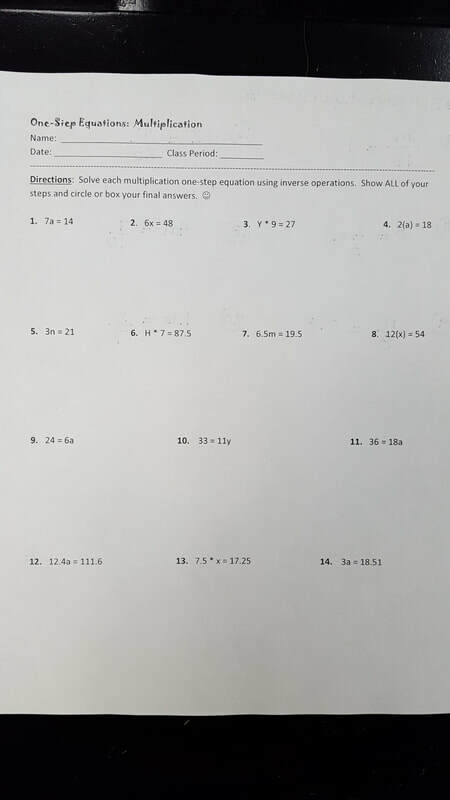 Also, students received a multiplying and dividing practice sheet. They only had about 8 minutes in class to work on it today. Therefore, they'll need to finish for homework tonight. Today we checked our homework from last night. I was very disappointed to find out that about 5 of my kiddos did not complete their homework assignments. Then, we reviewed Tuesday night's problems on our weekly homework sheet. Afterwards, students learned how to solve simple one-step multiplication and division equations. Today students received their weekly homework sheet. 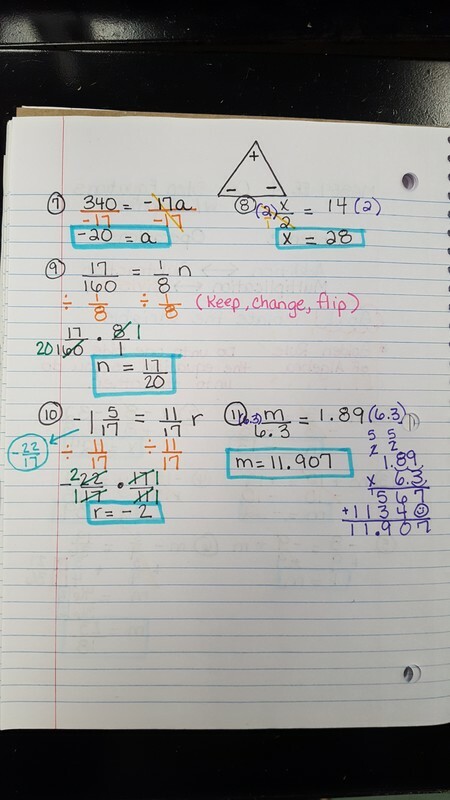 Then, we quickly recapped one step addition equations from Friday's lesson. Then, we moved on to subtraction equations. We finished all notes from Friday and then students had class time to work on a practice paper. They didn't have a ton of time to get their practice paper finished. Therefore, they'll need to finish for homework tonight. We'll grade in class tomorrow. As it turns out 5th period received a "GREAT CLASS" comment from the sub yesterday. Therefore, they got FREE CHOICE SEATING today. I'm pretty sure they enjoyed it or I hope they did. Then, we graded our homework sheet. We also moved on to our new unit over Equations today!! YAY! 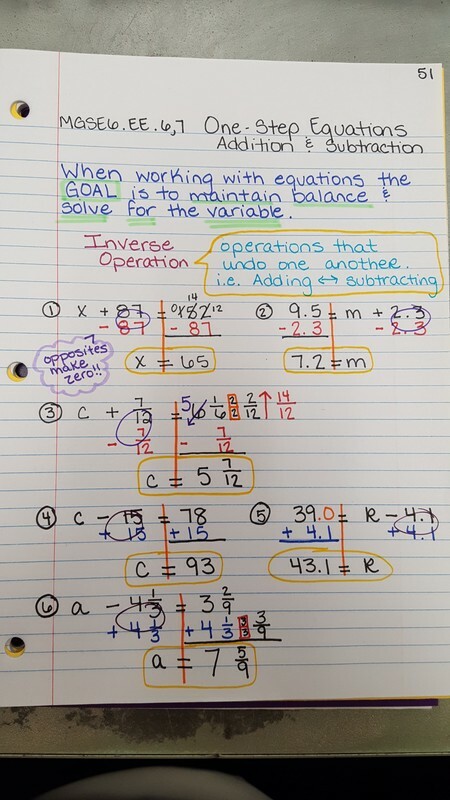 Students learned what "Inverse Operations" mean and how to solve easy one-step addition problems. Today students turned in their Study Guides and took their Unit 3 test over Expressions. Then, they read their Library Books or worked on their weekly homework sheet. 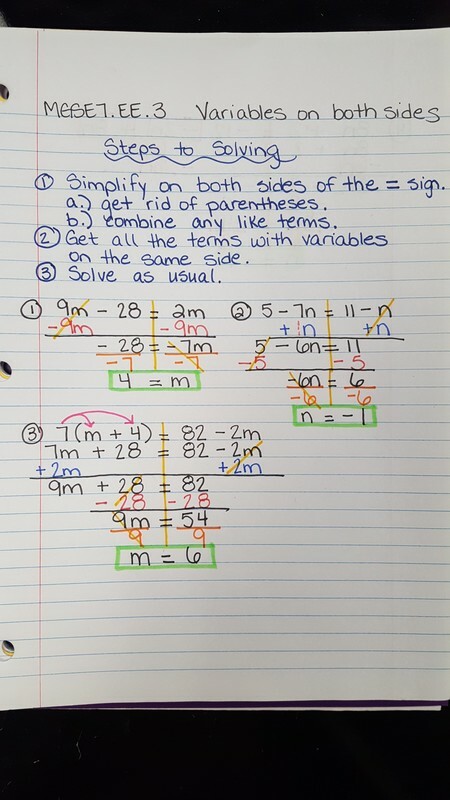 Today we reviewed tonight's homework problems and then students had a chance to ask me questions over tomorrow night's problems as well. I will be attending a Math Training tomorrow here at FCMS and Mrs. Gonzales will be my sub. 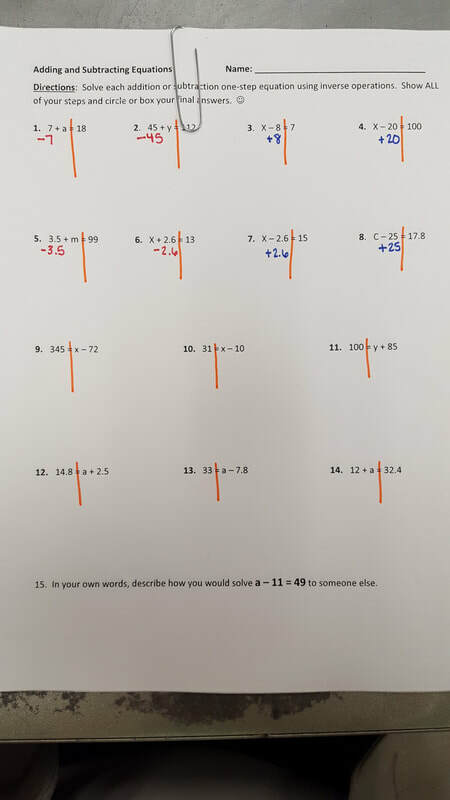 After going over homework problems, students had to complete an "Evaluating Expressions" practice with a partner or by themselves (their choice). They also got to choose the problems they did... Options 1) Side A, 2) Side B, 3) All Odd problems on both sides, or 4) all even problems on both sides. Once they finished they turned their practice paper in to me and then worked through their study guide for tomorrow's test. 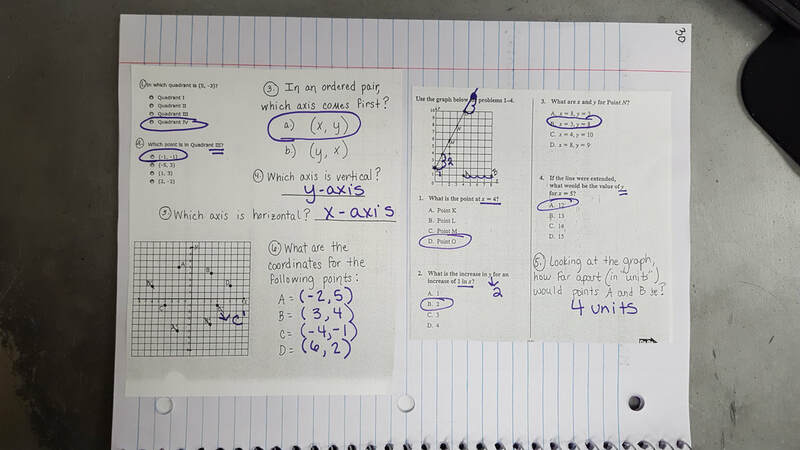 Students received answers to the Study Guide prior to the end of class. The key is also posted below. Happy Studying!! Good luck tomorrow!! Today students were given a bit of class time to work on homework and finish up their Equivalent Expressions sheet. Then, they turned in the equivalent Expressions sheet. Then, we moved on to "Evaluating Expressions". Students learned how to sub in values for variables and simplify algebraic expressions accordingly. Students were also given their Unit 3 Study Guide for Thursday's Test. Today students received their weekly homework sheet. This weeks is a bit different. 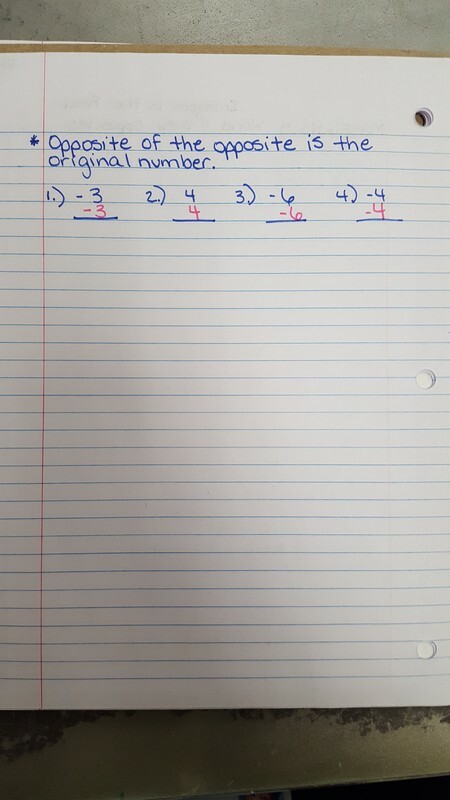 The work space is located underneath each problem set instead of on the back of the paper. We'll see if this helps some of us. I have high hopes. Then, we quickly reviewed Equivalent Expressions from Friday's lesson. Students received a practice paper over Equivalent Expressions on Friday and they had to keep up with it for today's lesson. Today they had the rest of the class period to finish it after I walked them through it for clarity. Those who did not finish and turn it in during class must finish for additional homework tonight. Tomorrow we'll move on to Evaluating Expressions. Students will also receive their study guides tomorrow for Thursday's Unit Test. Today we finished our notes over Equivalent Expressions & then students worked with partners on a matching game. 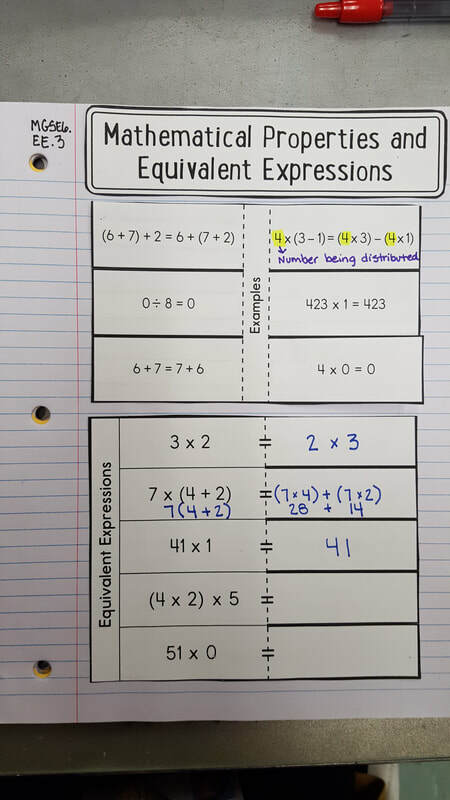 Today students learned how to use the distributive property with expressions to create equivalent expressions. We also discussed factoring. We'll finish notes tomorrow & play a matching game with partners. Today we continued practicing and learning about Combining Like Terms. We finished our notes after a quick kinesthetic activity. 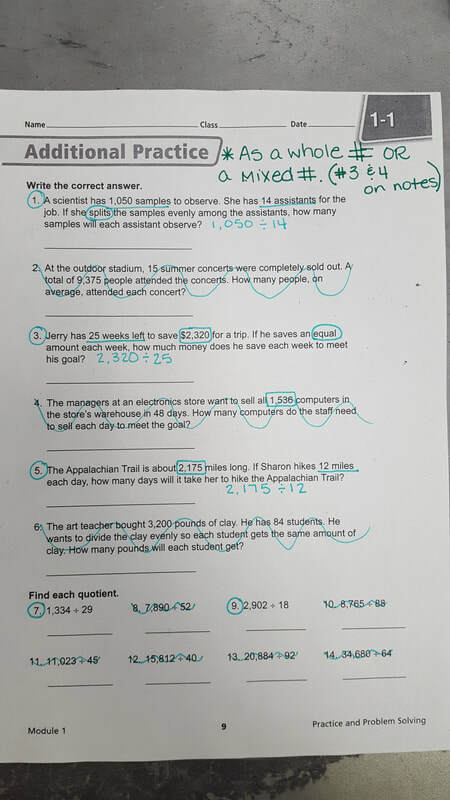 Then, students received a practice paper over "Simplifying" or combining like terms. 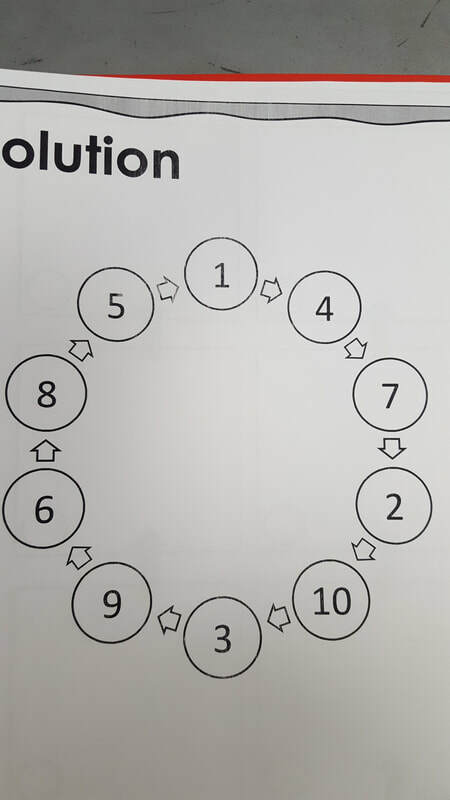 We completed a few problems together and then students had about 5 minutes to work alone and ask questions. The sheet is to be completed for homework tonight. 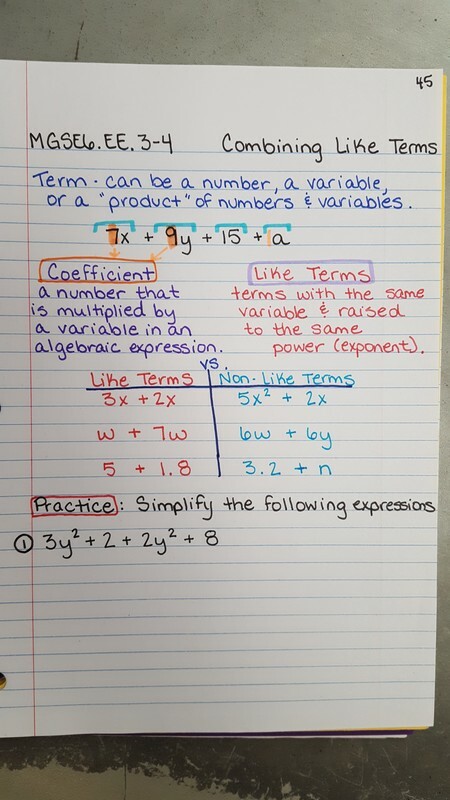 Today students turned their weekly homework sheets in and we learned about "Terms, Coefficients, & Like Terms". We began our notes before the bell rang. Today we finished our notes over Properties. Then, students worked through a multiple-choice properties sheet. ​Homework sheets are due tomorrow!! Today we reviewed Wednesday night's homework problems. 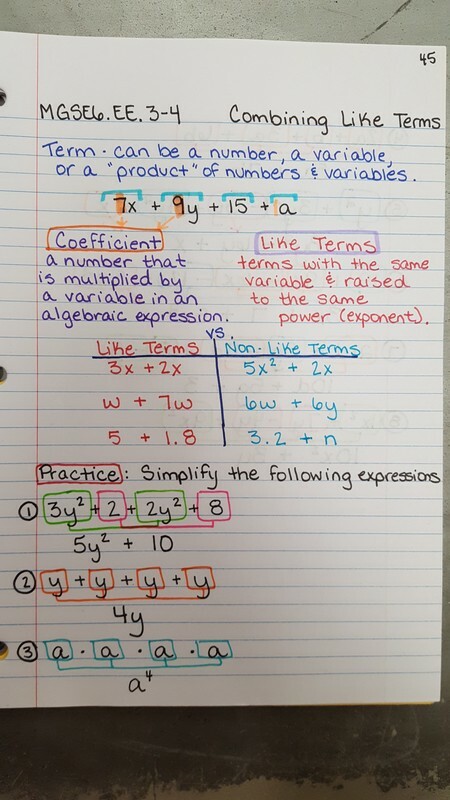 Then, we reviewed translating algebraic expressions such as "x squared" and "the product of a number and 2". Then, we moved on to reviewing mathematical properties. 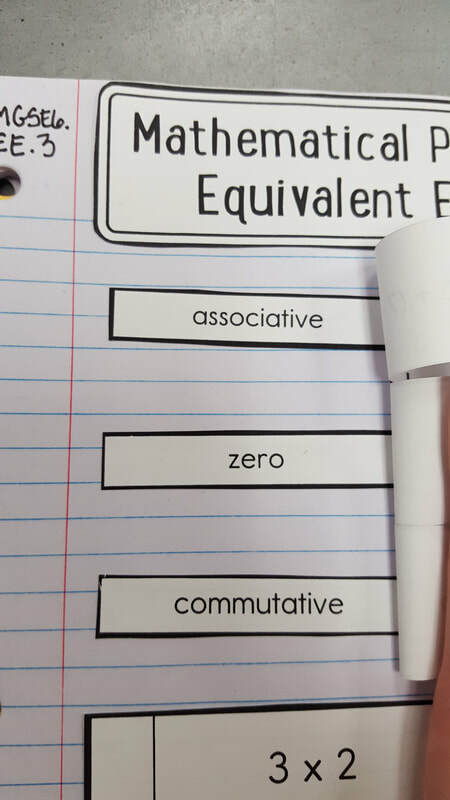 We worked through and interactive flipchart where students used the promethean pen to drag "commutive", "associative", and "identity" to their numerical counterparts. Then, we cut/pasted notes into our notebooks. We didn't quite finish our notes; therefore, we'll finish up tomorrow. Today we reviewed Tuesday night's homework problems. 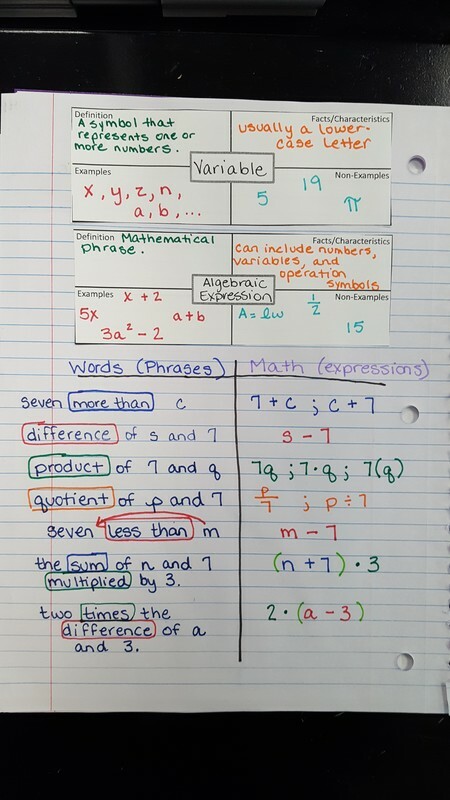 Then, we continued learning about algebraic expressions and words we use to describe them in math. Students finished their notes and then worked on a practice paper with a partner. Many did not finish. Those who did not finish must finish for homework tonight. Today we check the leaves and students cut/pasted them into their notebooks. Then, we moved on to learning what a variable is and how it's used in math. We also discussed words we use in math to create expressions. 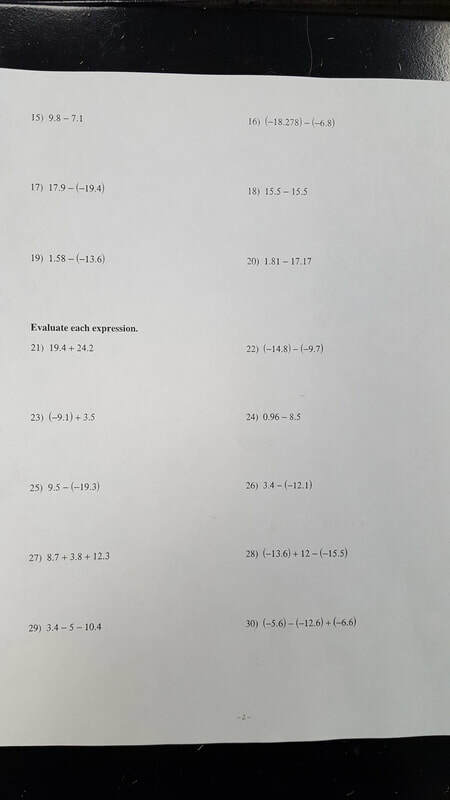 ​Students also received this weeks homework sheet today! Today students spent the entire class working on their Order of Operations leaves and coloring them with a partner. The work for the leaves should be completed within the next few pages of the notebook. We'll check them and go over them on Monday. 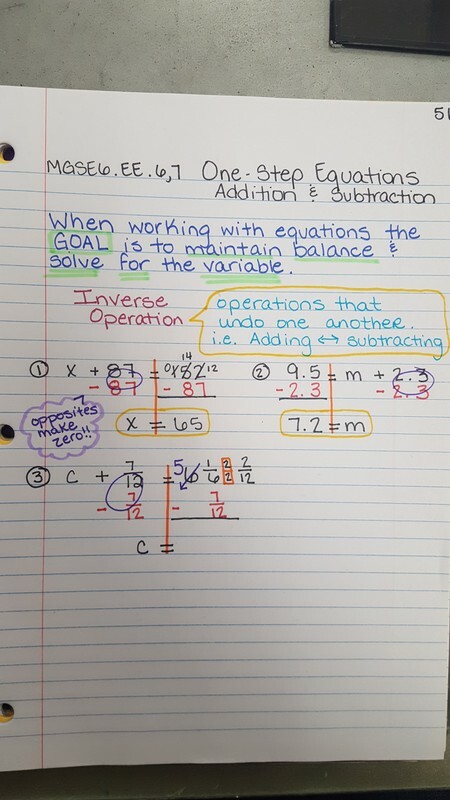 Today students took notes over Order of Operations. 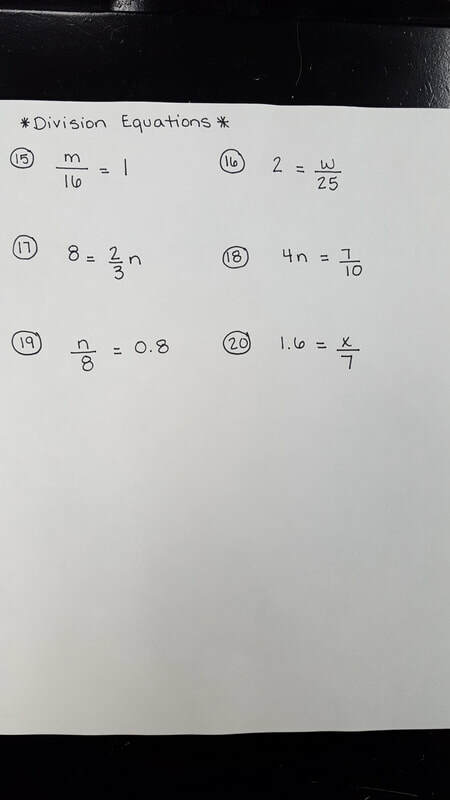 Then, they completed 10 practice problems. Those who did not finish must finish for homework tonight! Today students had 10 minutes to finish up their Coordinate Character Graph. 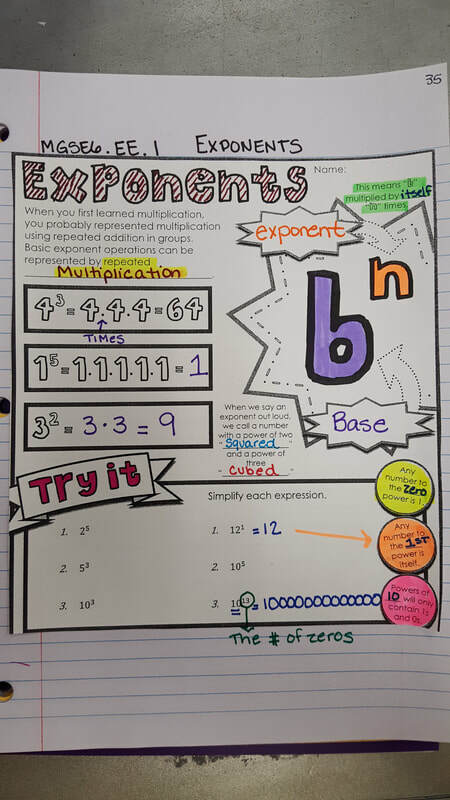 Then, we finished our notes over Exponents. 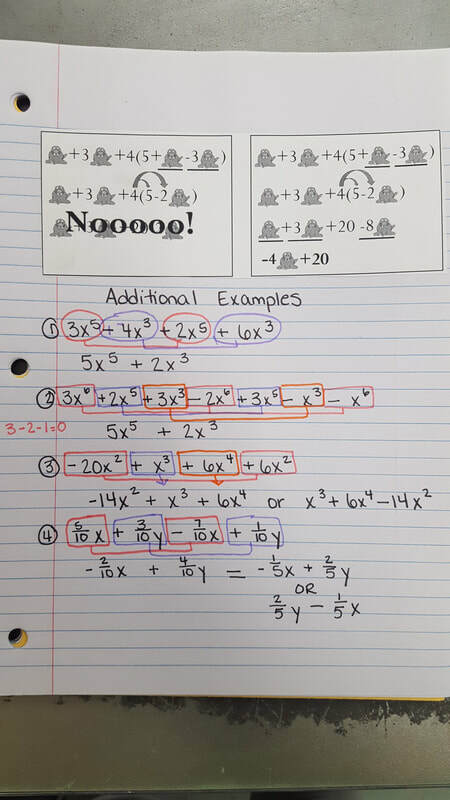 Afterwards, students completed a practice over Exponents and then we graded them in class. We also began talking about the Order of Operations. Today students had 10 minutes of class to work on their Character Graphs. Then, we had 5 minutes to take a quick Math Probe for Mr. Young. Afterwards, we watched a brief Flocabulary video about Exponents, and then took notes over exponents. Character Graphs are DUE IN CLASS TOMORROW! Today students received their Character Graphs. They got to choose their graph from Mario, Sponge Bob, or Tweety Bird. I graphed the first 4 - 5 ordered pairs of each graph with the students. Then, they worked on them for the remainder of class today. These are to be completed for homework tonight & tomorrow night. They are DUE ON WEDNESDAY!! These will be counted as a test grade and must be colored. Today we graded our homework sheets in class. 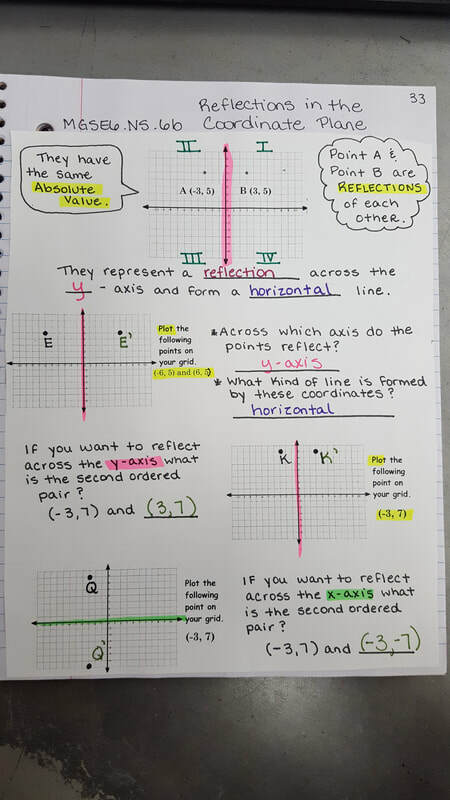 Then, we finished our Reflection notes and students worked on a practice paper over reflections in the coordinate plane. These are DUE on Monday! They will need to work on them over the weekend. Class time will be limited on Monday. Today we graded our Polygon's practice sheet from last night in class. There were only 2 kiddos who did not have their finished. Please finish tonight and have them turned in by tomorrow! 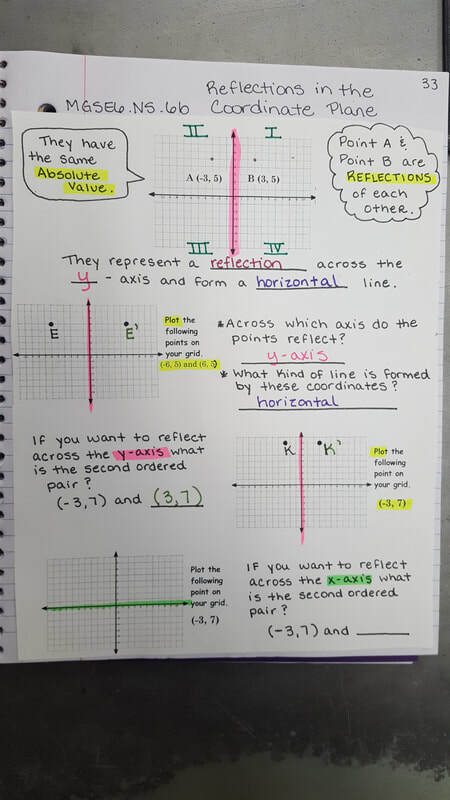 Then, we moved on to learning about Reflections in the coordinate plane. We didn't quite finish our notes, but so far it is going VERY well!! 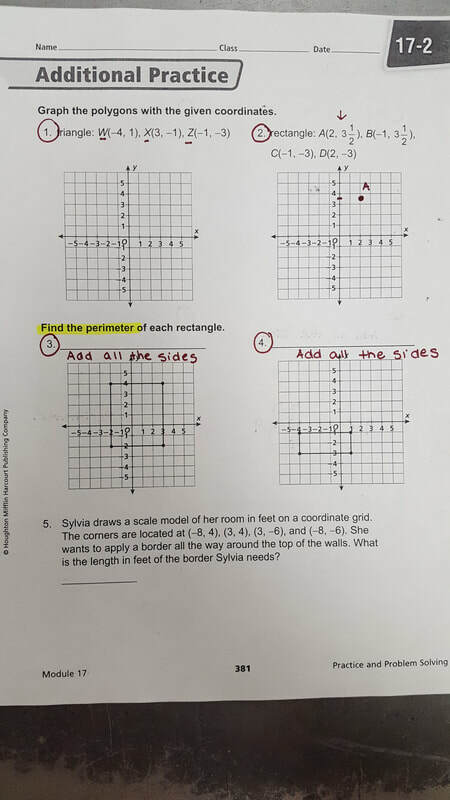 Today students continued learning about polygon's in the coordinate plane. Today we graphed more polygon's and found the distance between points along with the area and perimeter of those polygon's. 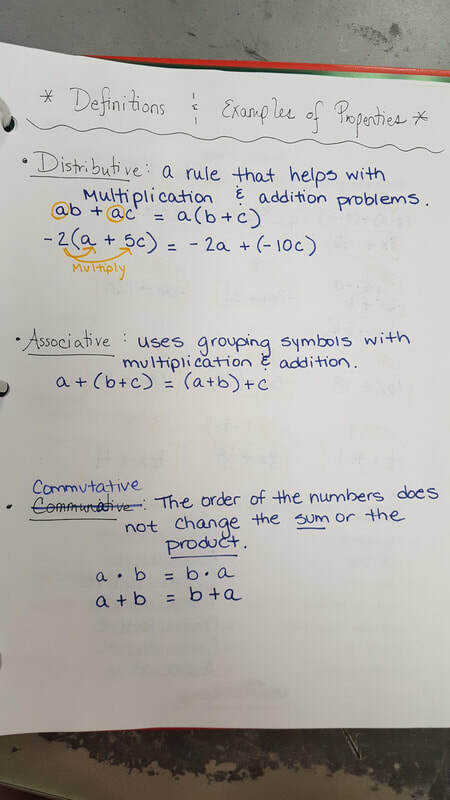 After notes, students worked independently on a practice paper. Many did not finish in the allotted class time. These papers are due in class tomorrow. 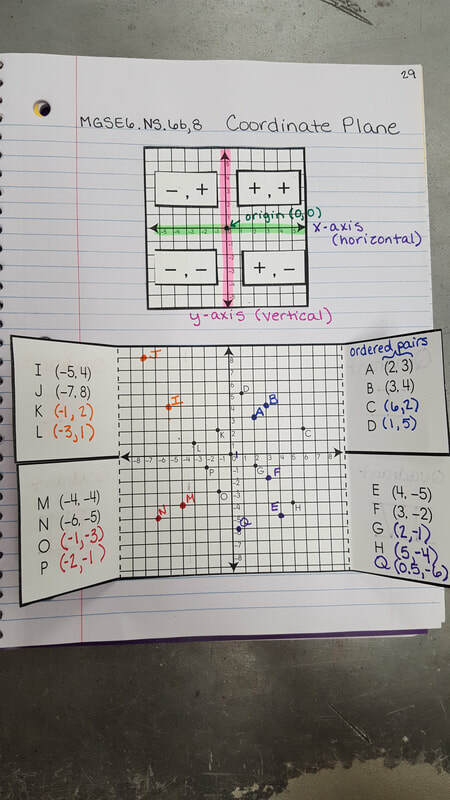 Today students glued in the "Coordinate Plane Review" sheet from yesterday into their notebooks on the back of the page with the "Coordinate Plane" on it. Then, students had some class time to work on their homework sheets. 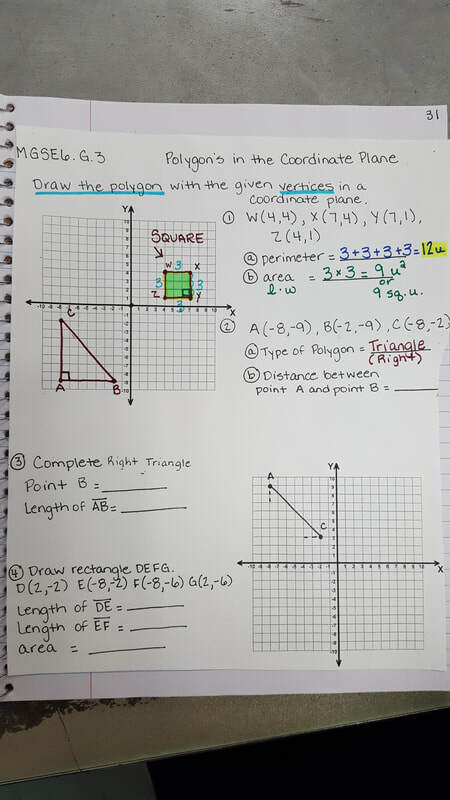 Afterwards, we watched the video below and glued in our next page of notes, "Polygon's in the Coordinate Plane". We began notes and only finished the first two problems. We'll finish these tomorrow. 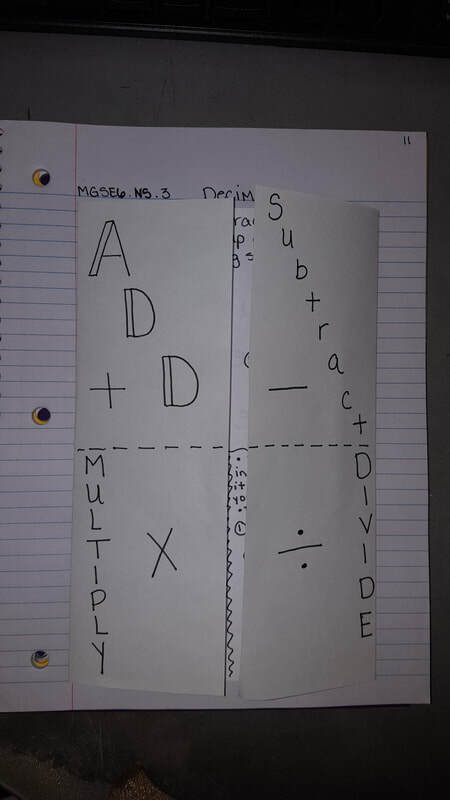 Today students finished their Coordinate Plane foldable. Then, they did a front/back independent practice sheet for 15 minutes of class time. After students finished we checked the paper in class and completed a more indepth sheet. We'll glue in the more in-depth sheet in our notes tomorrow! Today students finished their Integer's quiz. Then, we moved on to learning about the Coordinate Plane. 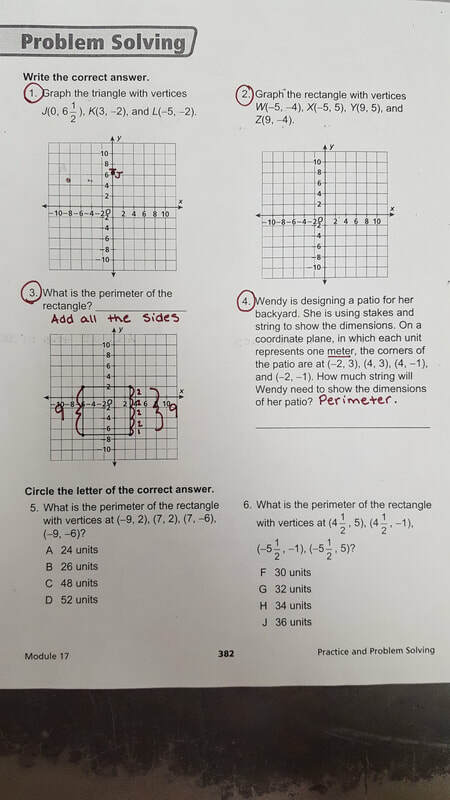 Students learned that Rene Descartes was the one who invented the coordinate plane. Then, we glued in a foldable and began working through it. Students received their homework sheet for next week today! Today we worked through our study guide together. Students received a copy of their study guides at the end of class yesterday. I was EXTREMELY pleased to find out that many students went home and began working through them last night!! My cup runneth over! 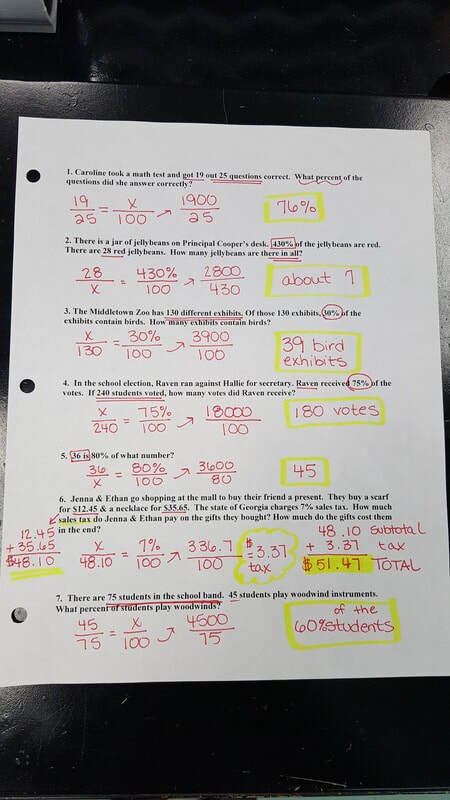 Students did so well working through this study guide and so well with integers that we went ahead and began our Quiz in class today. A few students didn't finish so they'll be given class time tomorrow to finish up. 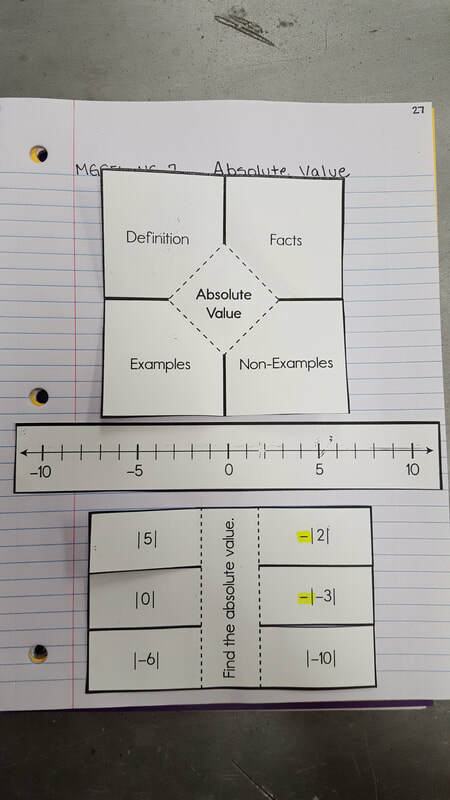 Today students continued learning all about Absolute Value. 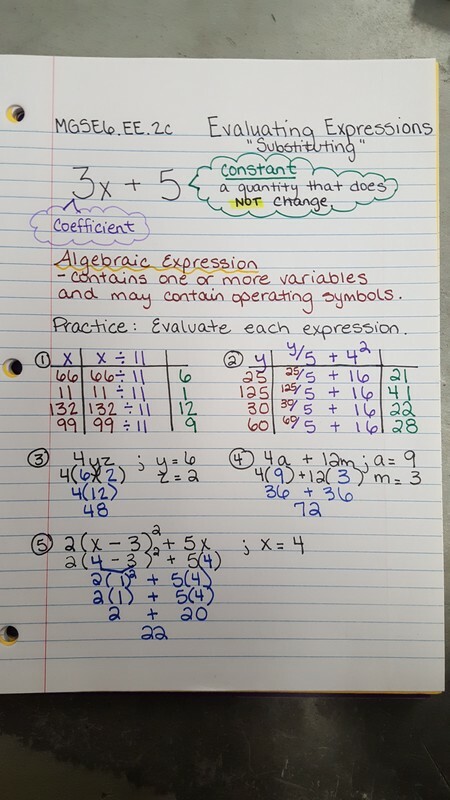 We expanded what we learned on Friday to include solving problems with Absolute Value. Students learned what to do when adding the negative absolute value of a number to the absolute value of another number. See notes below. 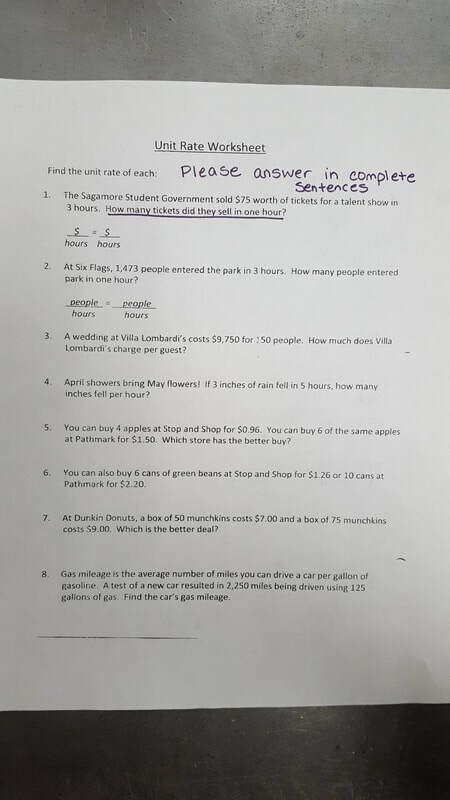 Afterwards, students were able to work alone, with a partner, or in a small group of 3 to illustrate their understanding of absolute value through their work on a GADOE performance task paper. The paper allows me to obtain insight into their depth of understanding on the content. No weekly homework sheet this week! YAY! 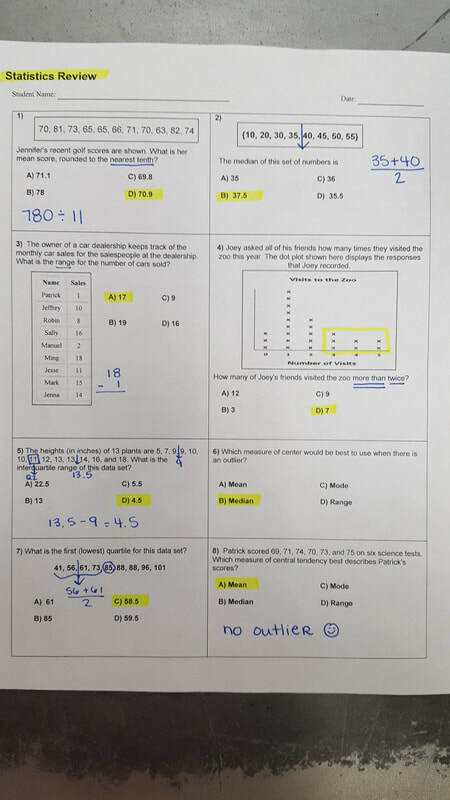 Students were sent home with a Study Guide for their Integer's Quiz on Friday. We will work through the study guide in class tomorrow. Today students were given about 5 minutes to finish up their weekly homework sheet. 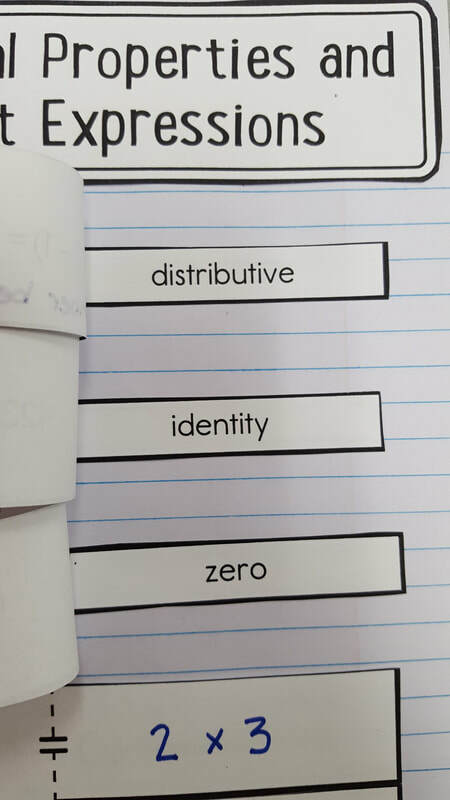 Then, we checked our homework sheet in class. 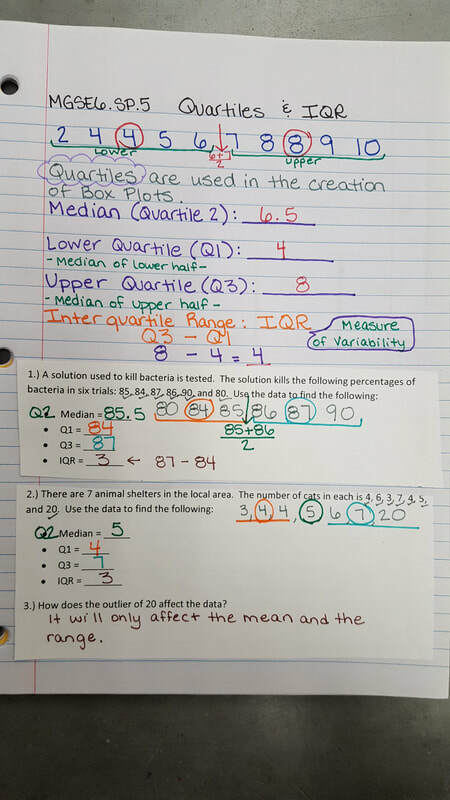 Afterwards, students completed a "Comparing & Ordering" integers practice sheet. It only took about 10 minutes for them to whiz through the sheet. I just wanted to double check for understanding. Then, we moved on to "Absolute Value". 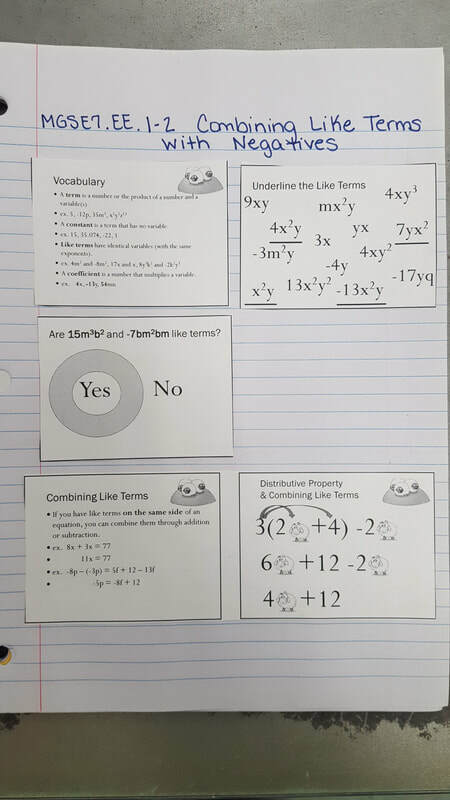 Students cut and pasted a neat foldable into their notebooks. 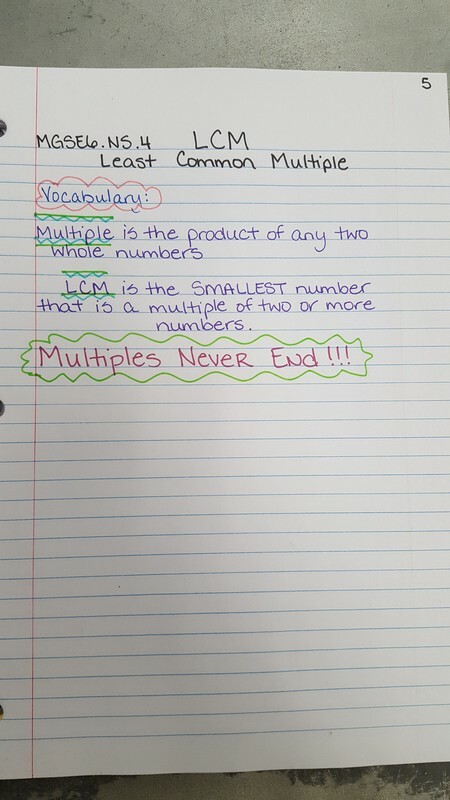 Then, we took notes over absolute value and learned all about it. 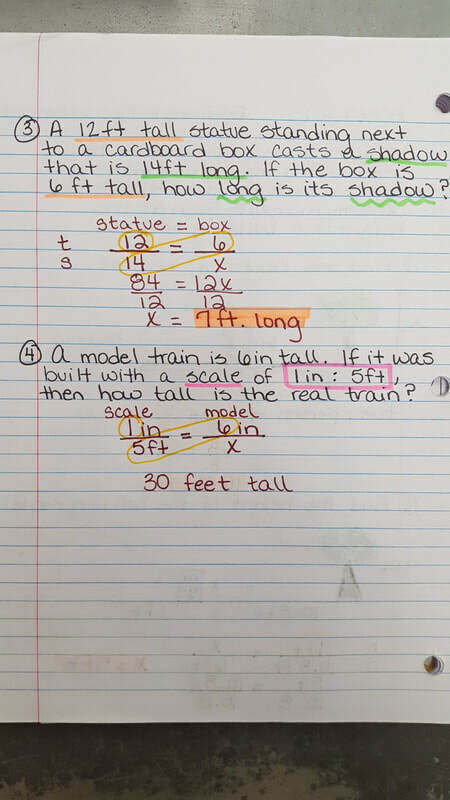 ​Monday we'll continue learning about absolute value. 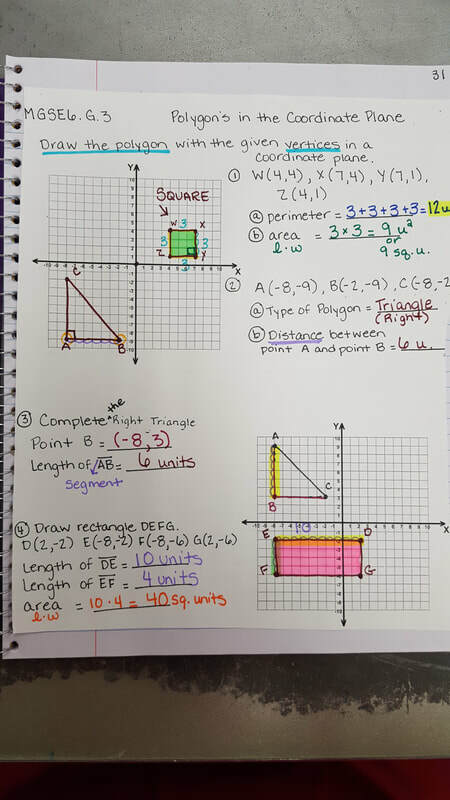 Today students worked on their homework sheet for the first 5 minutes of class. Then, they took their very first notes check quiz. Afterwards, we finished our notes over "Rational Numbers: Comparing & Ordering". Today students completed Textbook page 334 #11-19 in class. 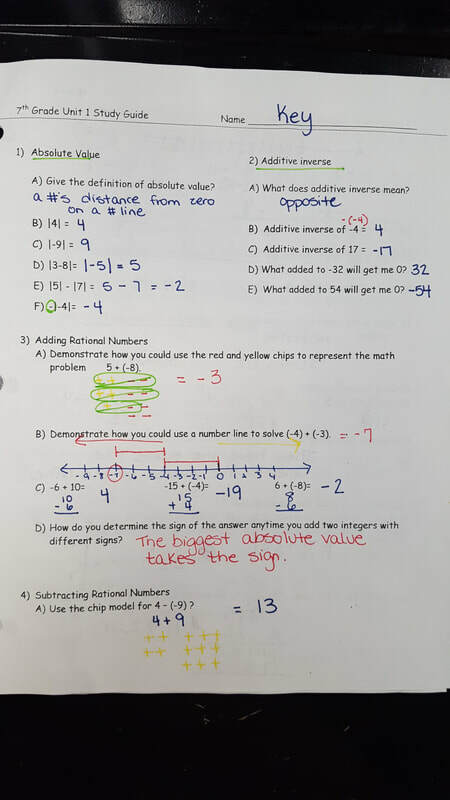 Then, we moved on to learning how and where to place rational numbers on a number line. 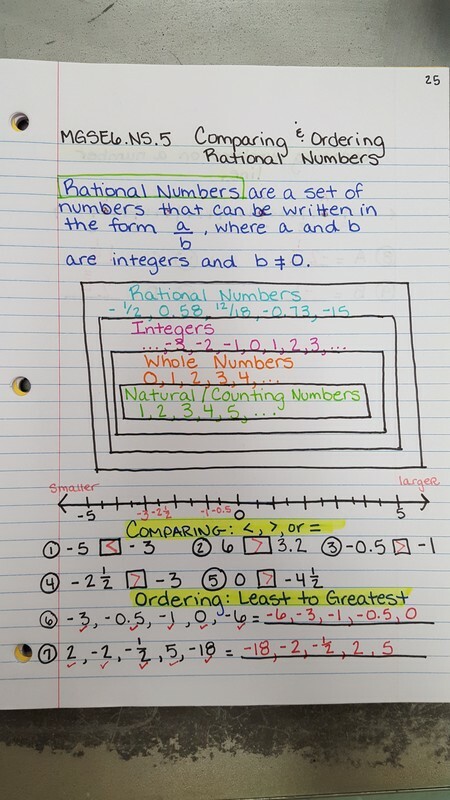 After working through an interactive flipchart students began notes over "Comparing & Ordering Rational numbers". Today students received their weekly homework papers. 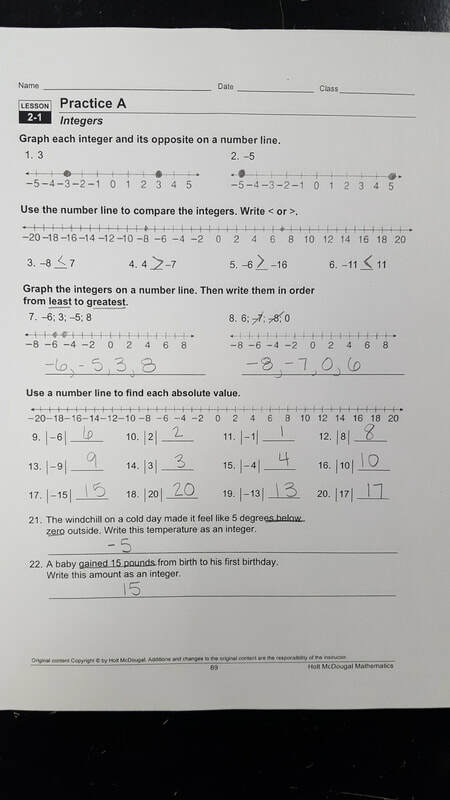 Then, we moved on to our next unit over "Rational Numbers", also known as "integers" unit. Today we learned all about Integers in the real world & their opposites. Students took notes from a Flipchart. Today students turned in their homework and their study guides. Then, they took their first Unit Test. I still have 3 students to take their test. Once they all finish I'll get them graded and returned. Today we wrapped up our Unit 1 with Dividing fraction word problems. Then, we went over our Study Guide. Homework Sheet is due tomorrow!!! Today we finished our Dividing Fraction notes and then students worked through several practice problems with a partner for 10 minutes. Then, we went over the first 3 problems at the top of the paper together. Students need to TRY their best to finish this paper at home tonight. It WILL NOT be for a grade. 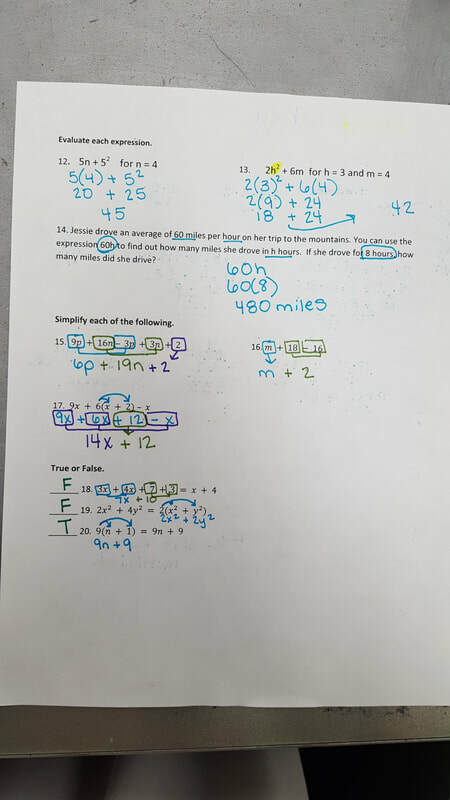 ​Then, we moved on to Dividing fraction word problems. 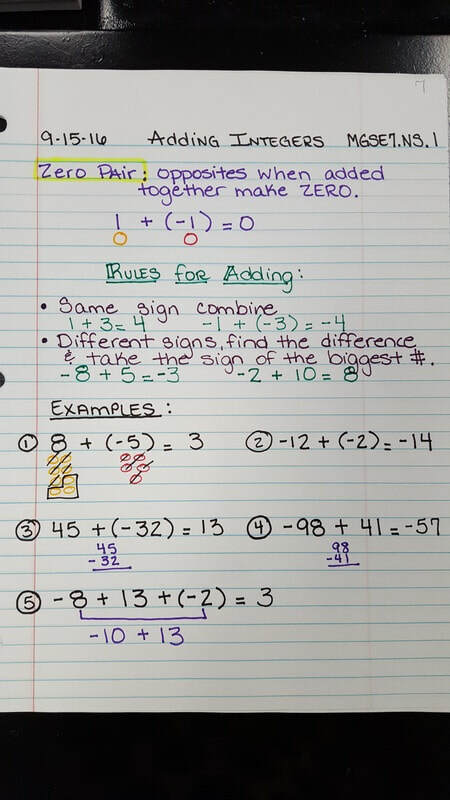 Today we checked and went over #1-6 from Multiplying Mixed number & fractions. Then, we trimmed and pasted it into our notebooks. Then, we moved on to learning how to divide fractions. Then, we reviewed multiplying fractions and mixed numbers. Many seemed to recall this from elementary. 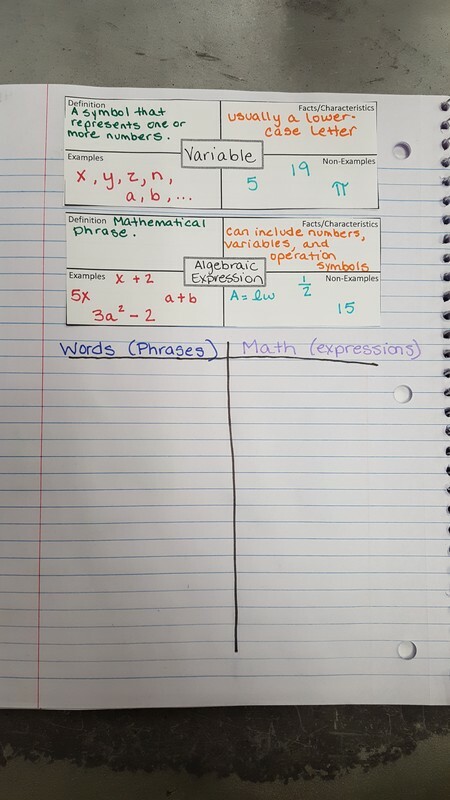 After notes, students received a practice sheet to complete. We only had about 5 minutes left of class to get 6 problems finished. Therefore, students need to complete #1-6 at home tonight. Today we spend a rather lengthy time checking over this weeks homework. However, it is better to ask questions and fully understand than not to ask questions and be lost. 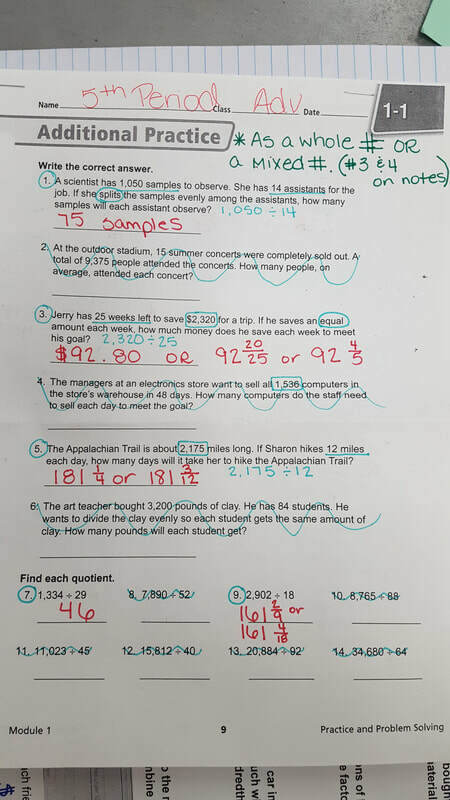 Then, we went over all the answers to the 4 Real world decimal word problems. Students did a phenomenal job with these!! Today students finished their long division practice and we went through and checked every problem. 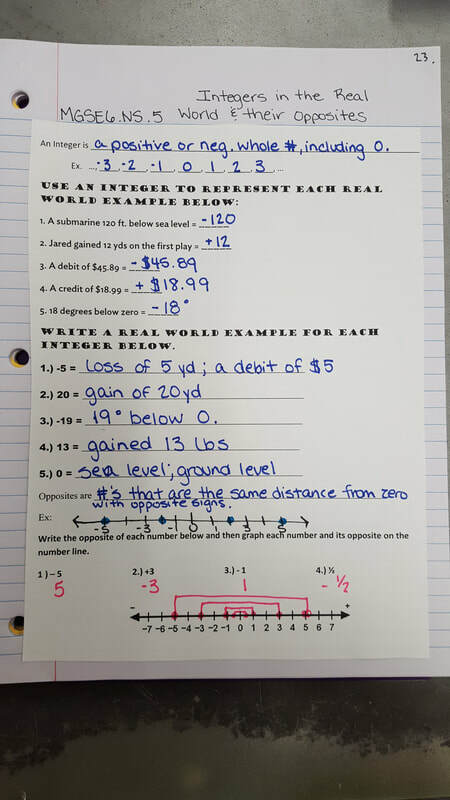 Then, we pasted tomorrow's notes over REAL WORLD DECIMALS into our notebooks. Students are to complete the 4 real world decimal problems tonight. 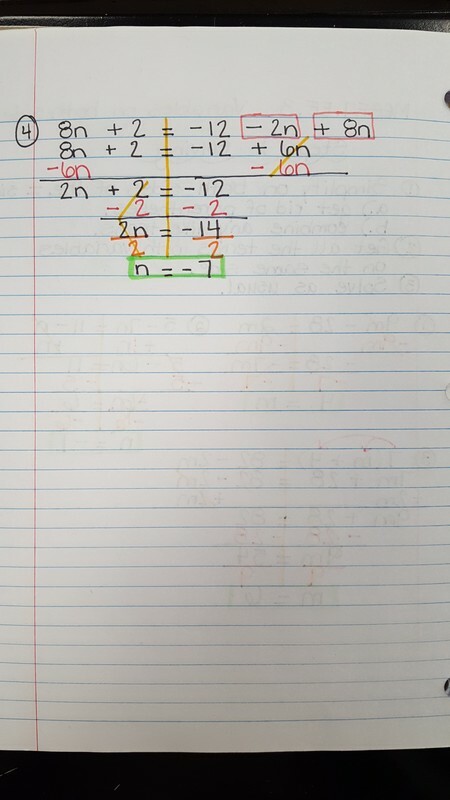 Today students continued practicing long division. 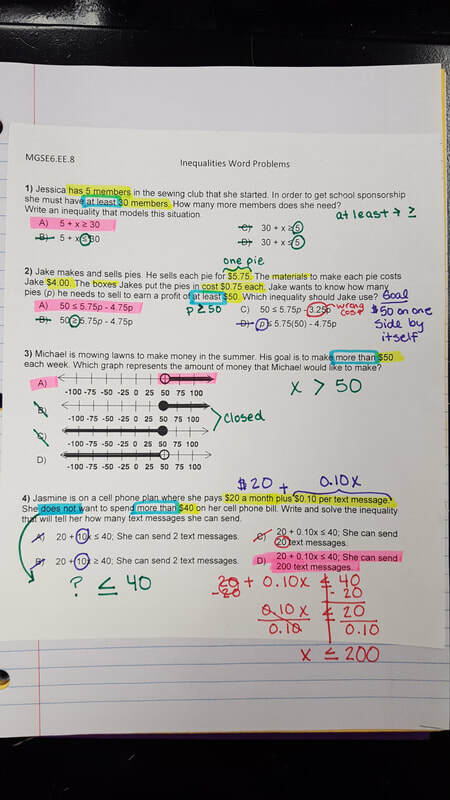 They began working through several REAL world long division problems with a partner. We'll finish these tomorrow & check them. Then, we'll move on to Real World Decimals. Today students received their homework paper for this week (purple paper). 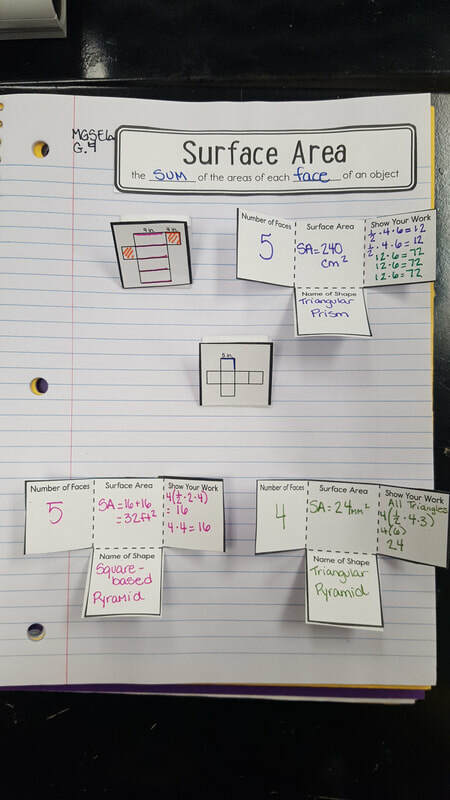 Then, we quickly reviewed the decimal foldable from last week. Afterwards, we moved on to long division. We'll practice decimals and long division for the next few days. 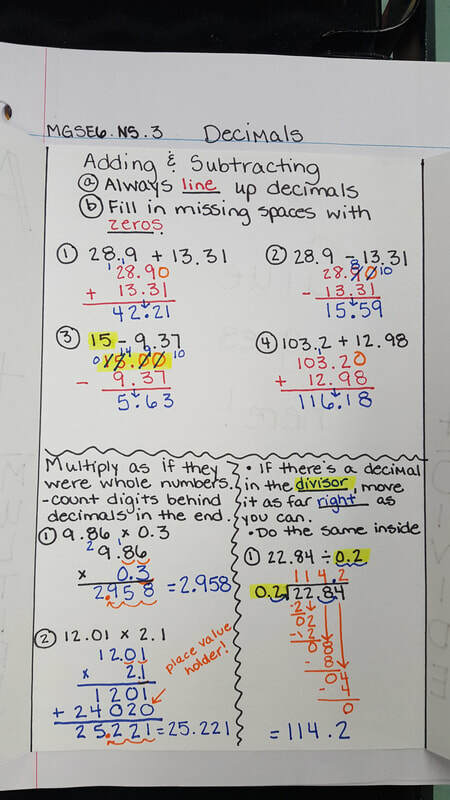 Students should have the decimal practice sheet from class today completed when they come in tomorrow. Today students turned in their weekly homework sheet. Then, we finished notes in our decimal foldable. Then, since there were only 5 students today due to the Advanced Science Field trip they worked through 3 Study Island assignments in Mrs. Stover's room. Today students took a brief quiz over GCF and LCM. 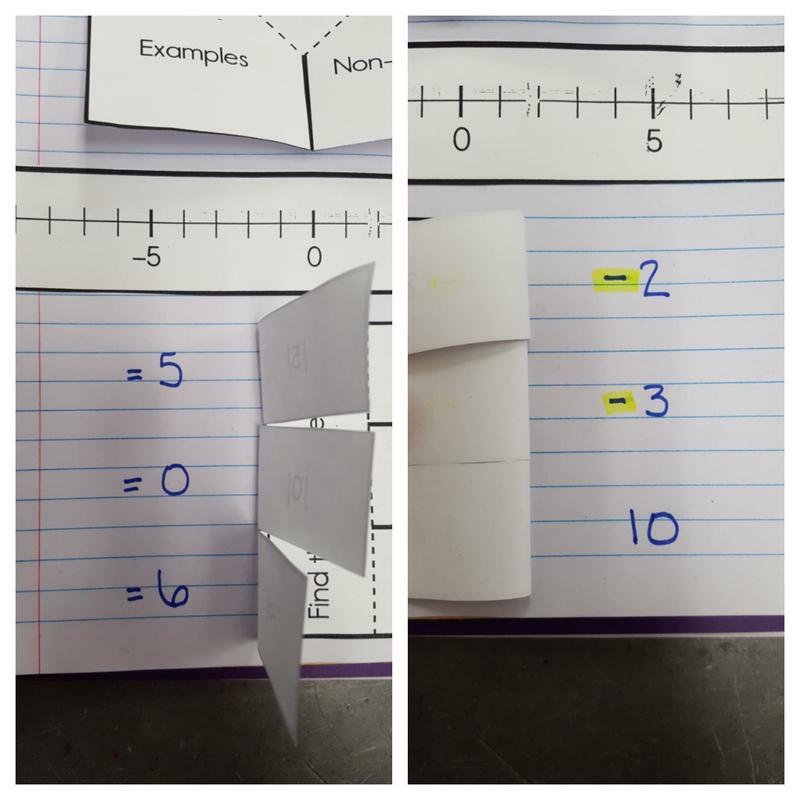 Then, they glued in a "Decimals foldable" into their notebook. My field trip people are to turn their homework in first thing in the morning. Many turned it in today. As for the 5 that will be in class tomorrow....homework is due tomorrow! 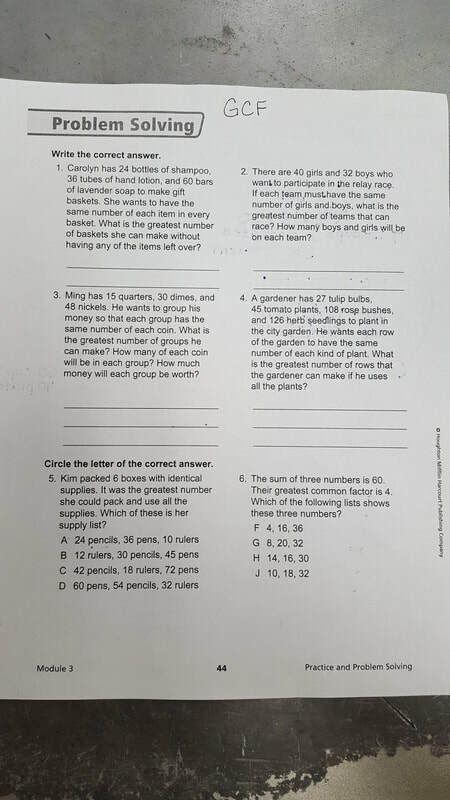 Today we went over and checked our Word problems sheet in class. 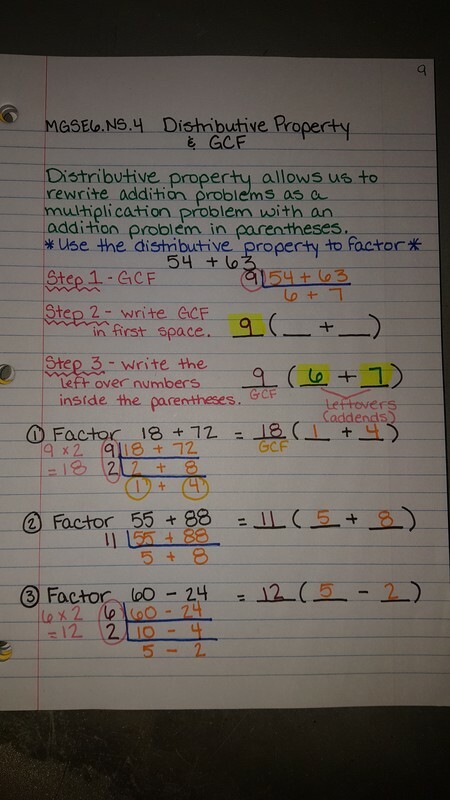 Then, students learned how to illustrate the sum of two numbers through GCF and the distributive property. 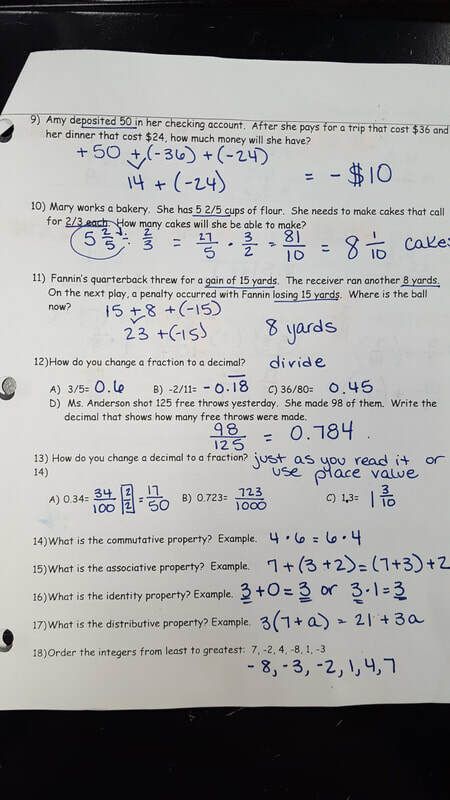 Tomorrow we'll have a brief 10 question quiz over GCF, LCM, and the distributive property notes. Today we took about 3 minutes to work on tonight's homework assignment. A few people still have not turned in their GCF/LCM practice paper from Friday. It was officially late today! 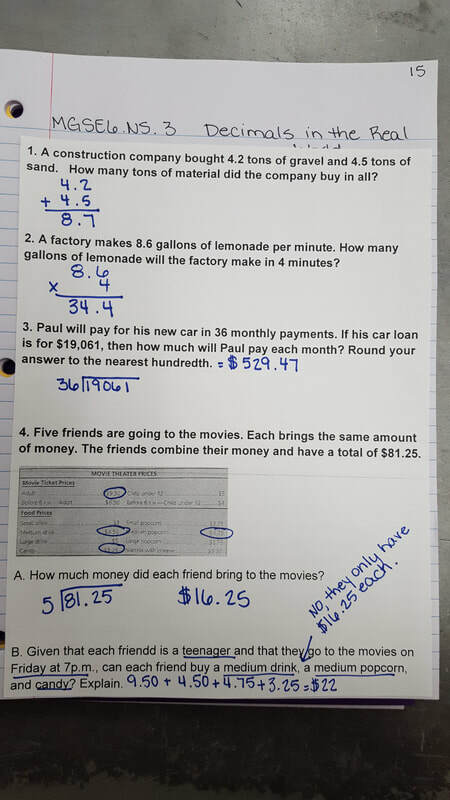 Then, we finished our last "Real World Applications" problem from yesterday. Afterwards, students were able to get with a partner to complete the word problem practice over GCF and LCM. It's a tough one. Many did not finish and will need to complete the rest of this at home tonight. See a picture of the paper below. 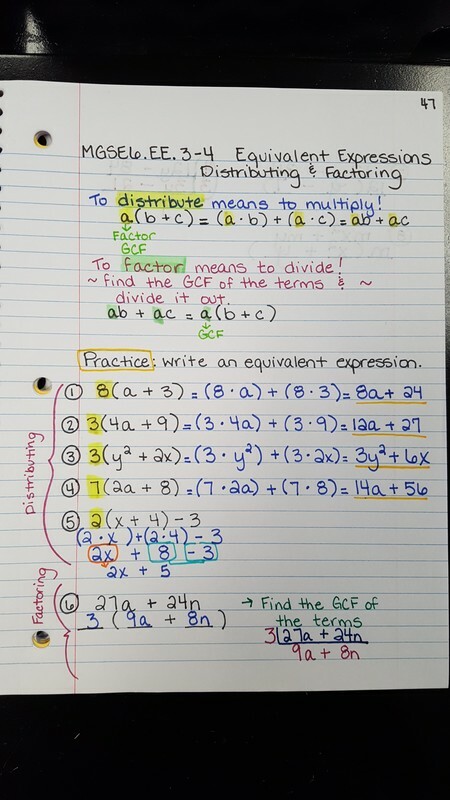 Tomorrow, we'll go over how to use GCF and the distributive property together. Brief 10 question QUIZ on Thursday over GCF and LCM. Study your notes!!! Today students received their very first weekly homework sheet. We went over how to complete it and how to use our class time wisely. Then, students worked through several GCF/LCM Real World Applications. We have one more example to finish tomorrow. Then, we'll practice what we've learned. 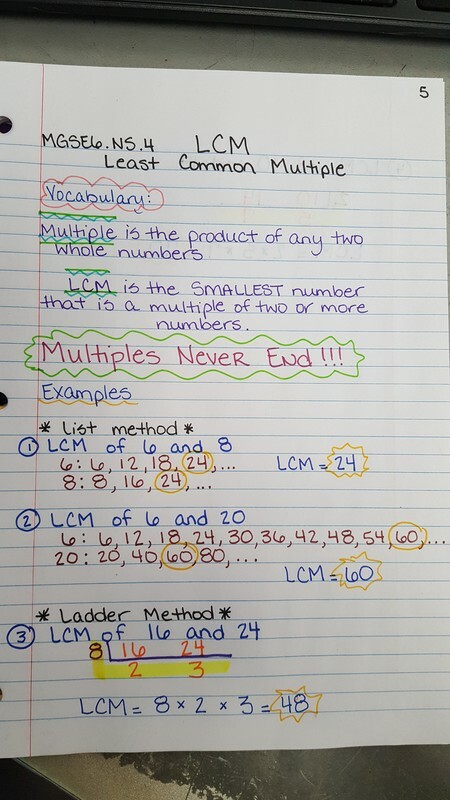 Today students finished notes over LCM. Then, we completed the front of the handout from Wednesday over GCF. 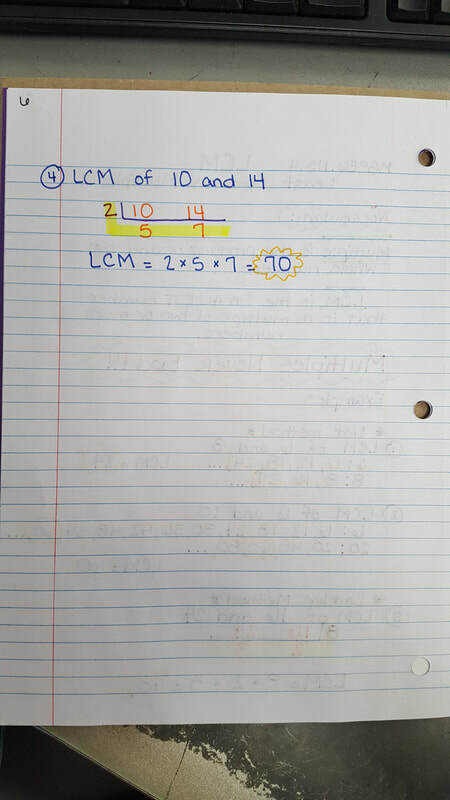 Then, students were given the remainder of class to complete the back side of the handout over LCM. There were a few who did not finish...I'll give about 10 minutes of class time on Monday to finish up. Today we continued learning how to find GCF through the use of the Ladder method. We added 2 more examples to our notebook on page 4. 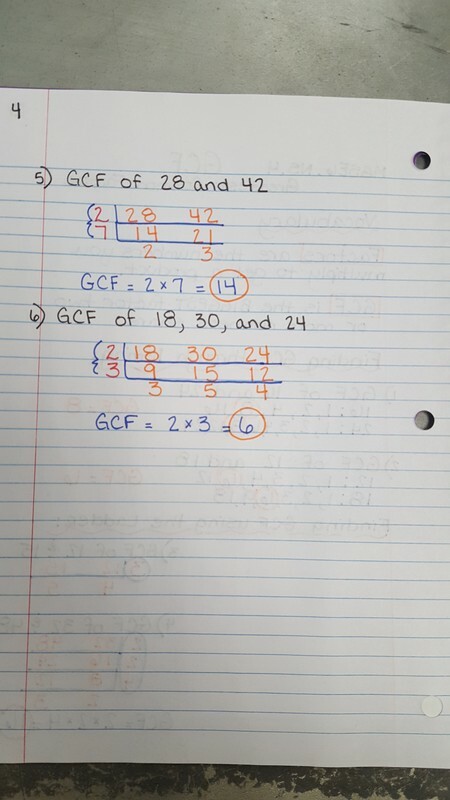 Then, students were given 10 minutes of class time to work through some GCF practice problems. They need to have 8 of the GCF problems completed by the start of class tomorrow. We'll finish the remainder of the paper in class tomorrow. Then, we moved on to LCM. After we watched the video posted to the side students began notes over LCM. We'll finish these tomorrow as well.